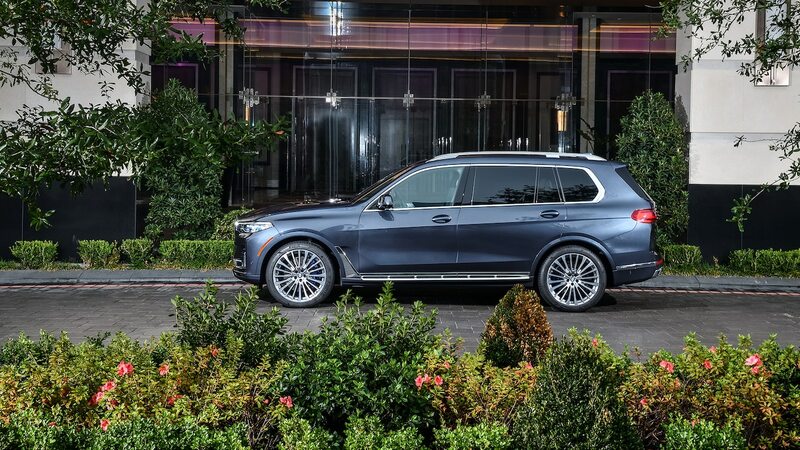 Ultimately, though, worldwide customer demand for a bigger BMW won out, and the X7 is here. 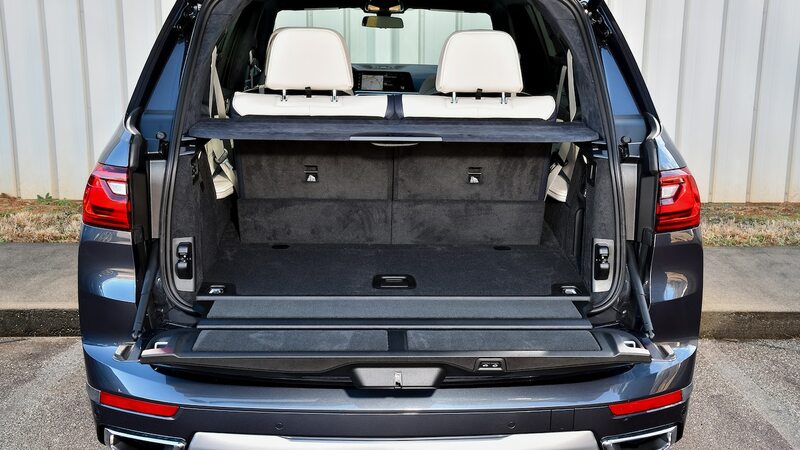 It’s also undeniably large. 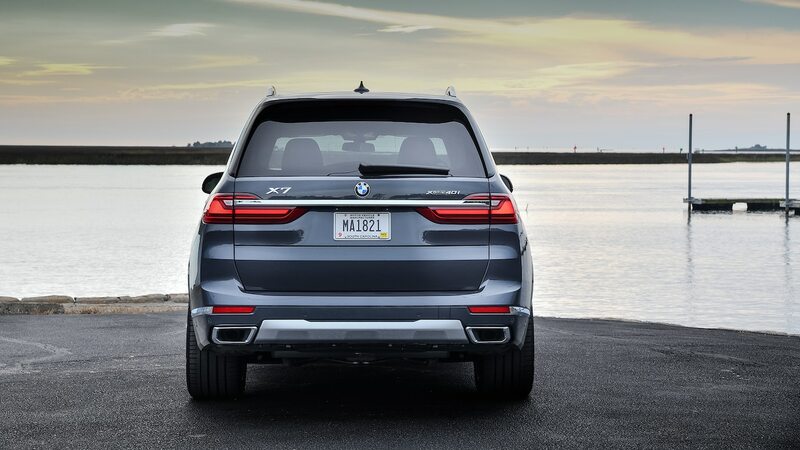 Walk past one in the parking lot, and there’s no mistaking it for an X5. 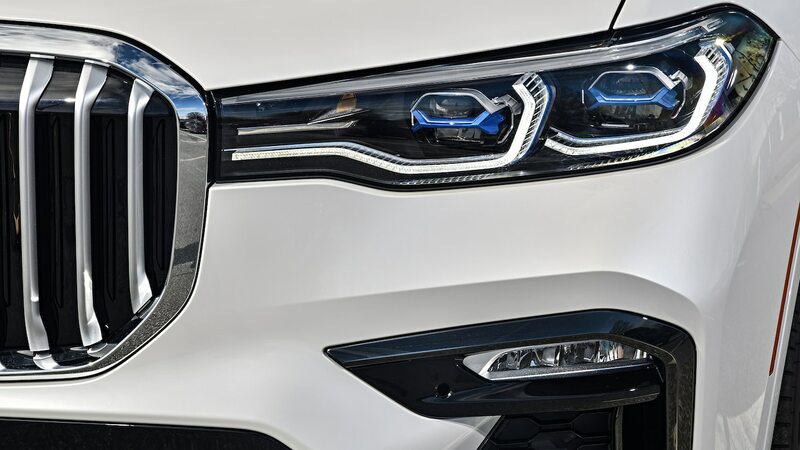 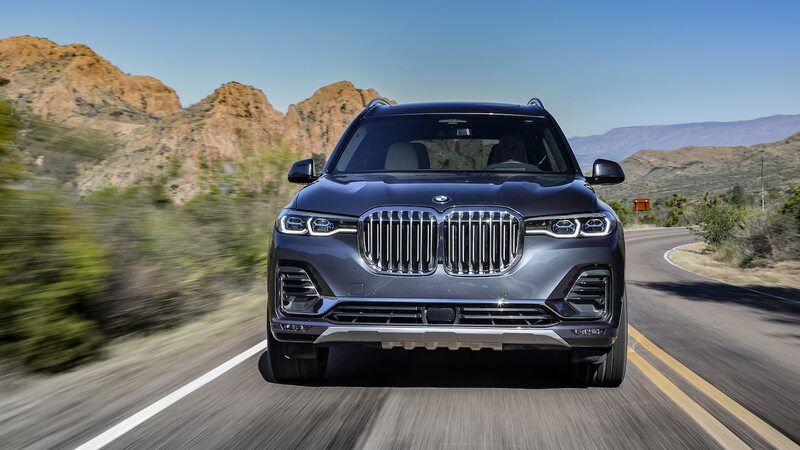 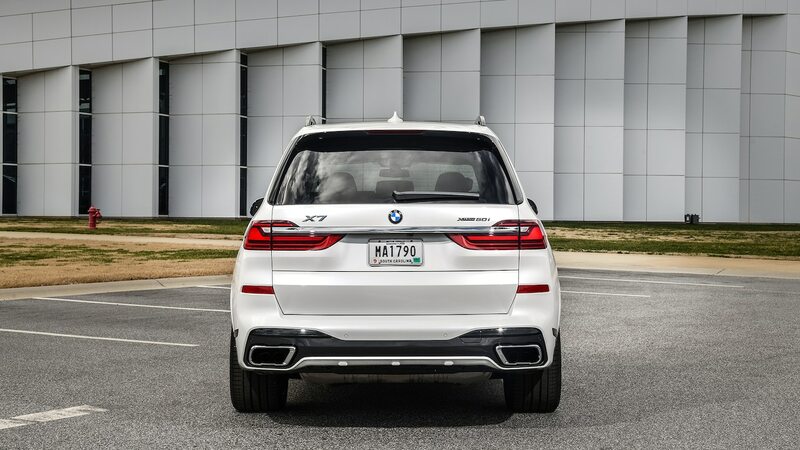 The X7 is clearly a BMW from every angle, but the designers did an impressive job of using a familiar design language in a way that emphasizes the X7’s size. 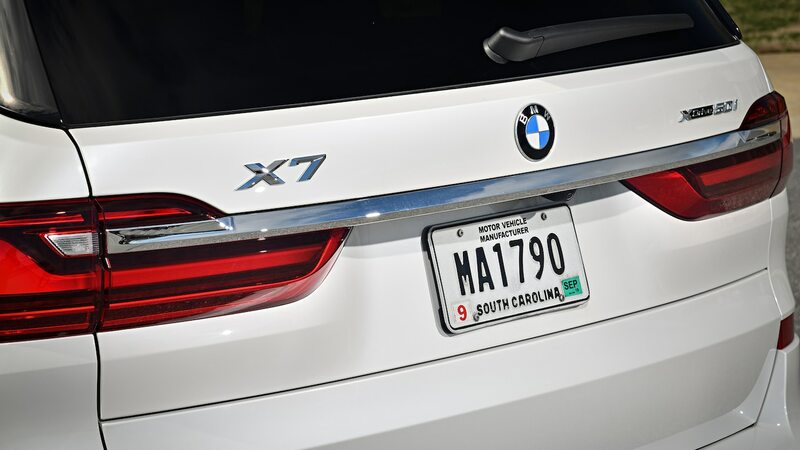 Much like the recently updated 7 Series, the X7 also looks better in person than it does in some photos. 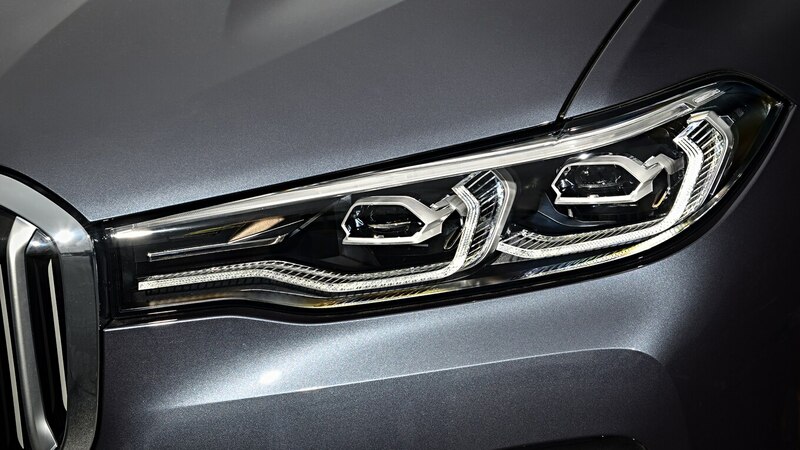 That said, it still comes up short of looking attractive or even handsome. 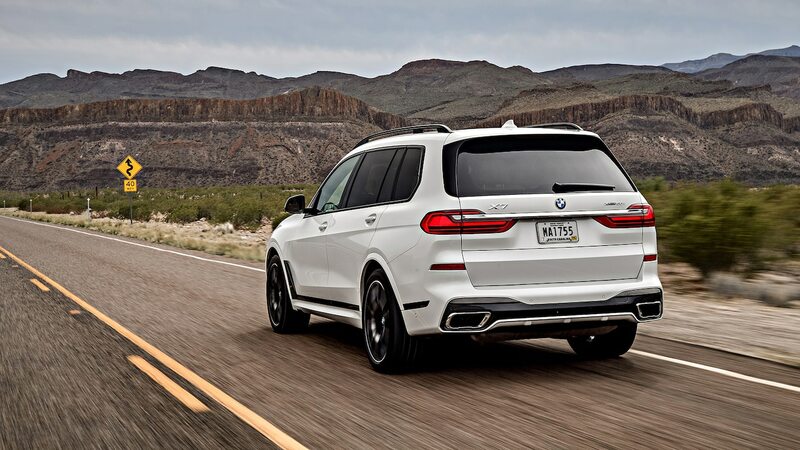 Mostly, it just looks big and BMW-y. 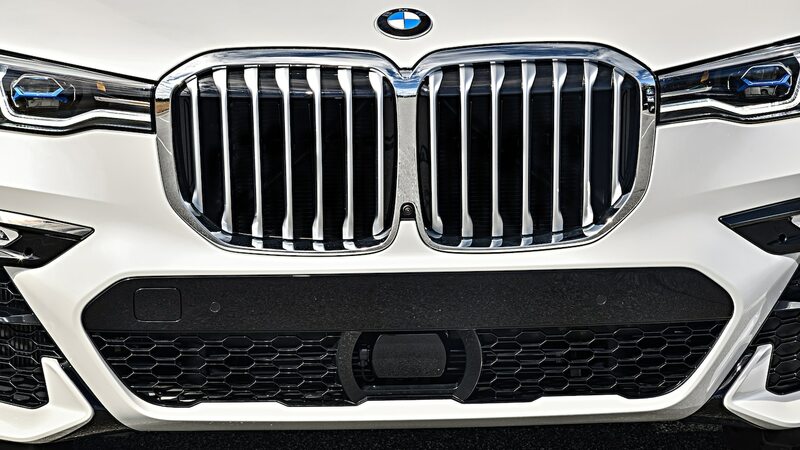 The same can also be said about the massive grille that’s attracted so much attention. 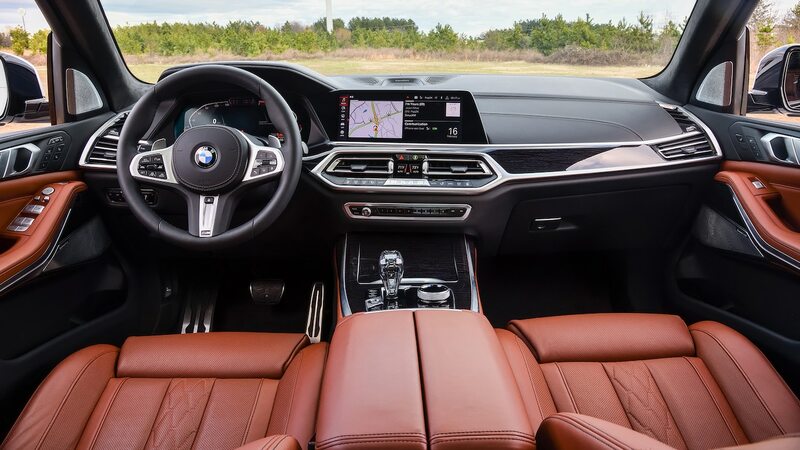 Despite being as tall as my forearm is long (and yes, I did actually check that), it’s been integrated into the design of the car better than photos suggest. 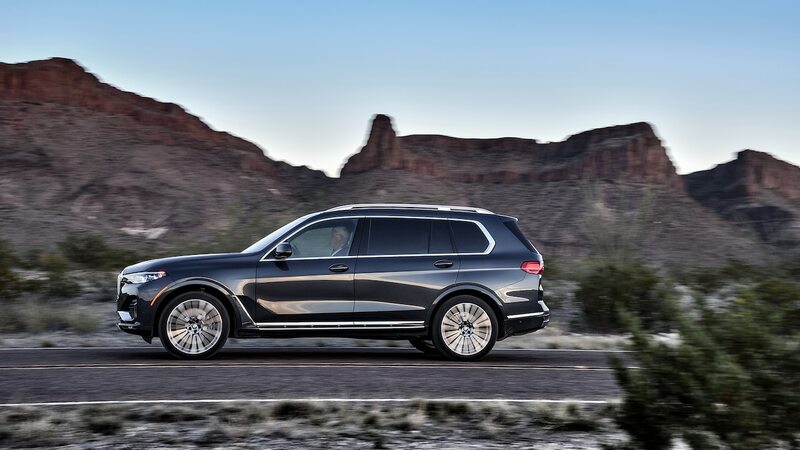 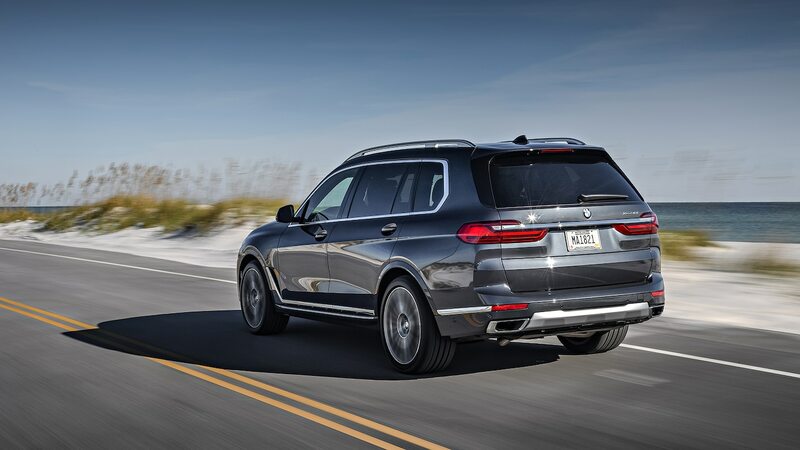 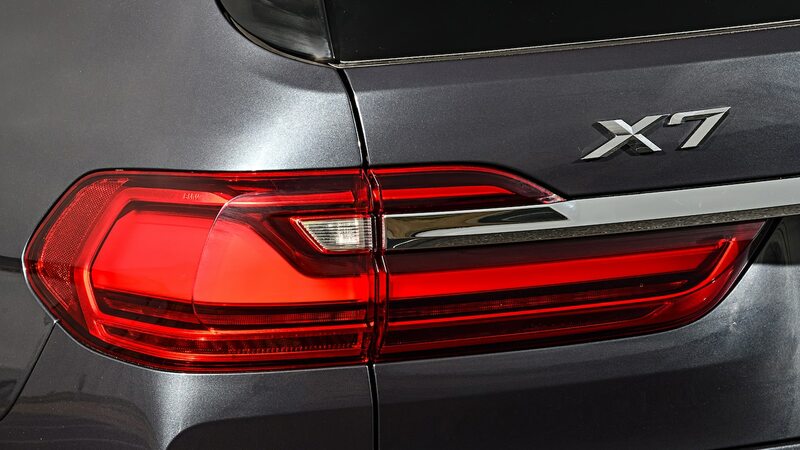 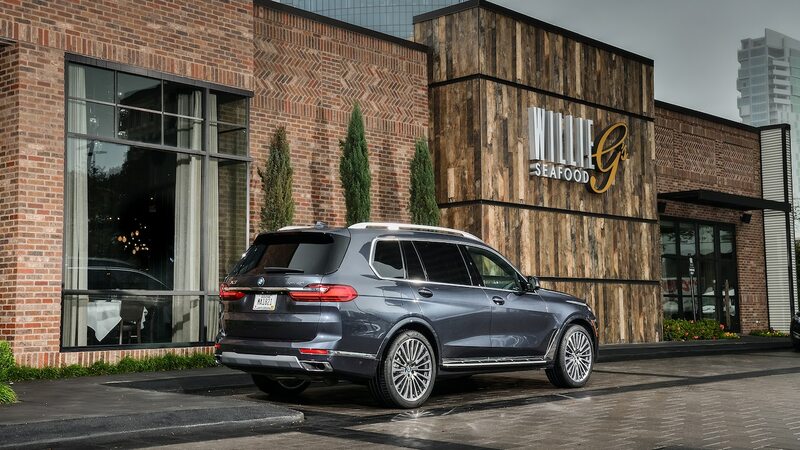 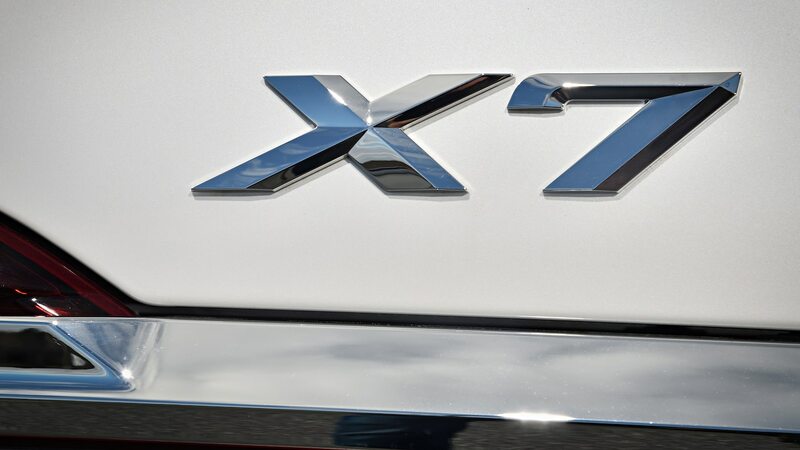 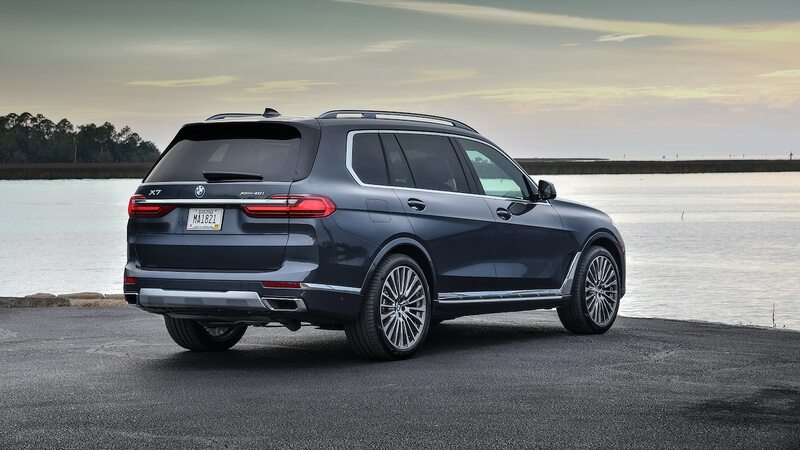 But if you want a full-size SUV that’s truly stylish, the X7 probably isn’t for you. 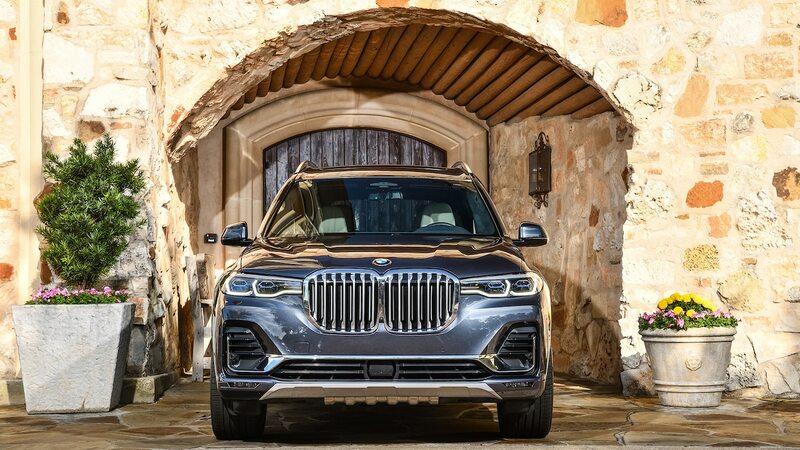 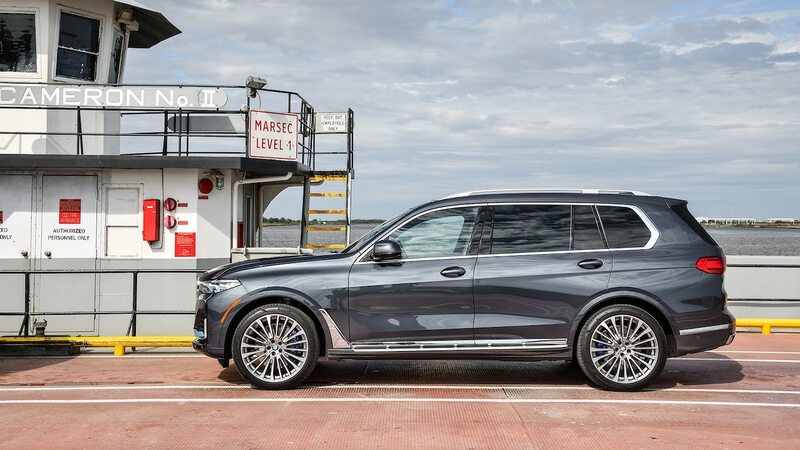 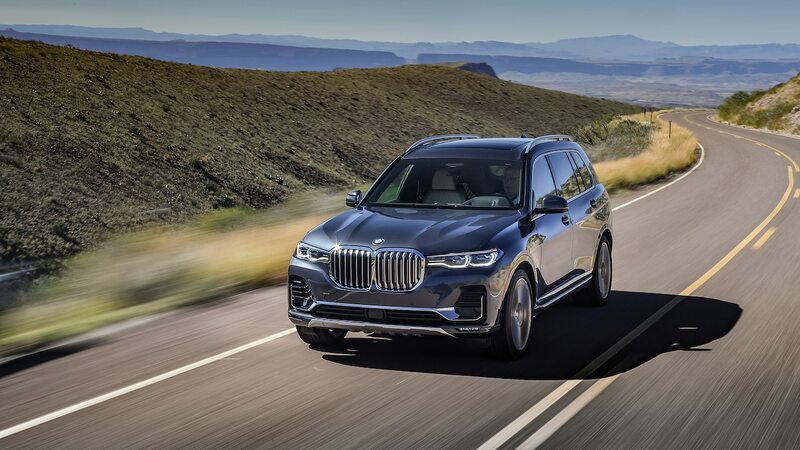 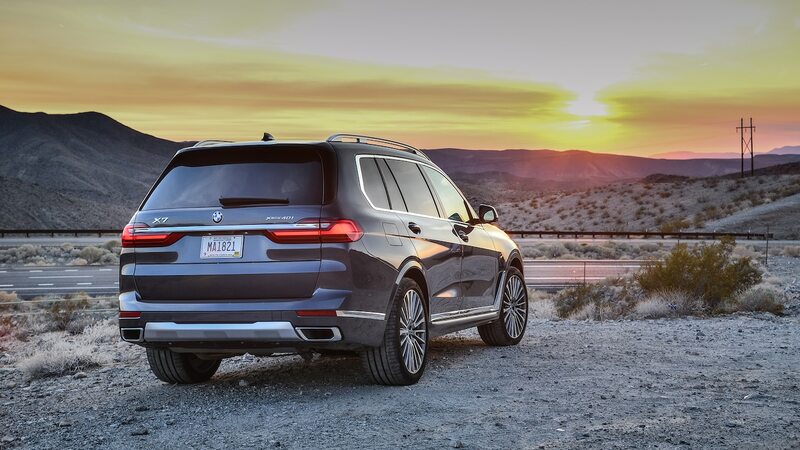 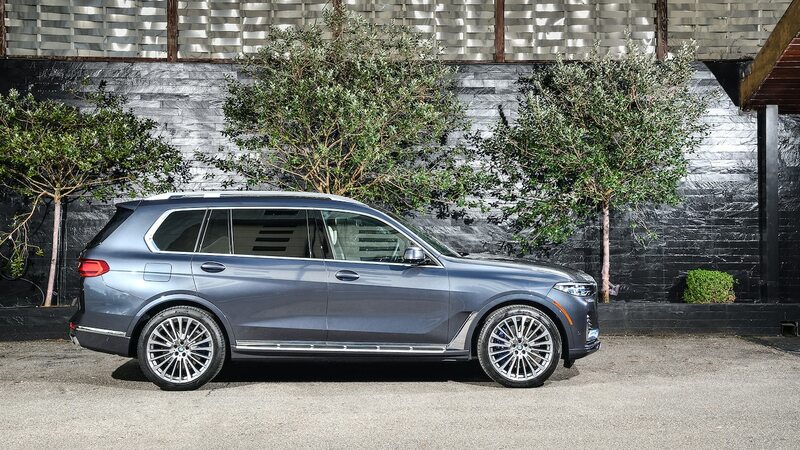 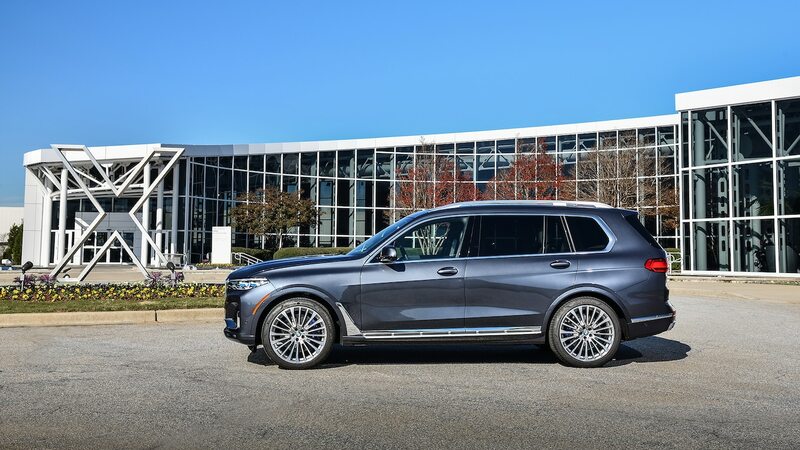 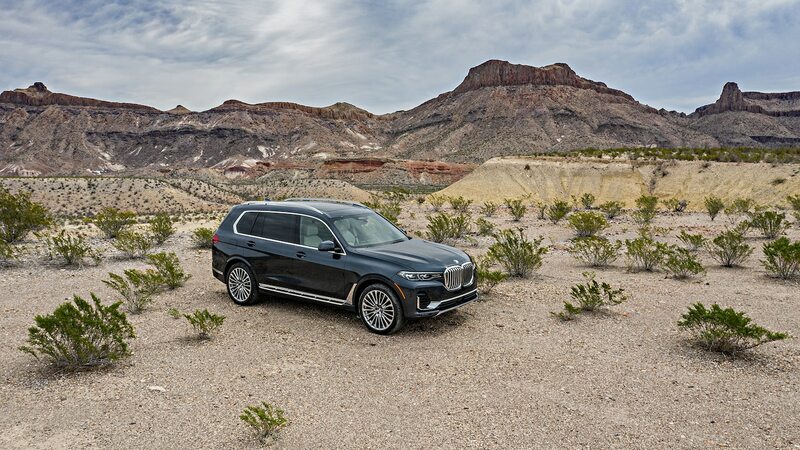 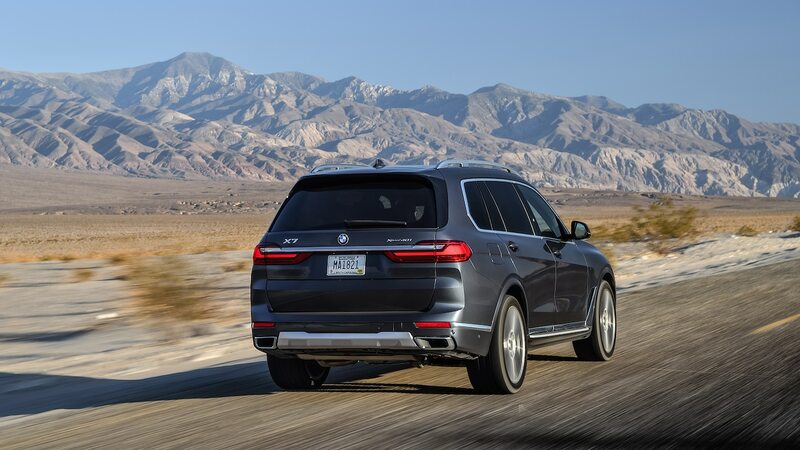 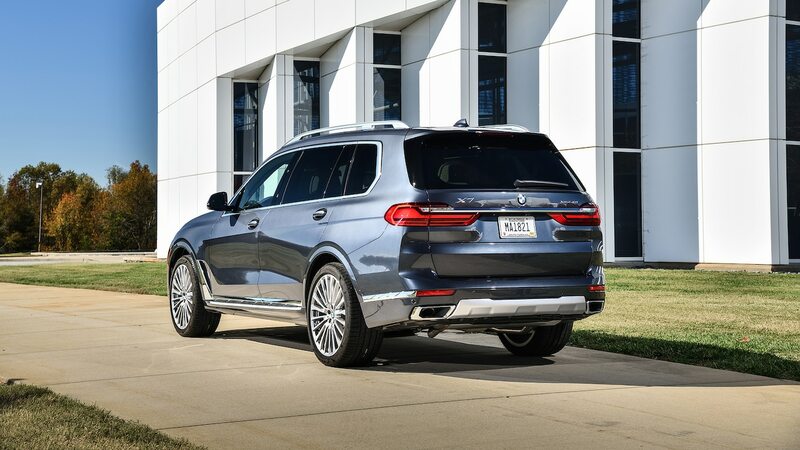 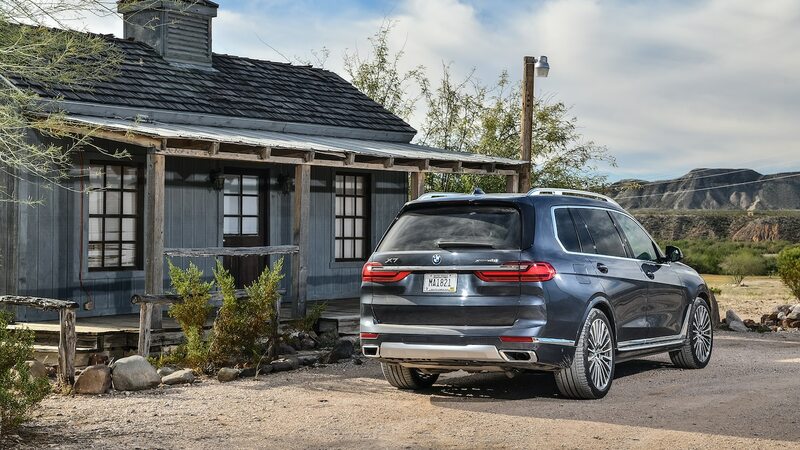 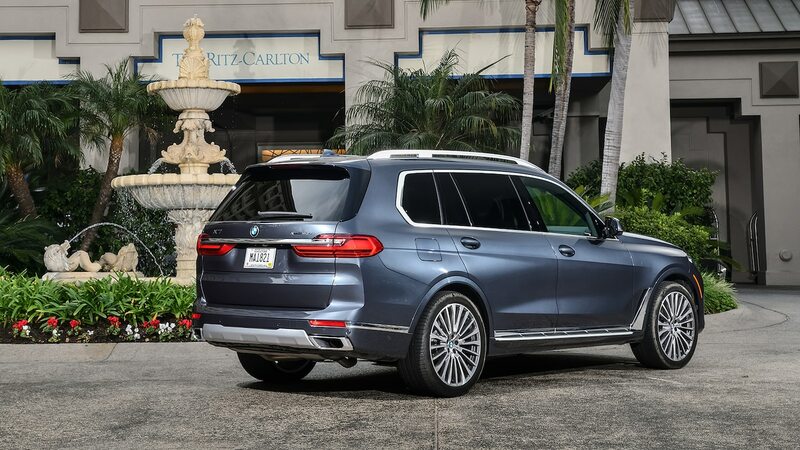 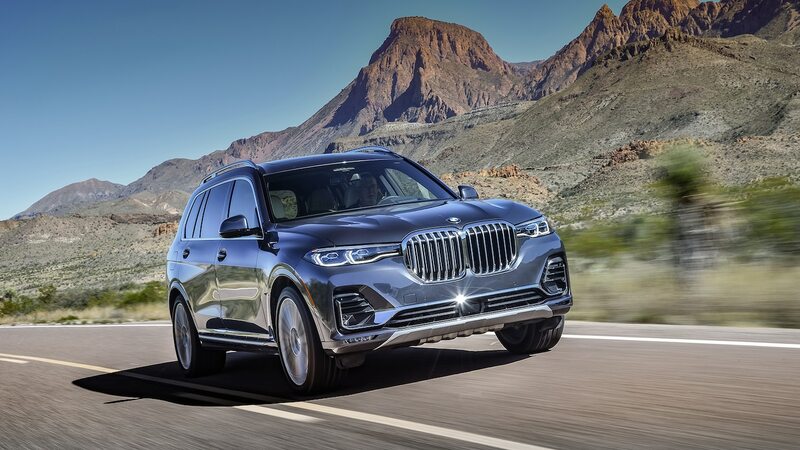 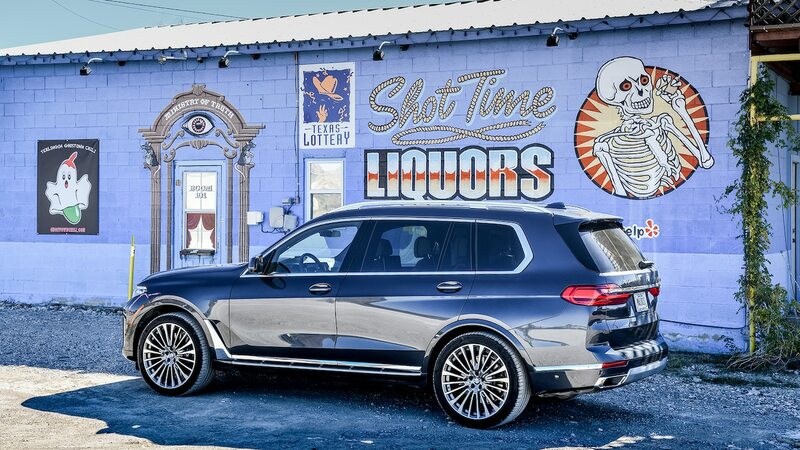 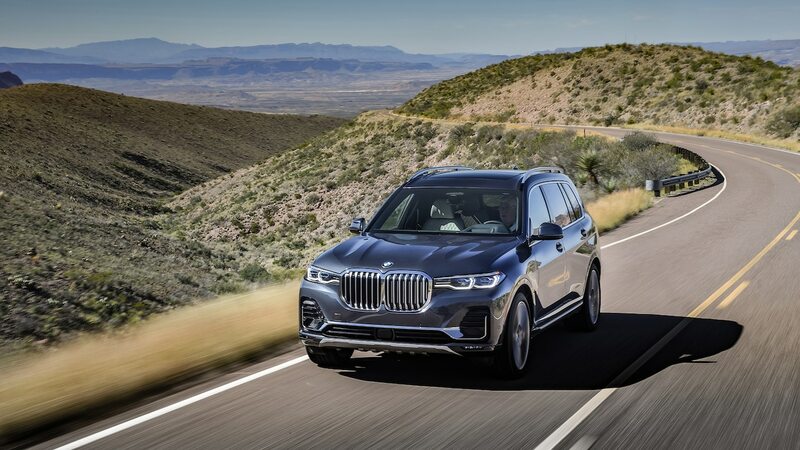 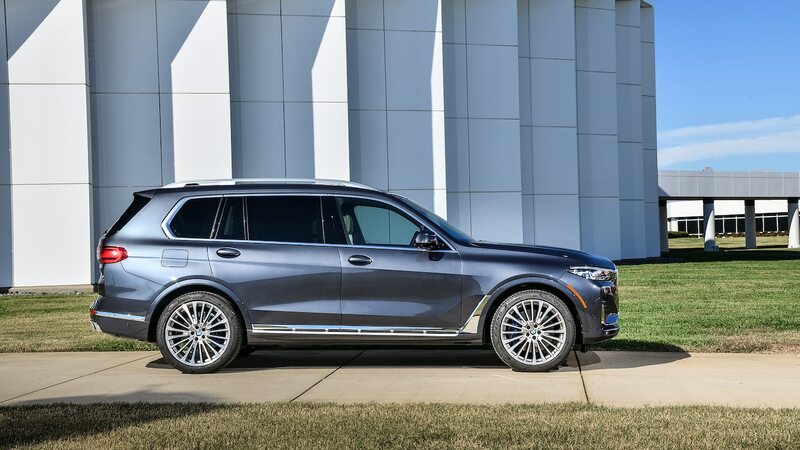 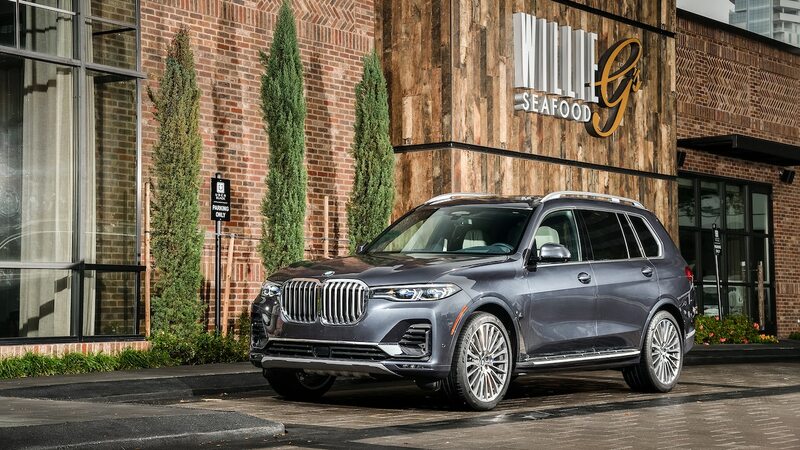 It’s also possible I’m being hard on BMW here because the general public is much more interested in the X7 than I expected. 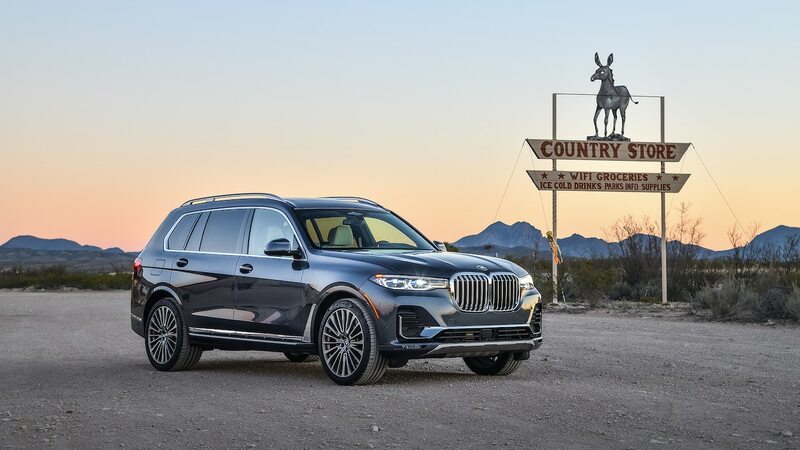 You’d think a big, comfortable family hauler would be more or less anonymous, but the X7 earned a shocking number of stares, thumbs ups, and questions from various people we ran into. 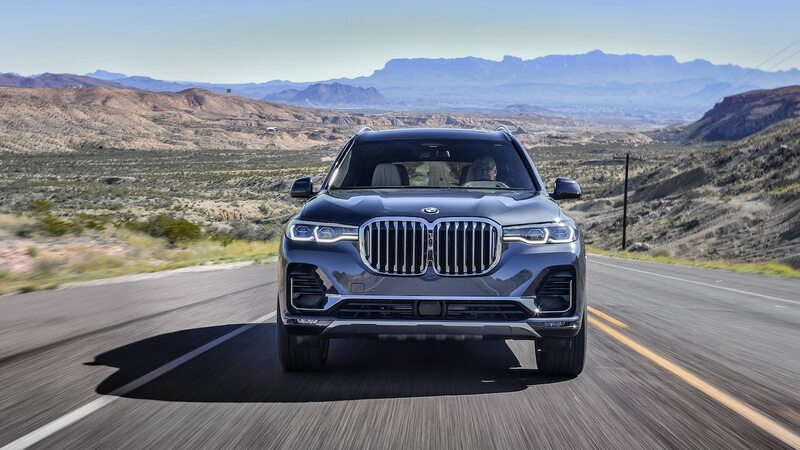 As a 30-year-old married guy with no kids, the X7’s look may not be my cup of tea, but clearly, there’s some real interest here. 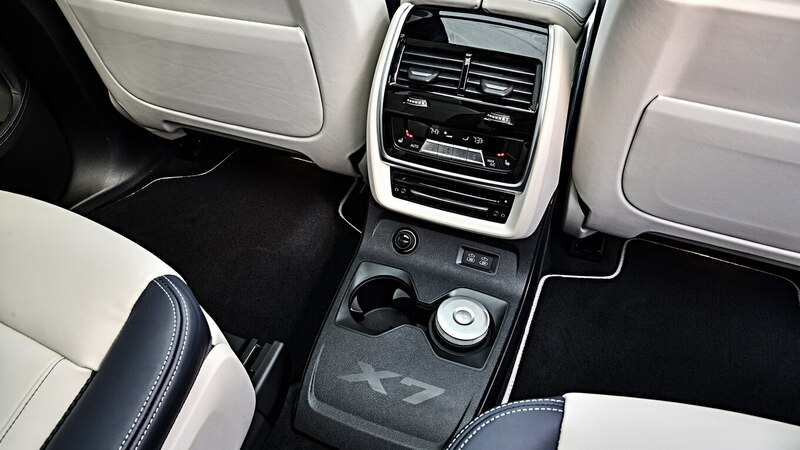 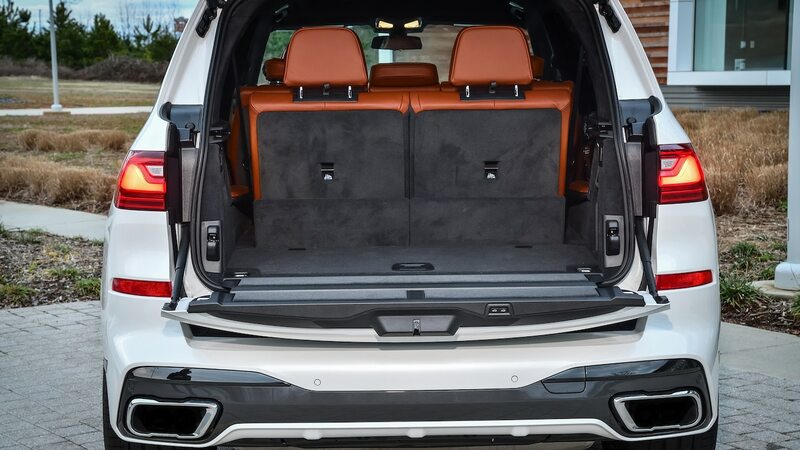 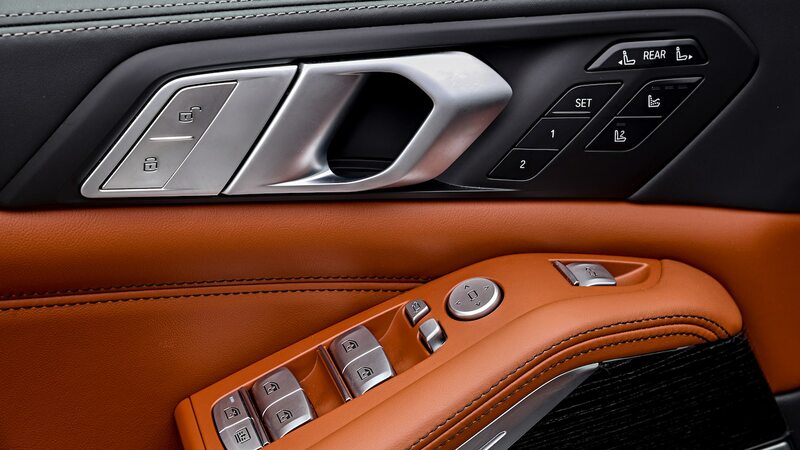 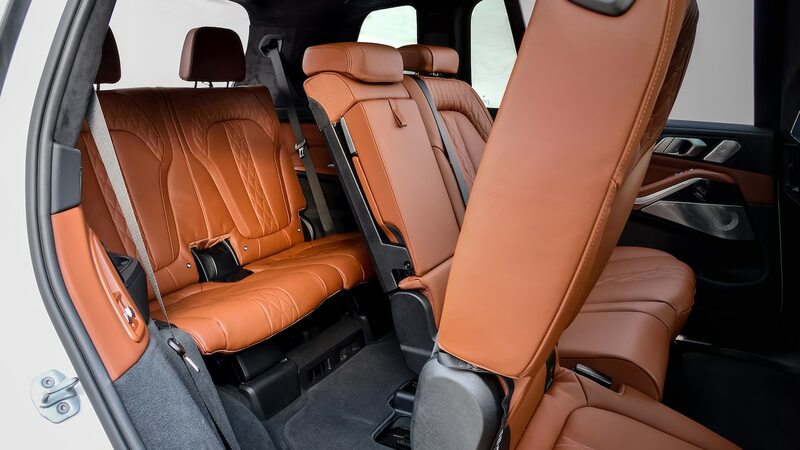 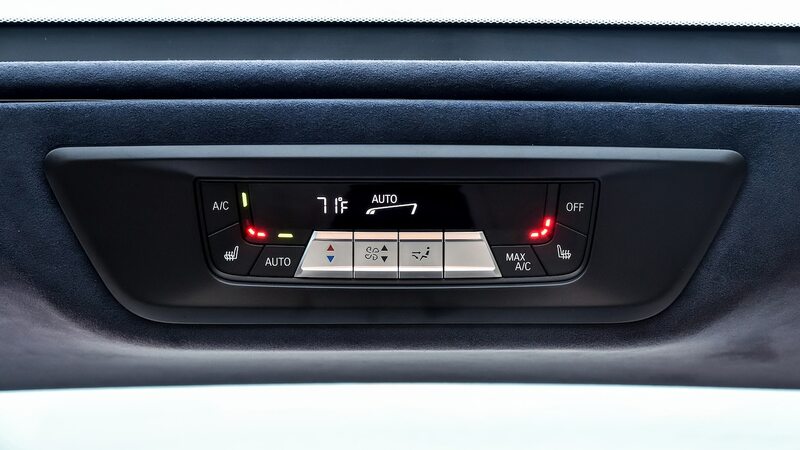 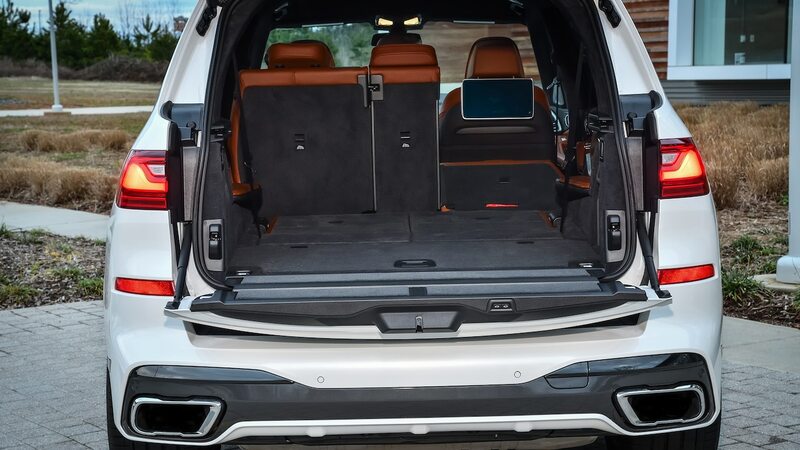 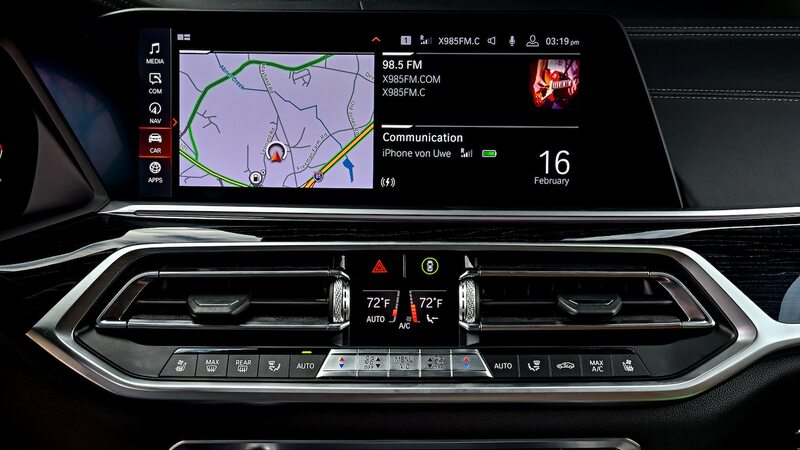 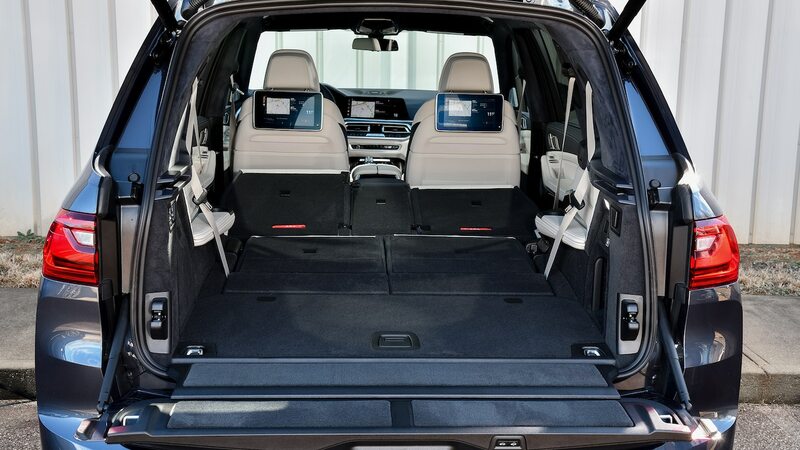 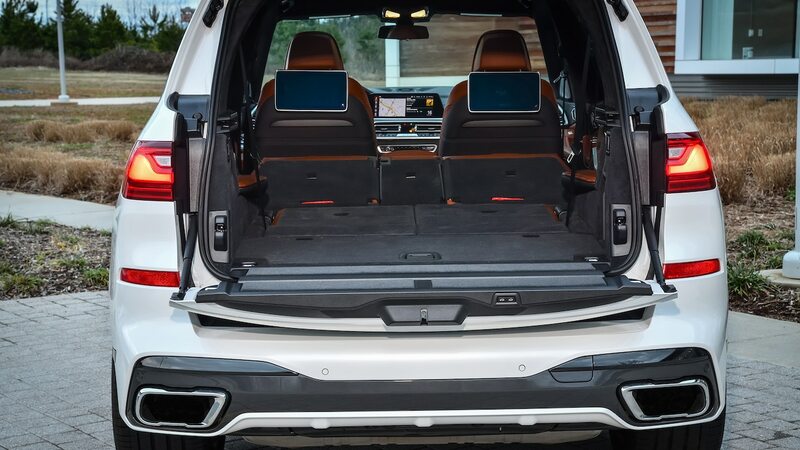 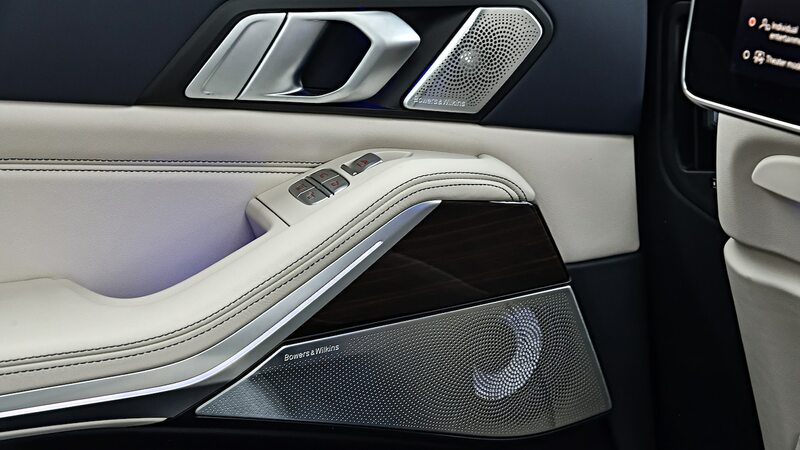 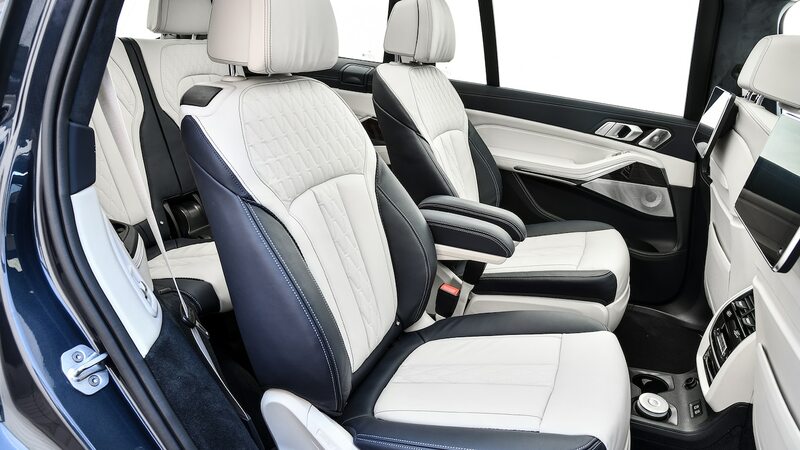 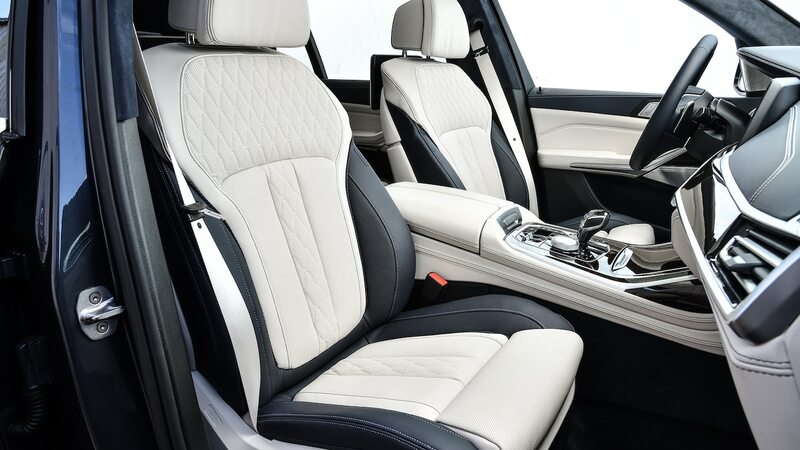 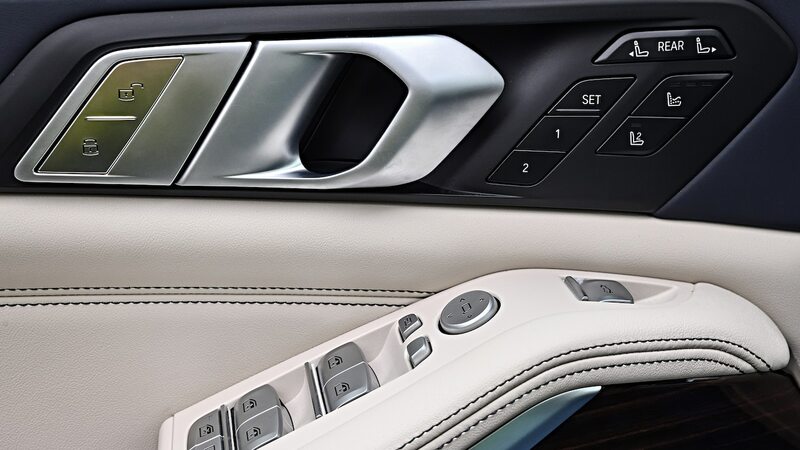 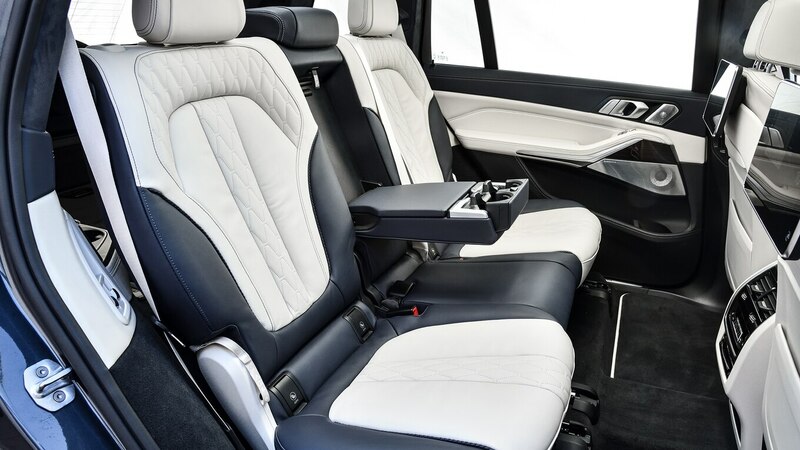 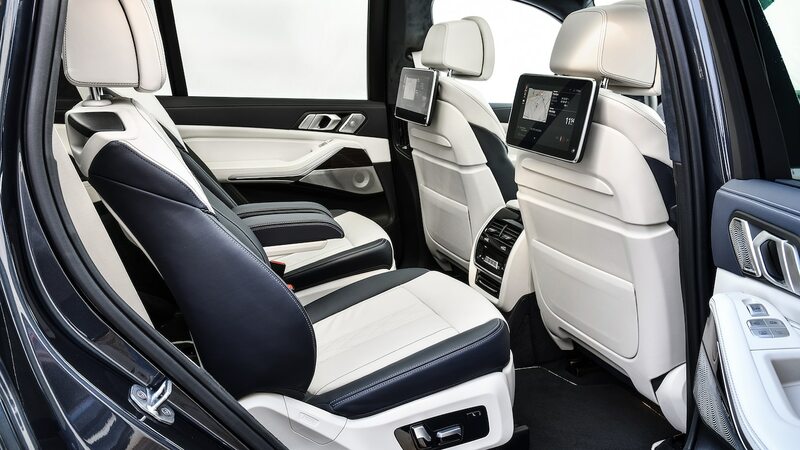 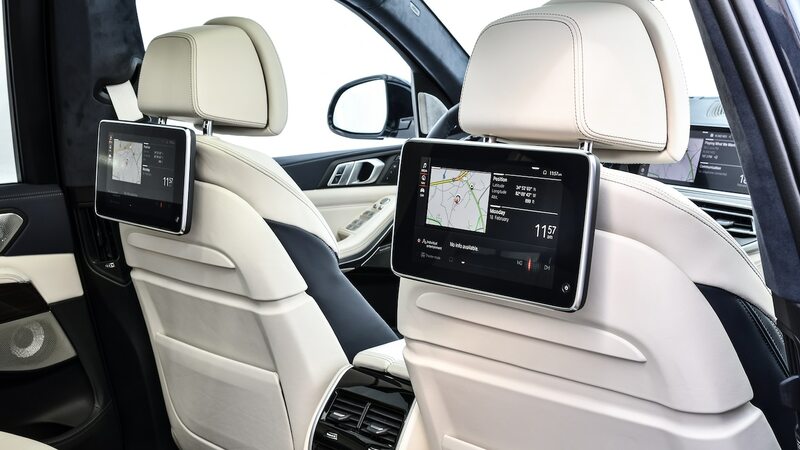 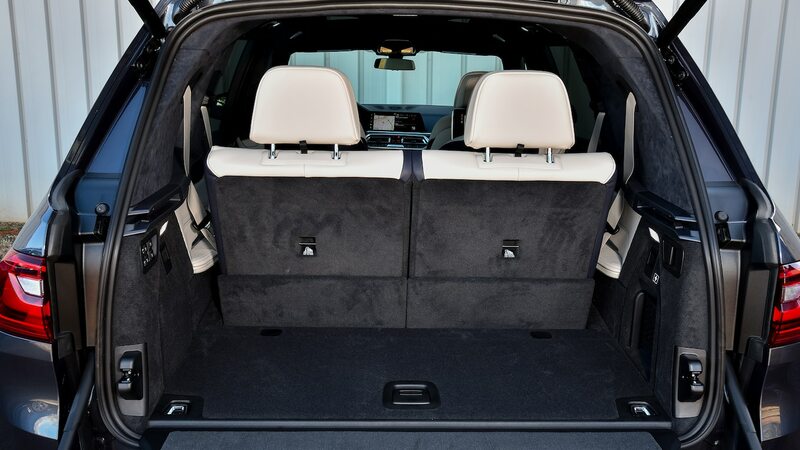 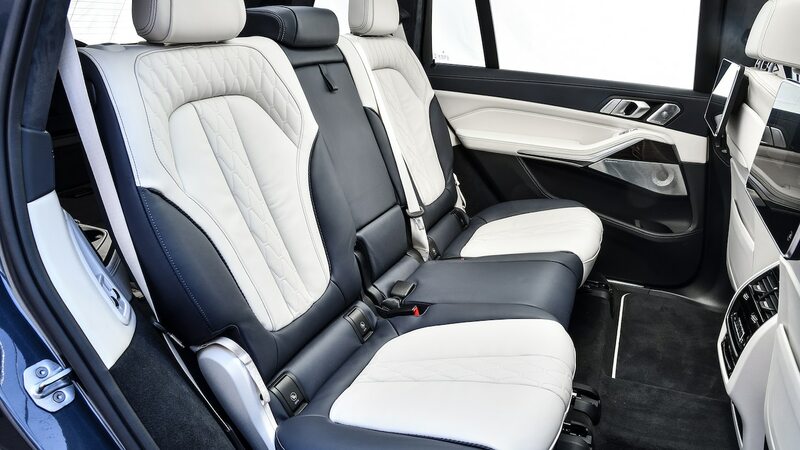 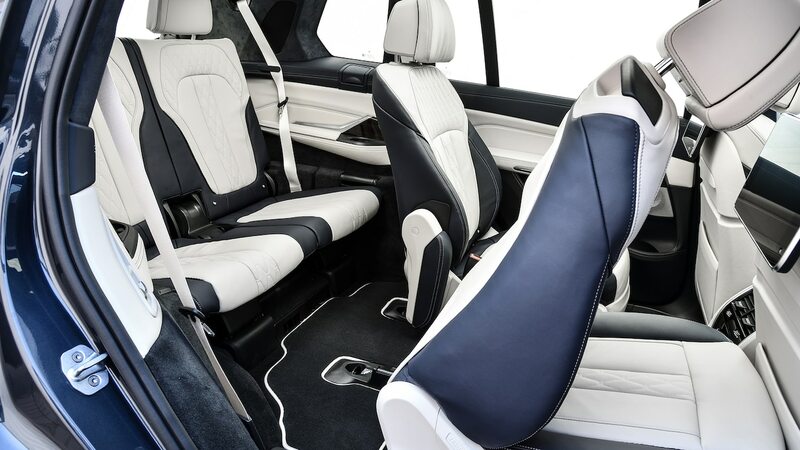 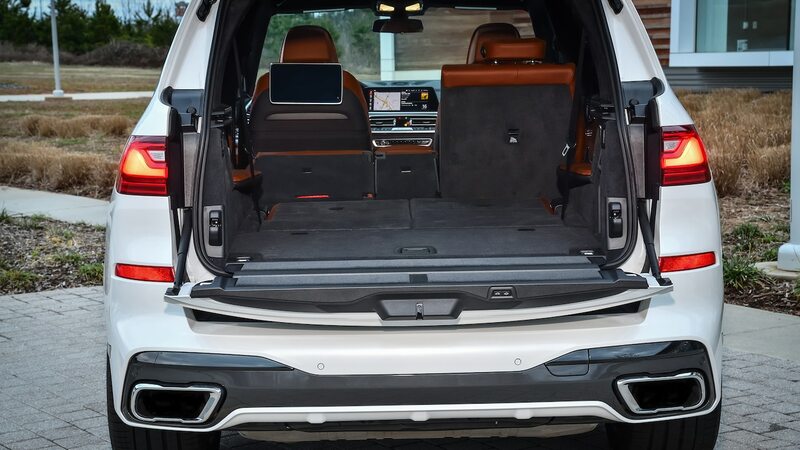 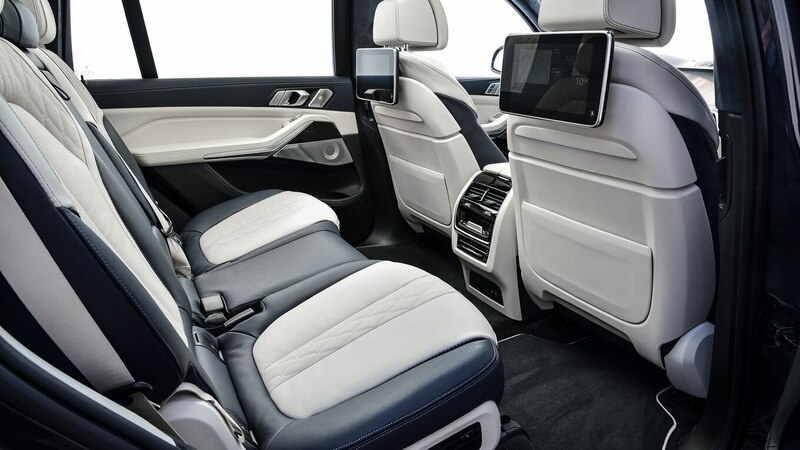 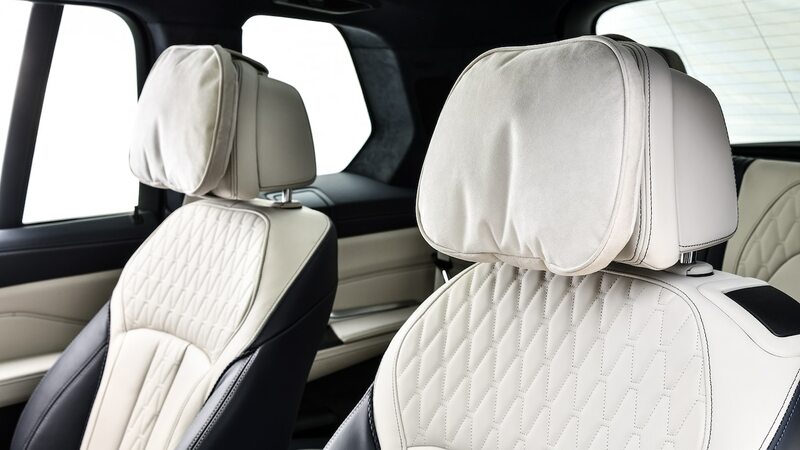 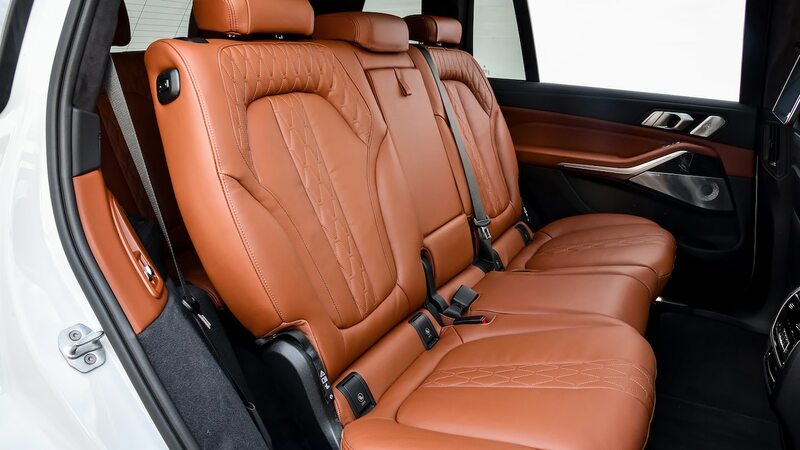 Climb inside, and it’s immediately clear there’s a lot of 7 Series in the X7’s cabin. 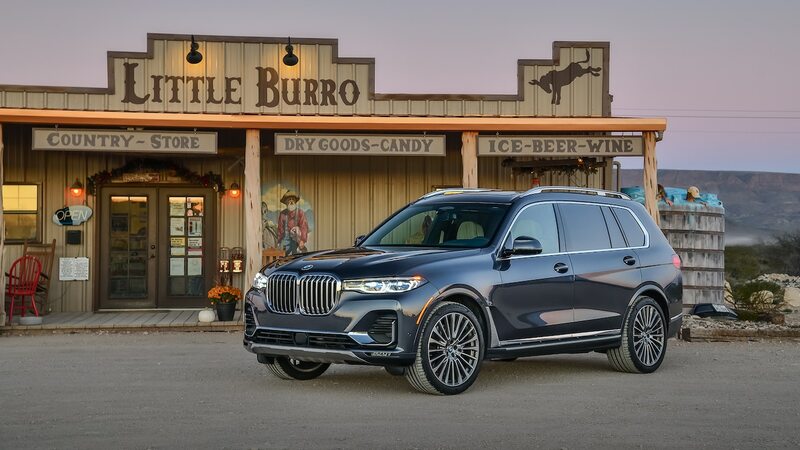 As the 7 Series of SUVs, that makes sense. 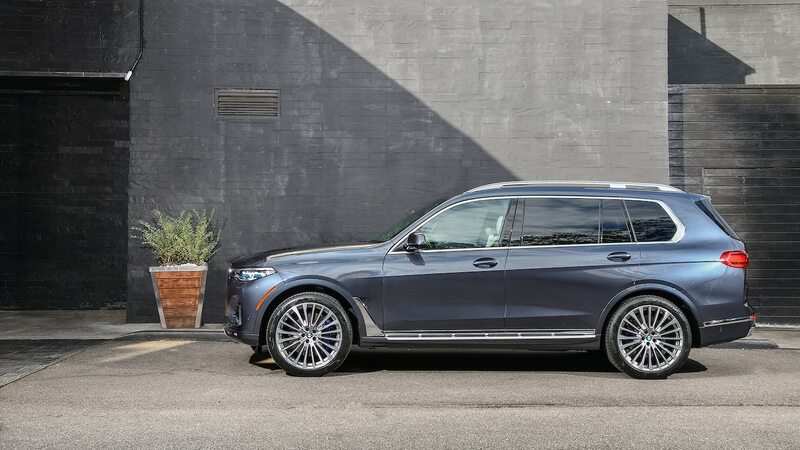 And even though we’ve been critical of BMW for not matching the Mercedes-Benz S-Class’ luxurious feel inside the 7 Series, the look fits with the character of a large luxury crossover better for some reason. 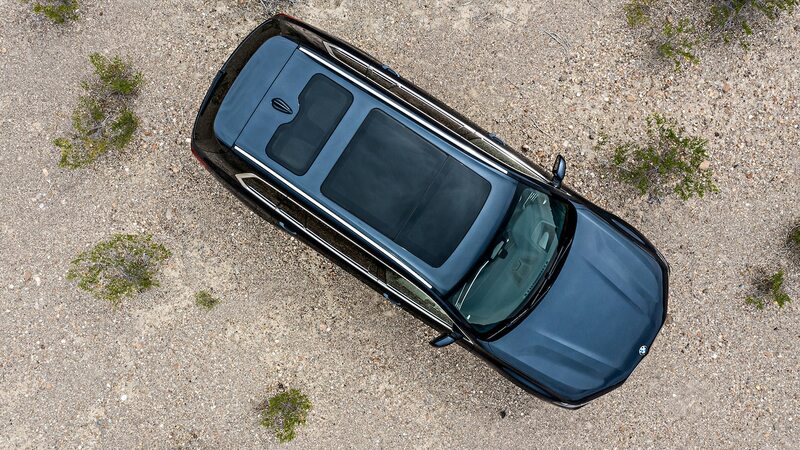 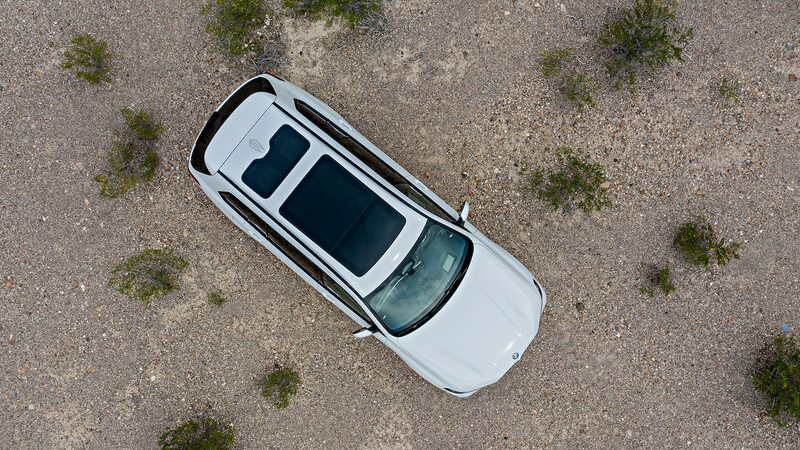 If you plan to road trip the X7 with anyone in the third row, though, go ahead and buy a roof box. 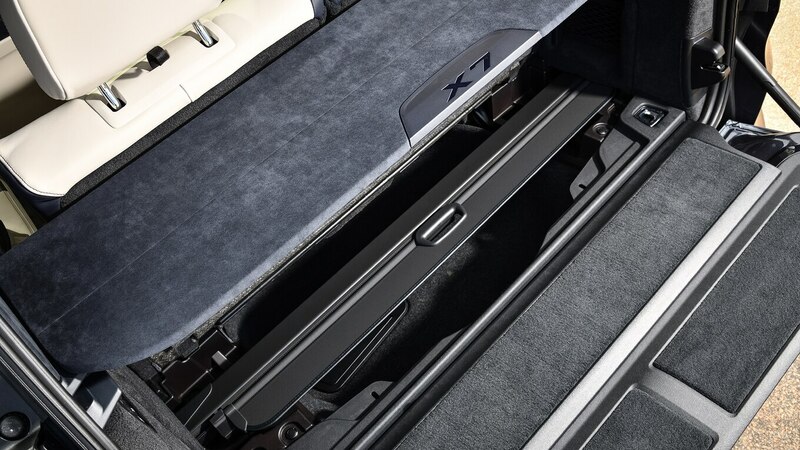 With the third row folded, there’s plenty of luggage space, but with it up, there’s really only room for two carry-ons. 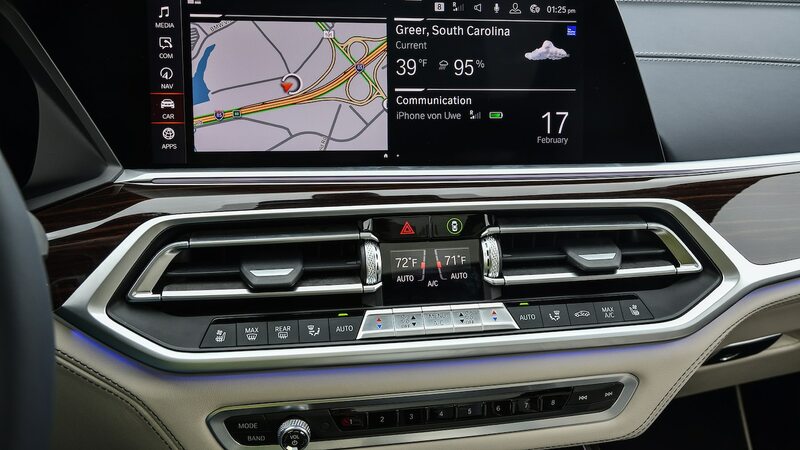 Also, although the X7 comes with six USB ports, there’s only one USB-A port, and it’s located up front in the center console. 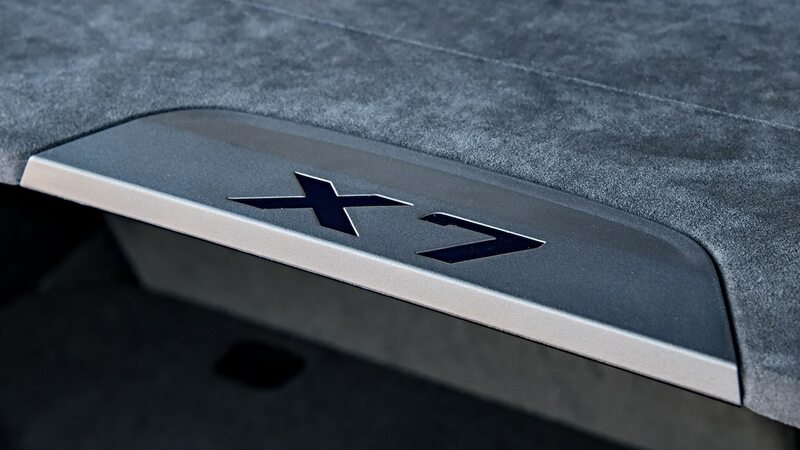 The rest are all USB-C, which should be a benefit if you plan to keep your X7 for more than a few years, but right now, it will probably require many owners to invest in dongles. 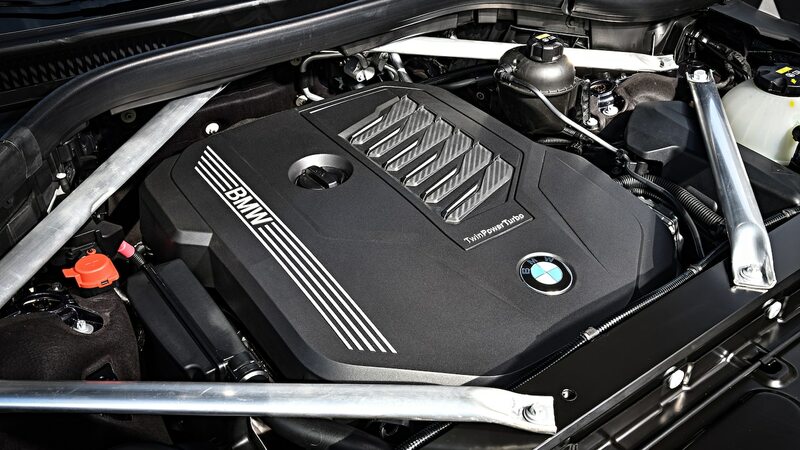 Under the hood, you get your choice of an I-6 or a V-8. 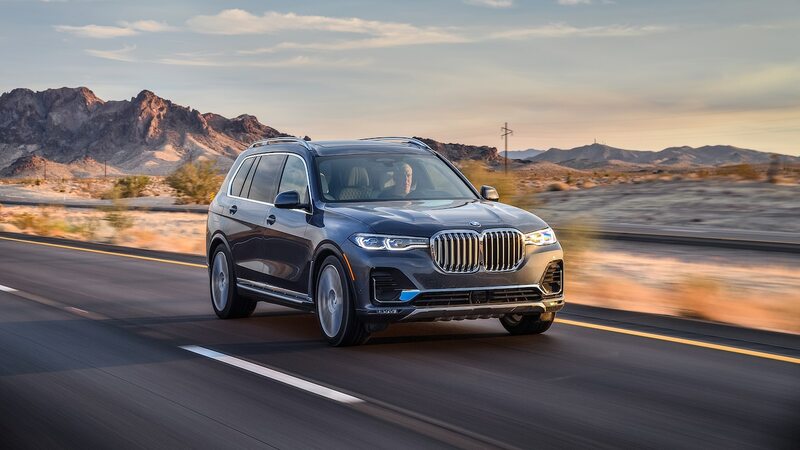 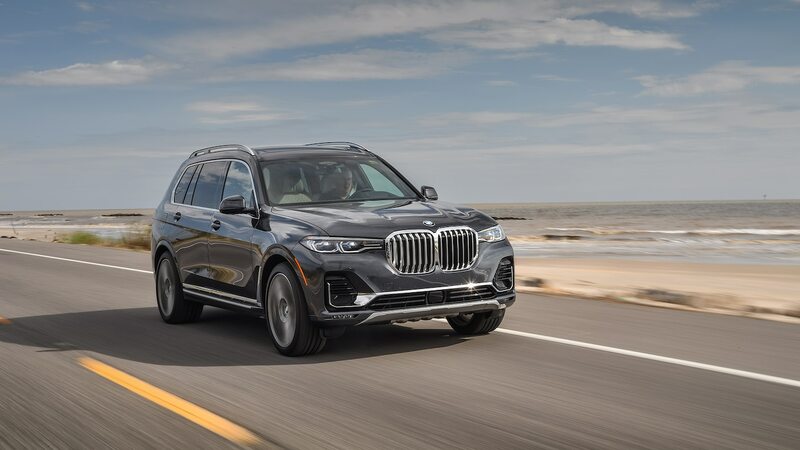 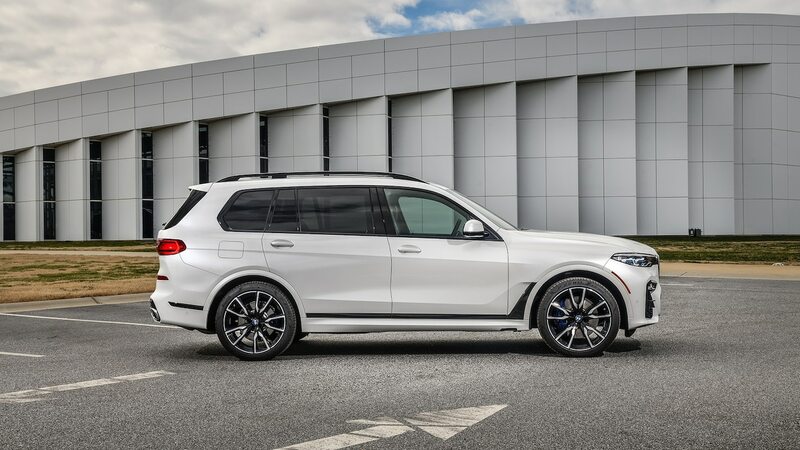 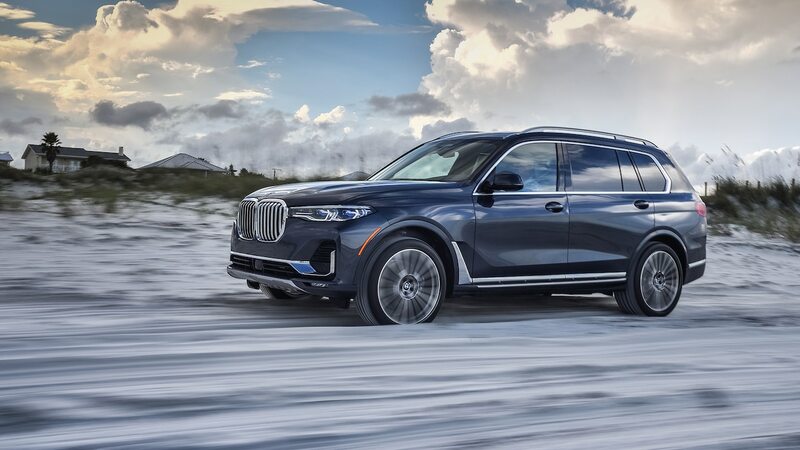 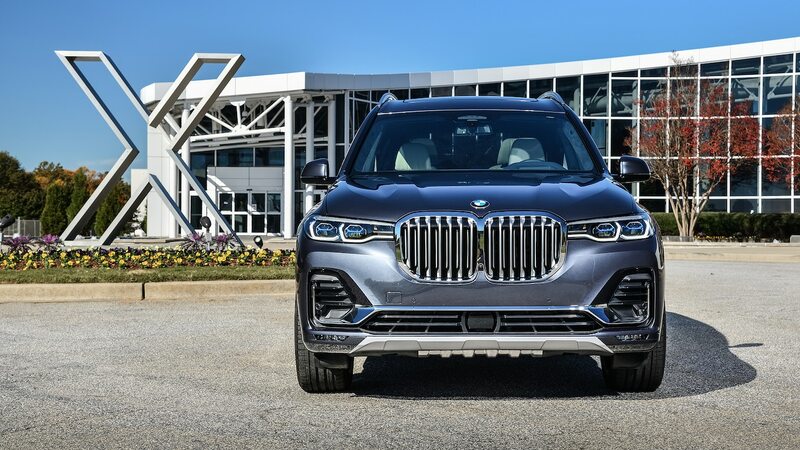 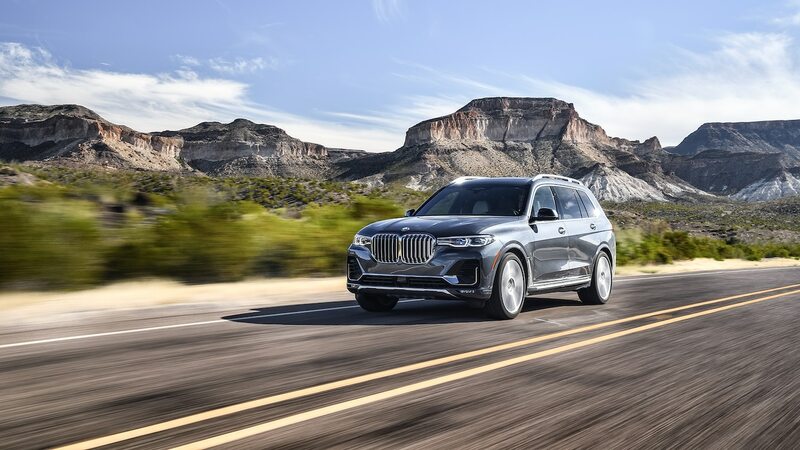 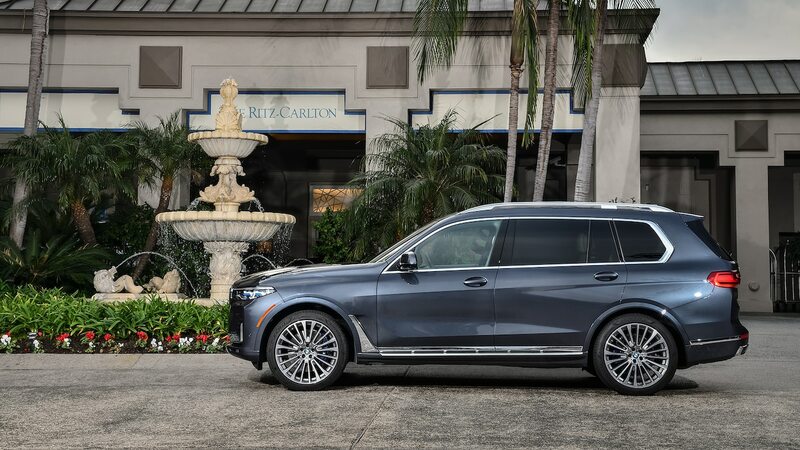 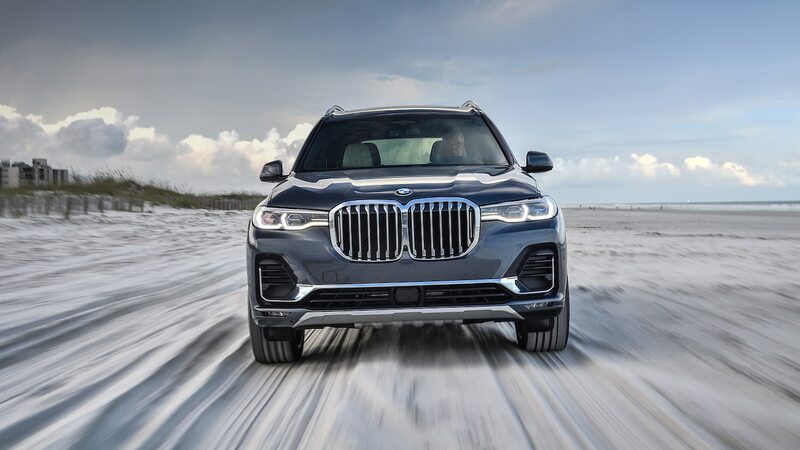 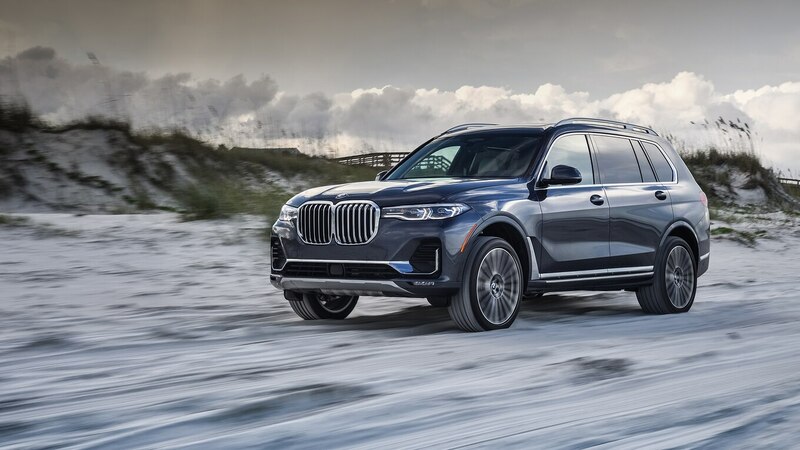 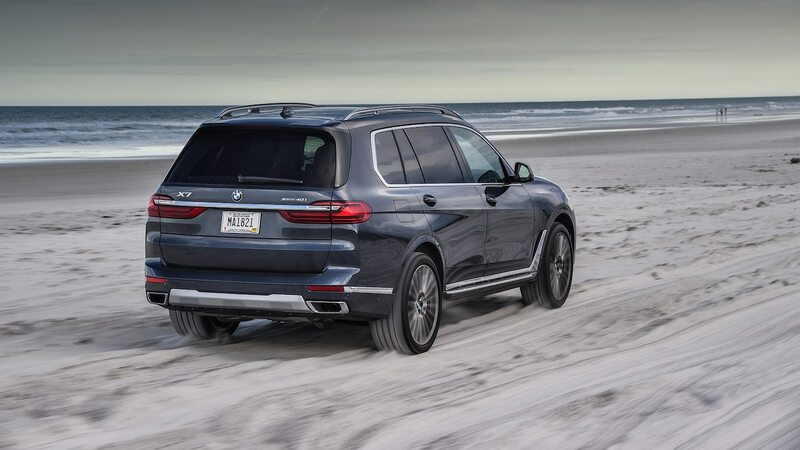 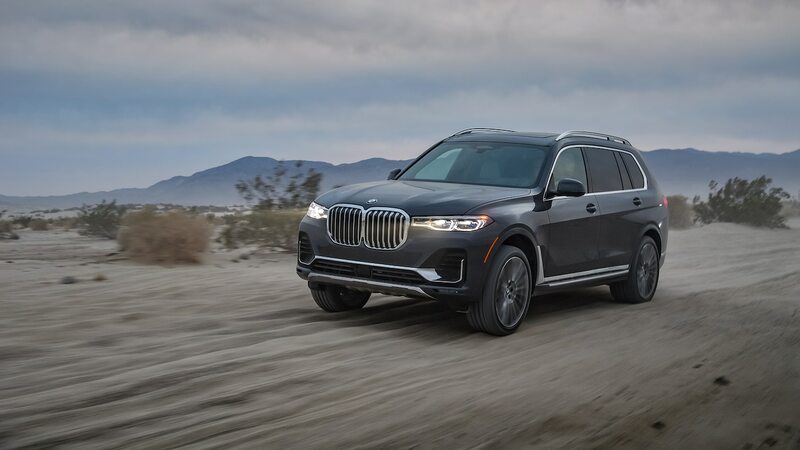 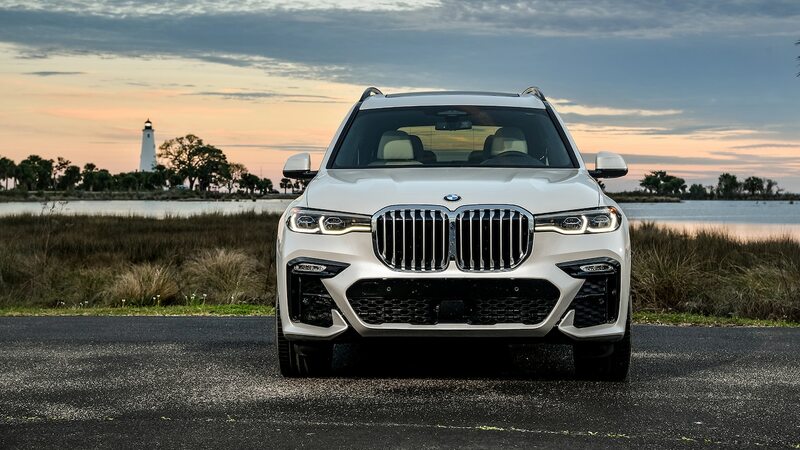 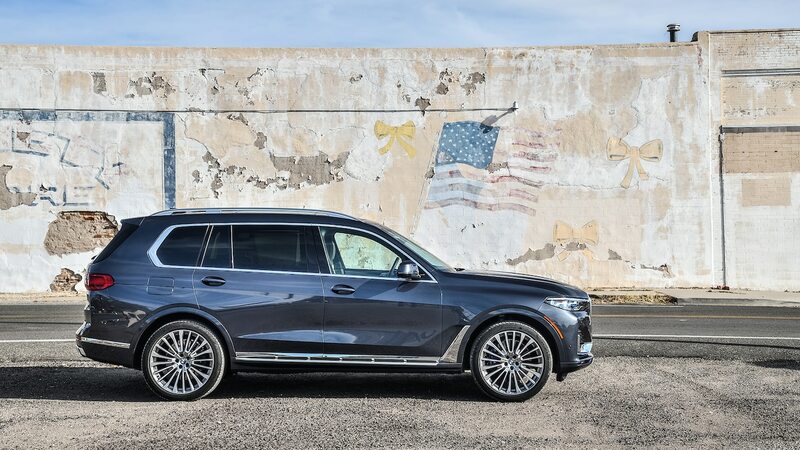 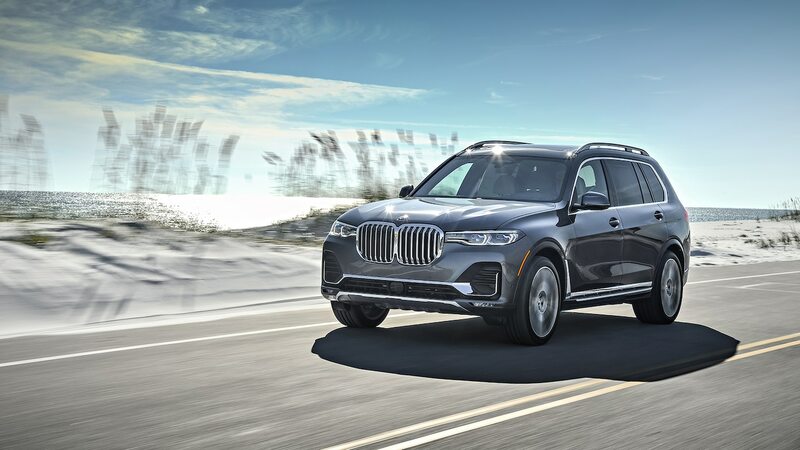 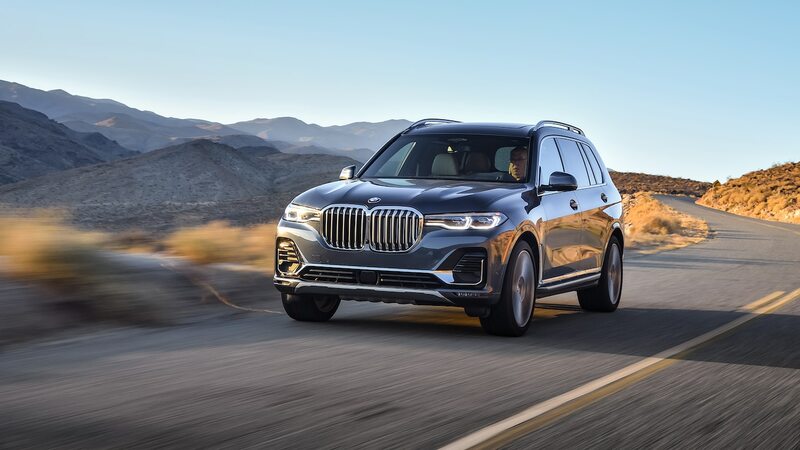 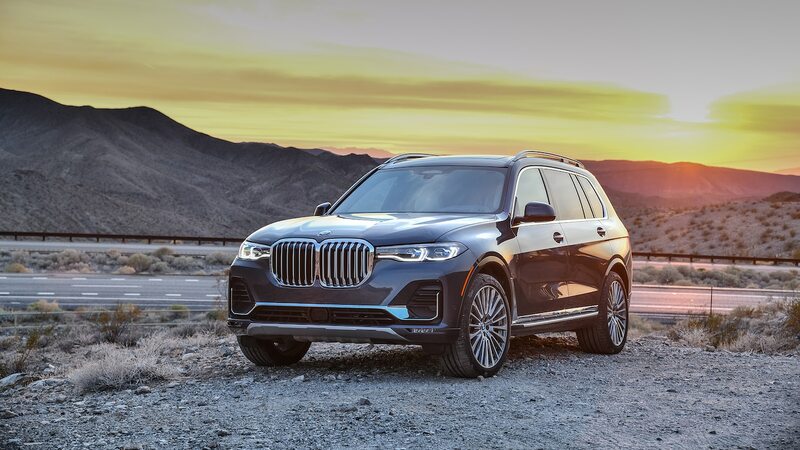 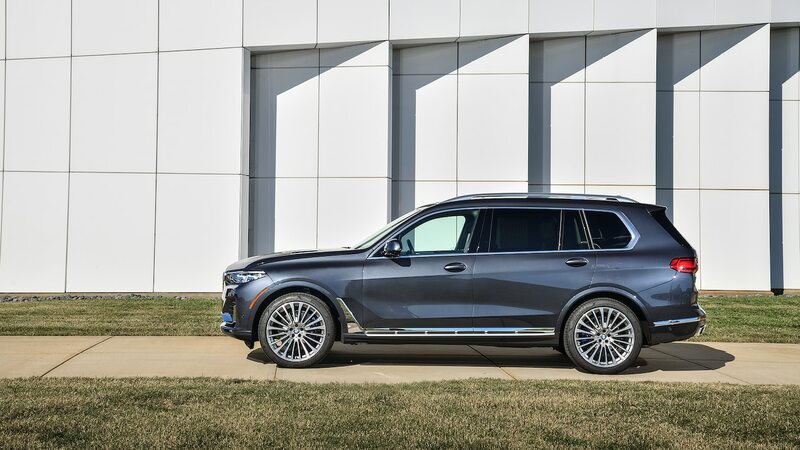 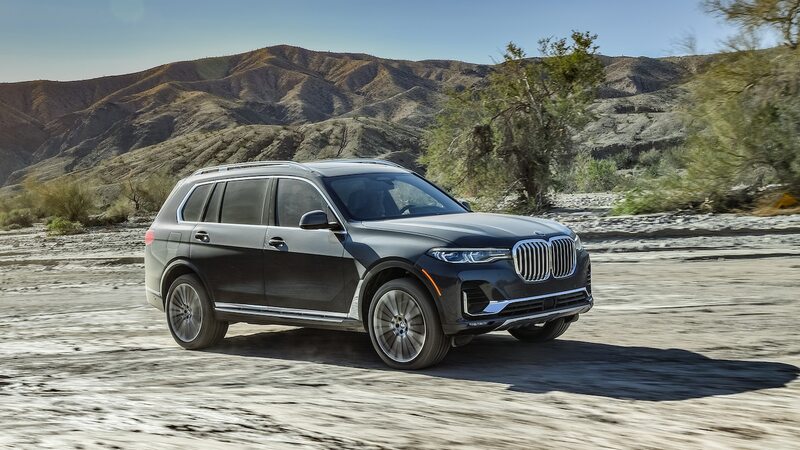 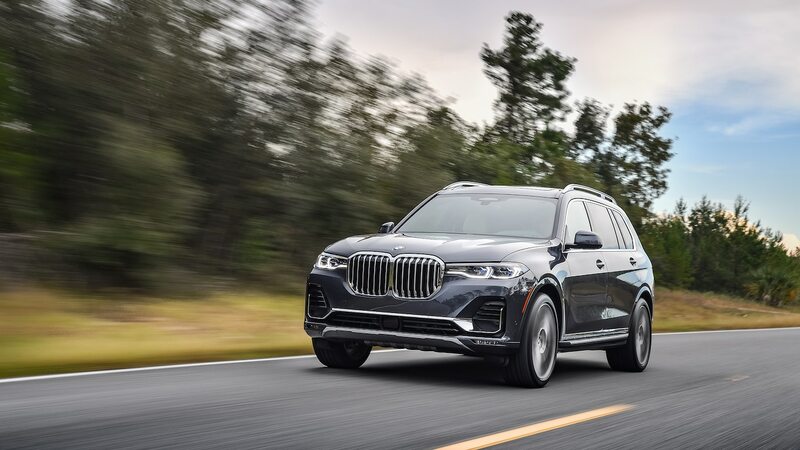 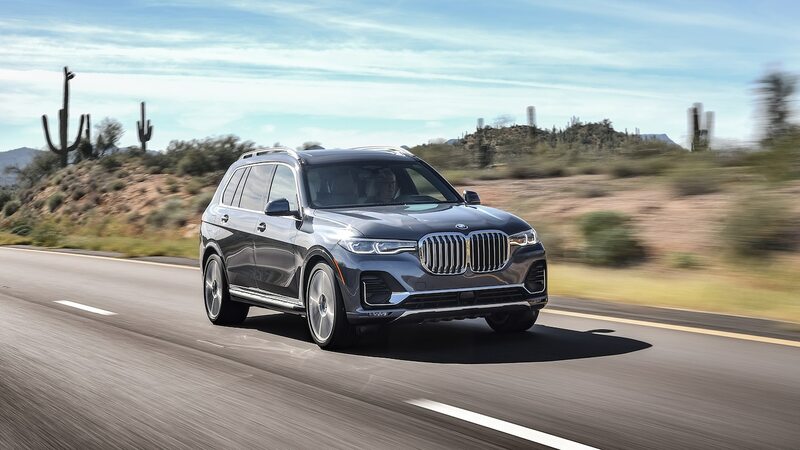 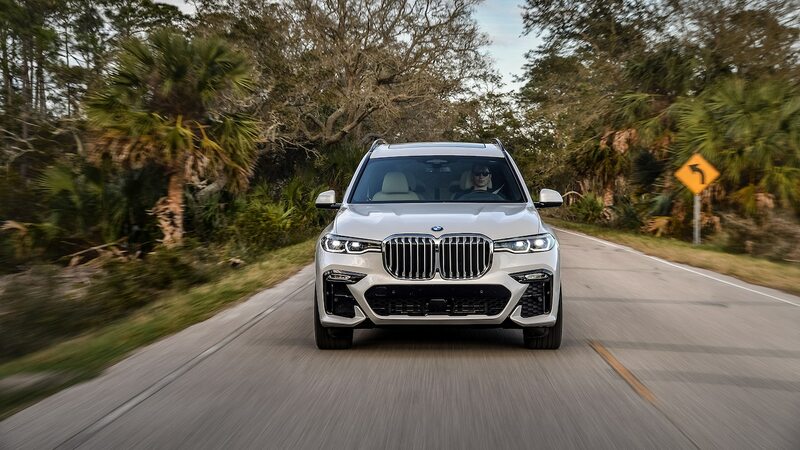 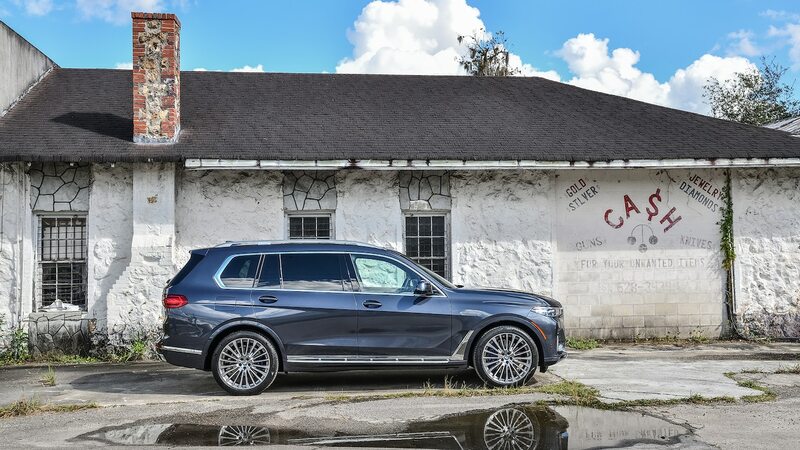 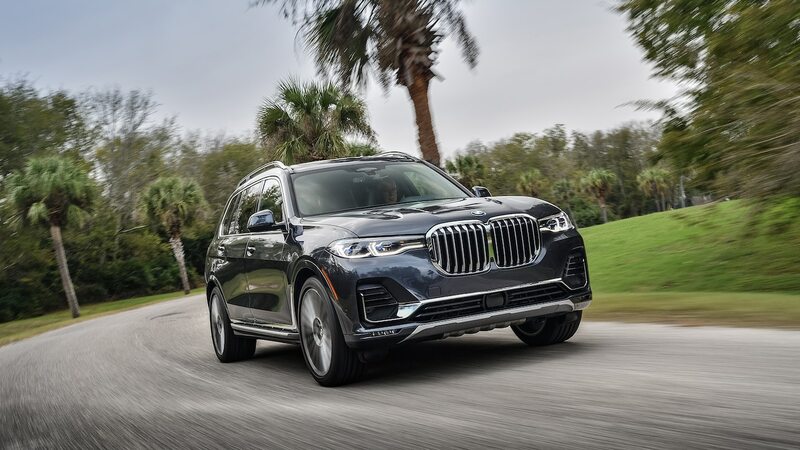 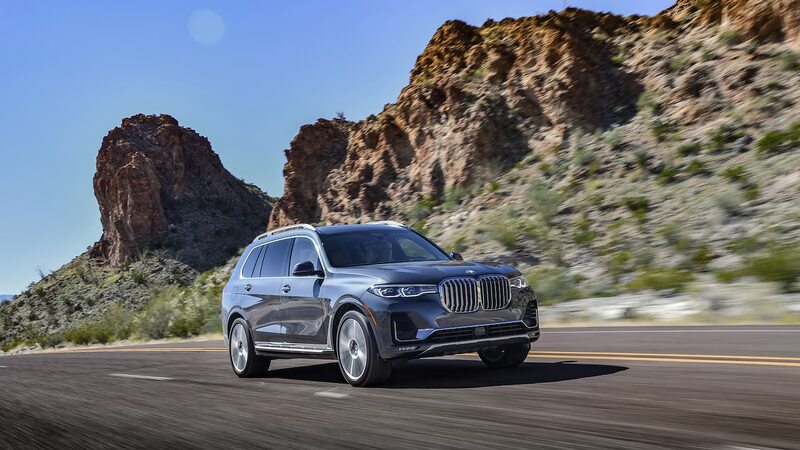 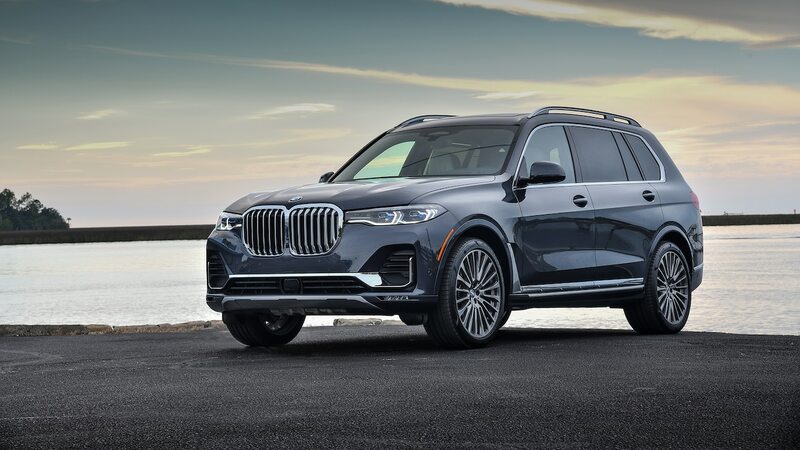 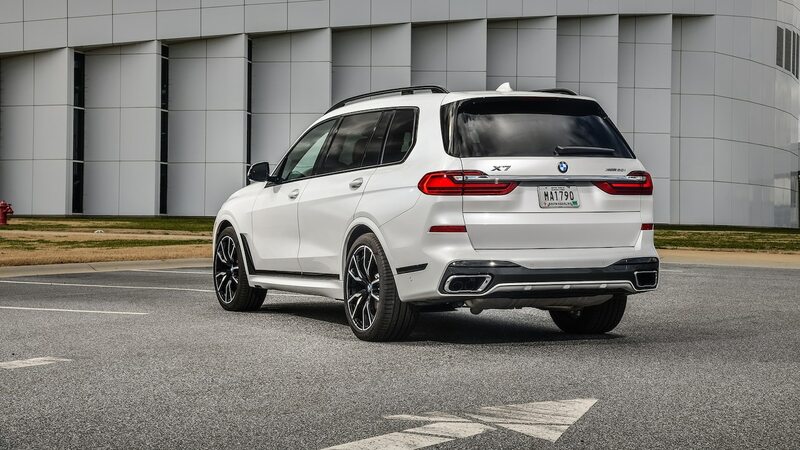 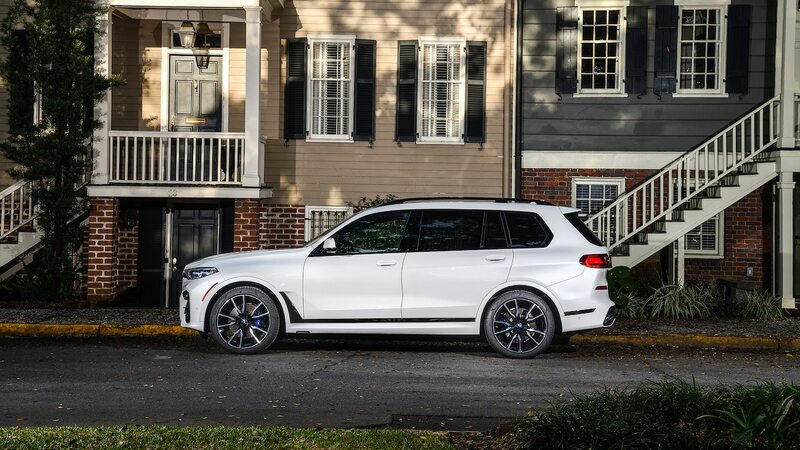 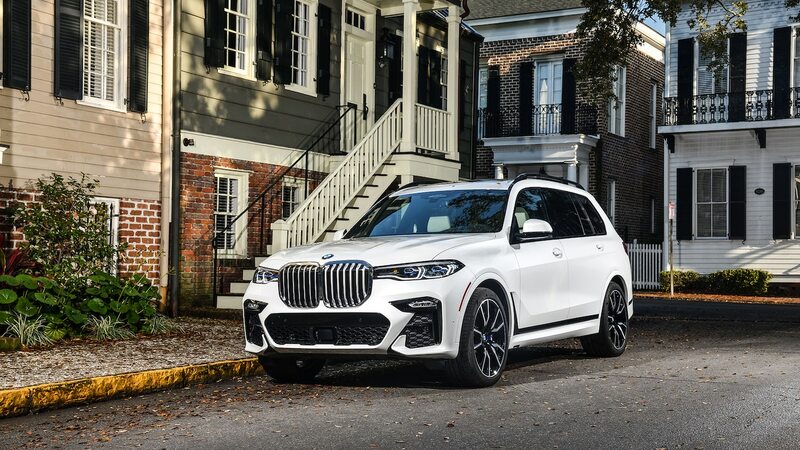 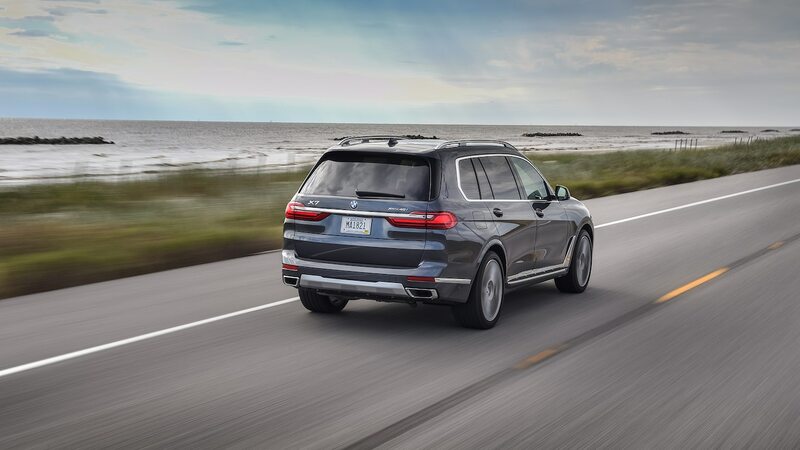 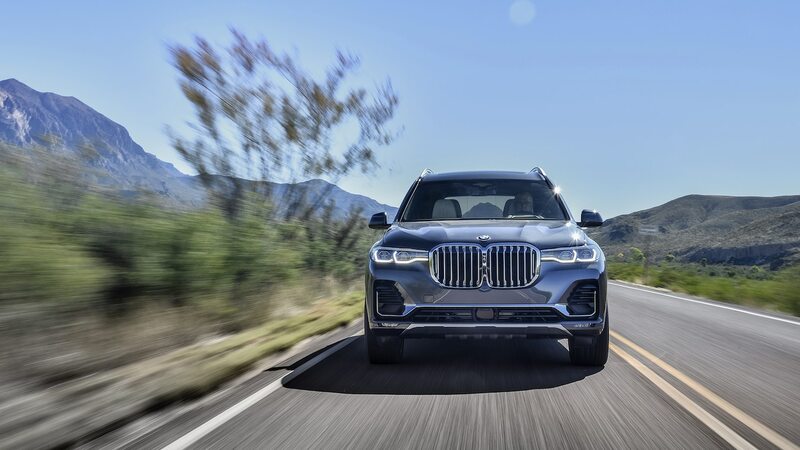 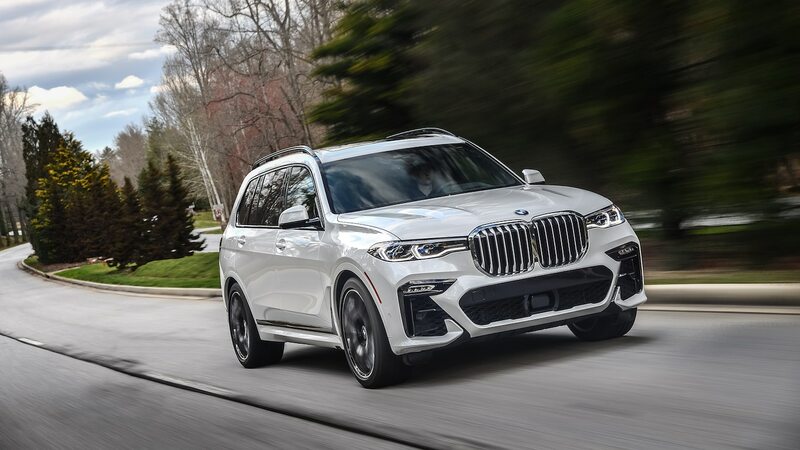 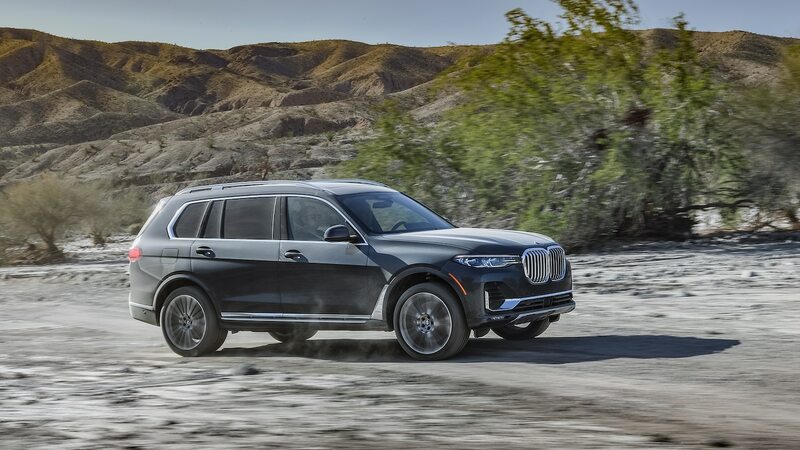 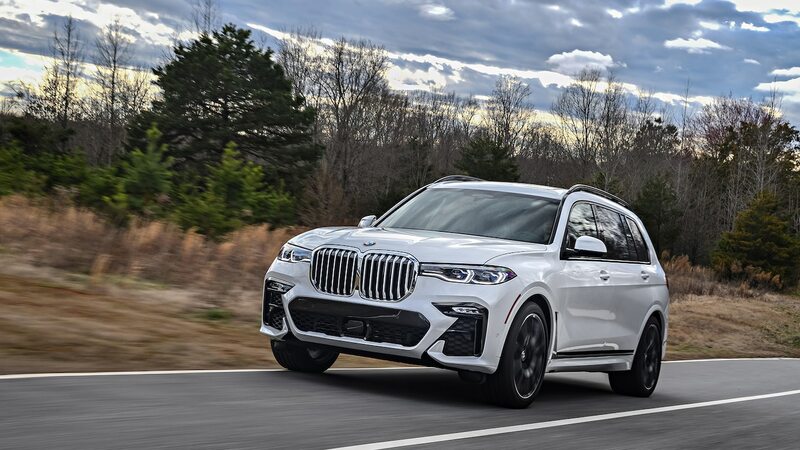 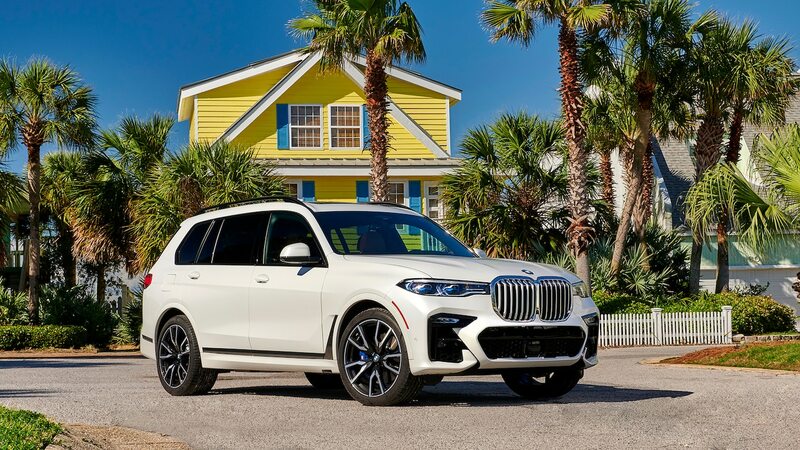 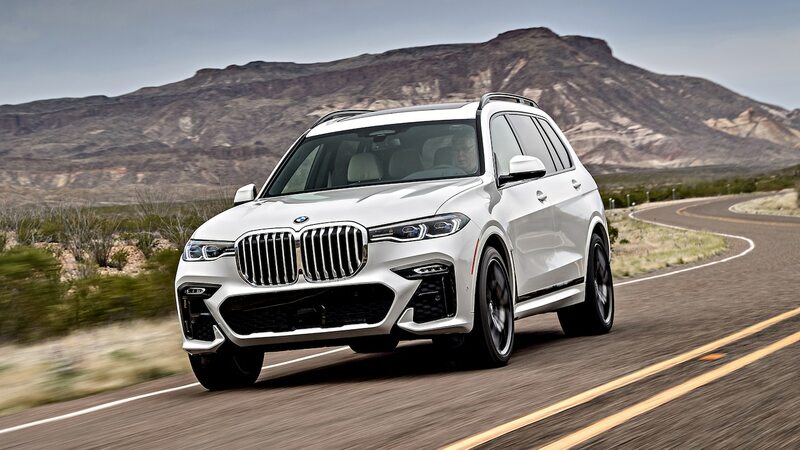 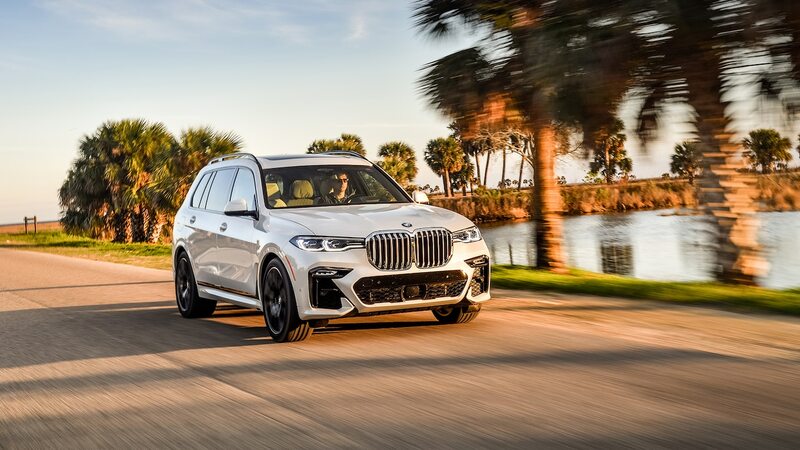 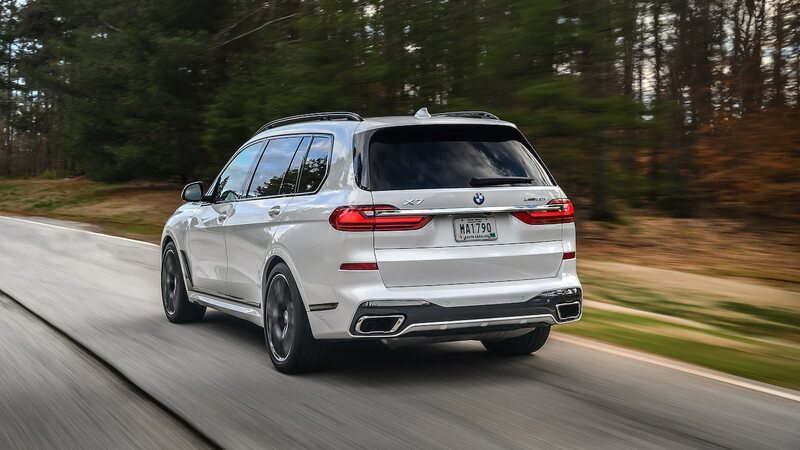 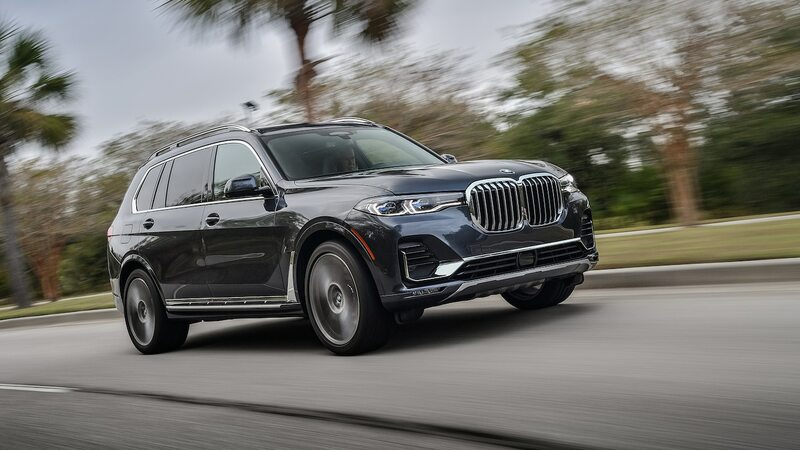 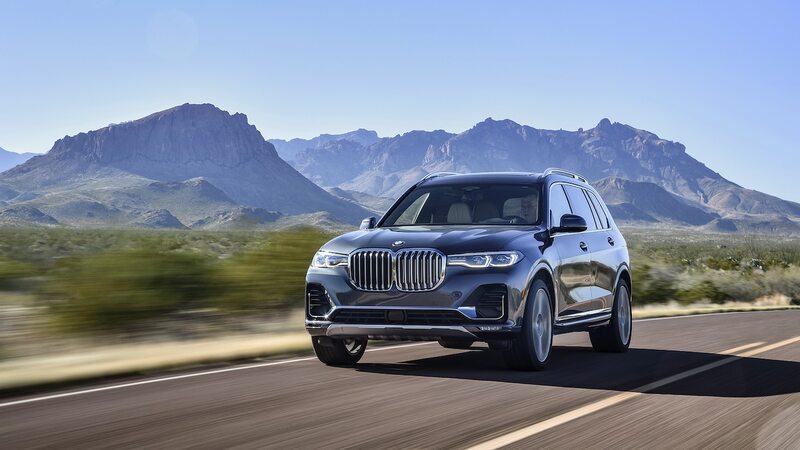 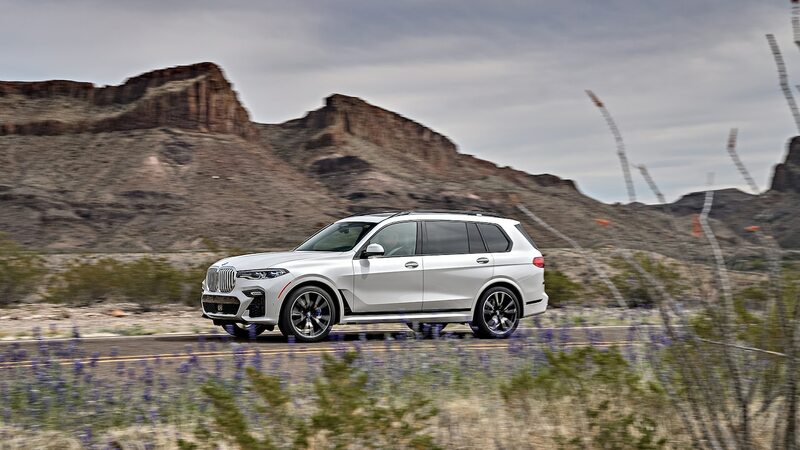 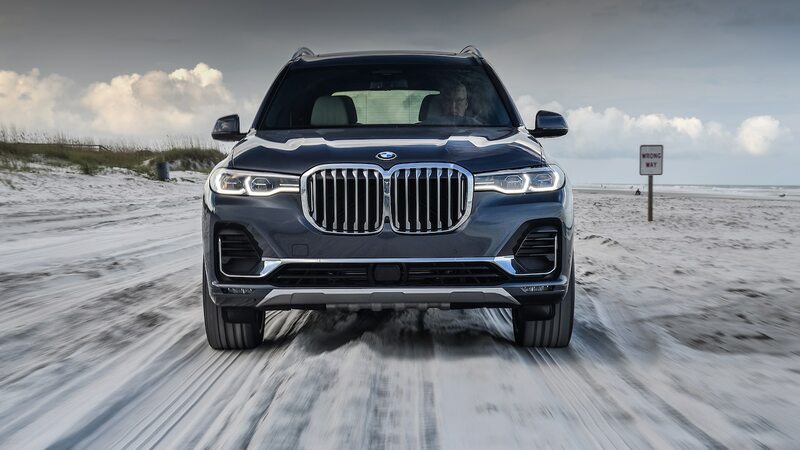 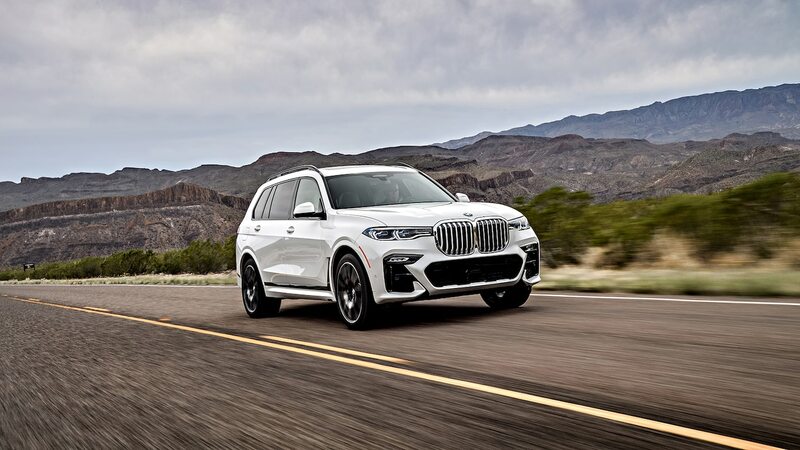 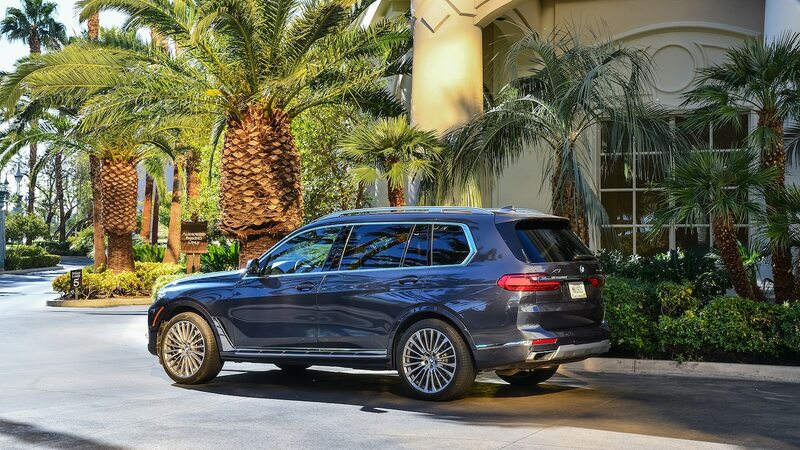 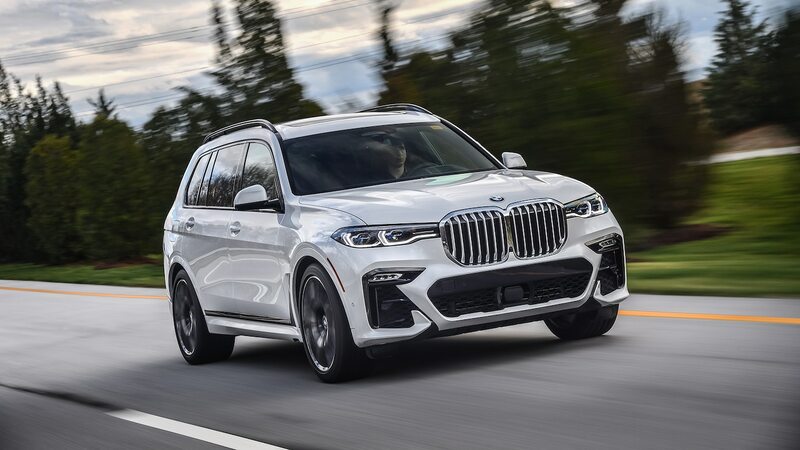 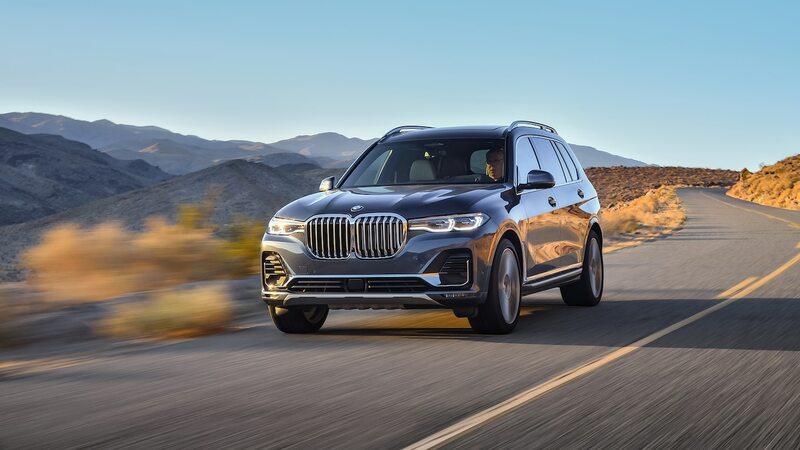 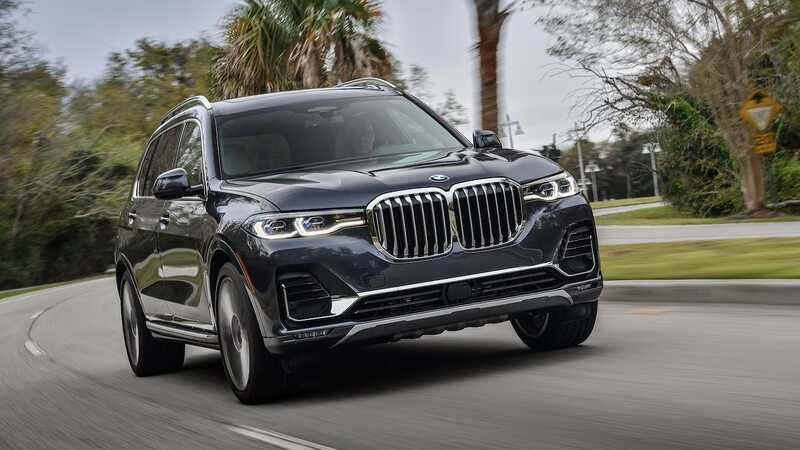 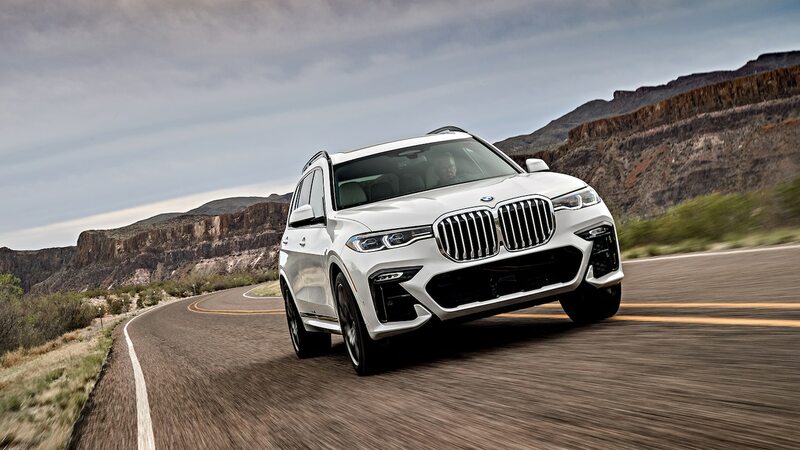 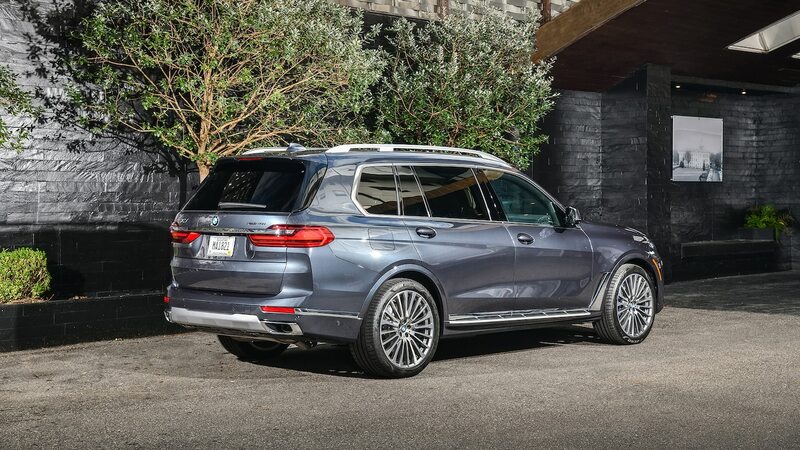 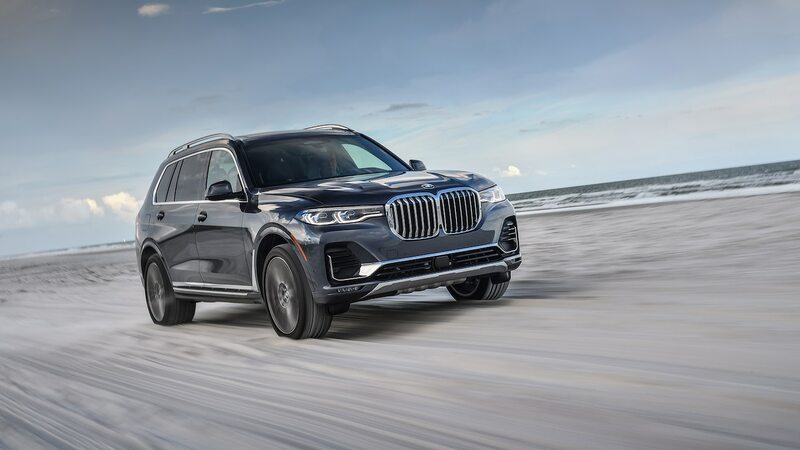 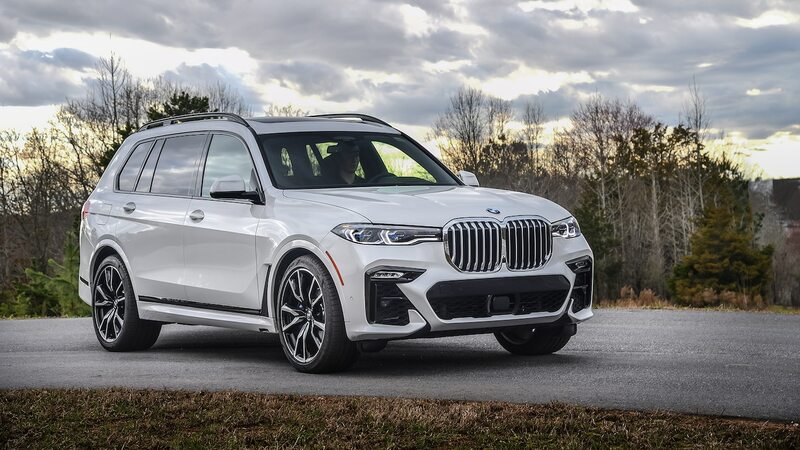 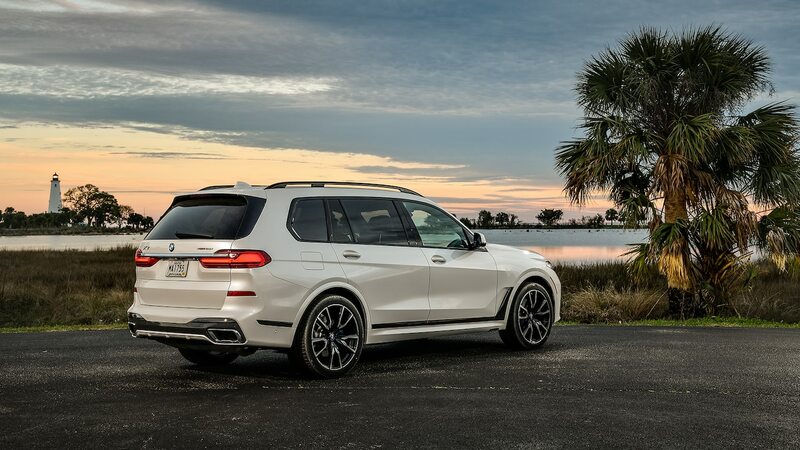 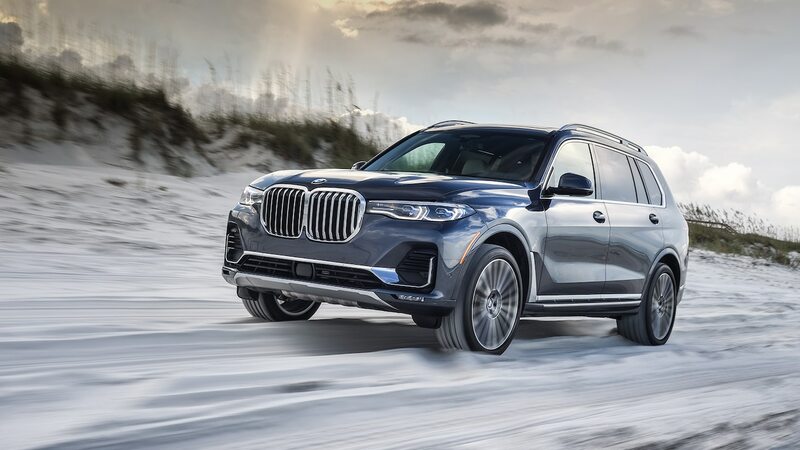 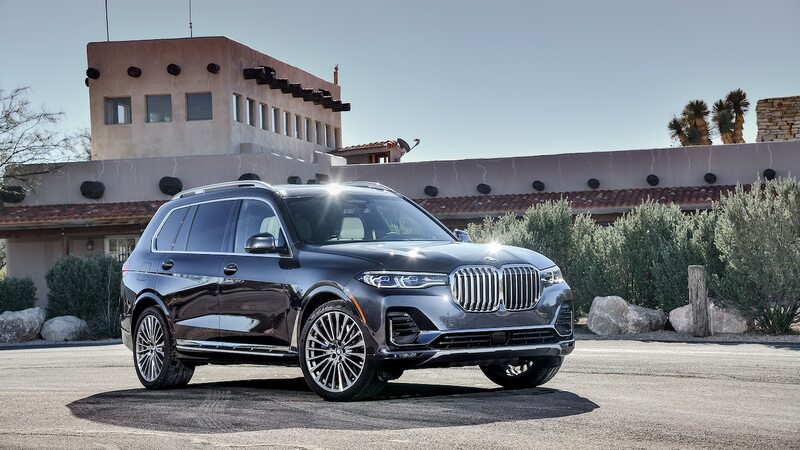 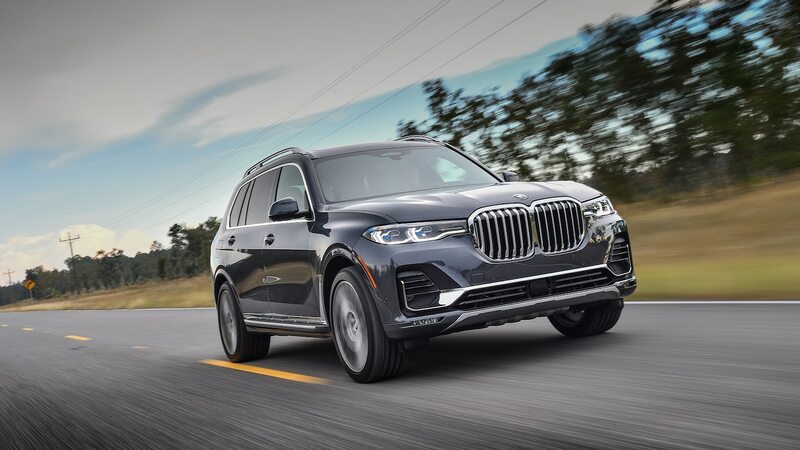 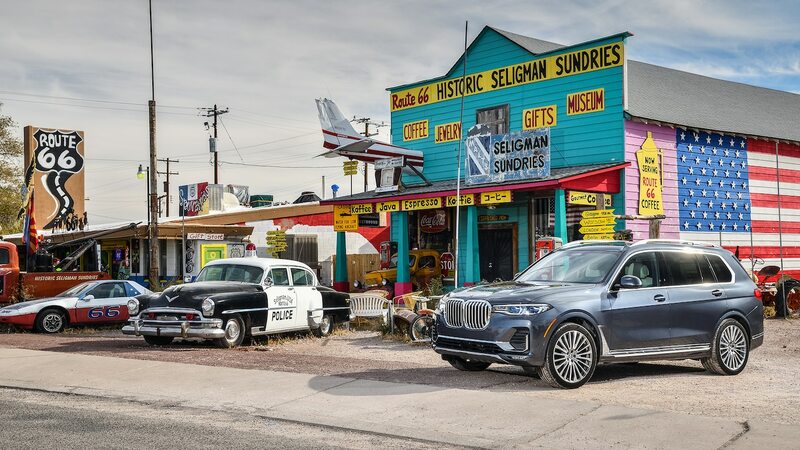 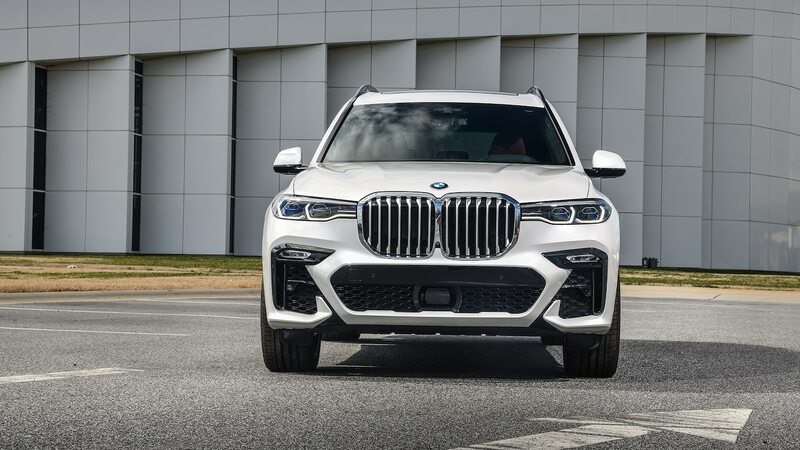 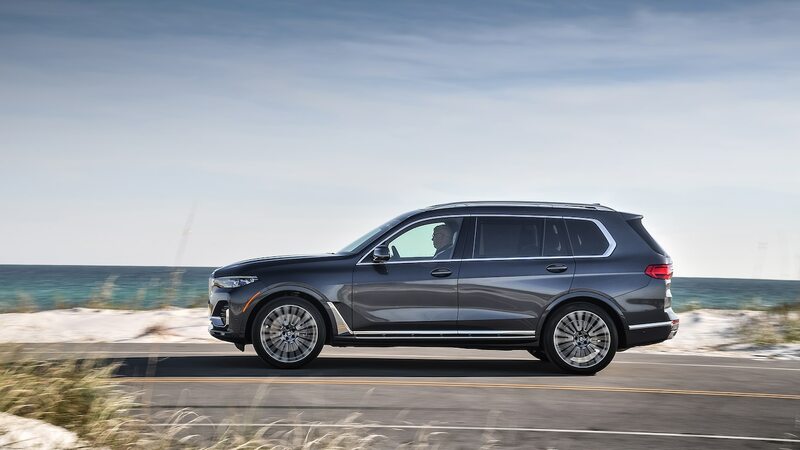 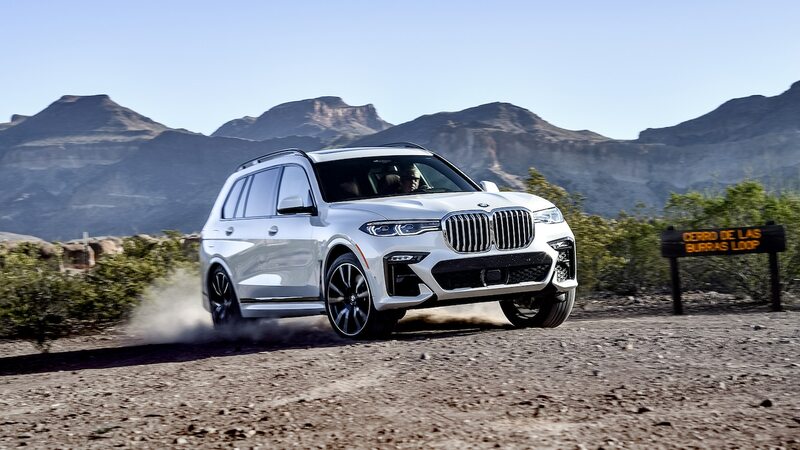 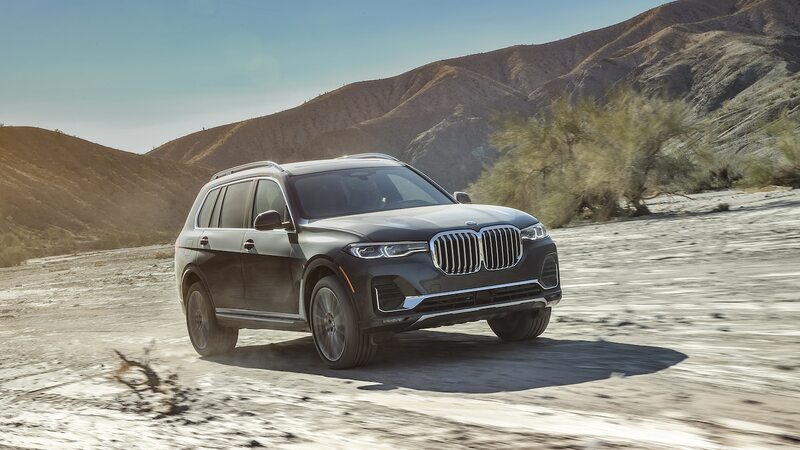 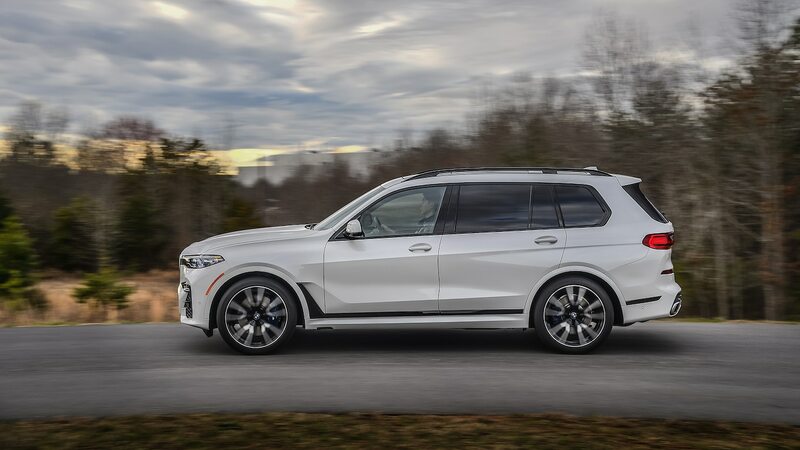 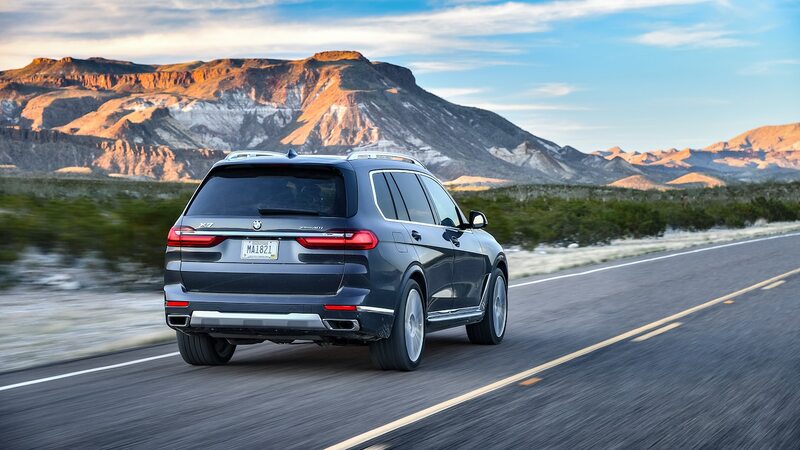 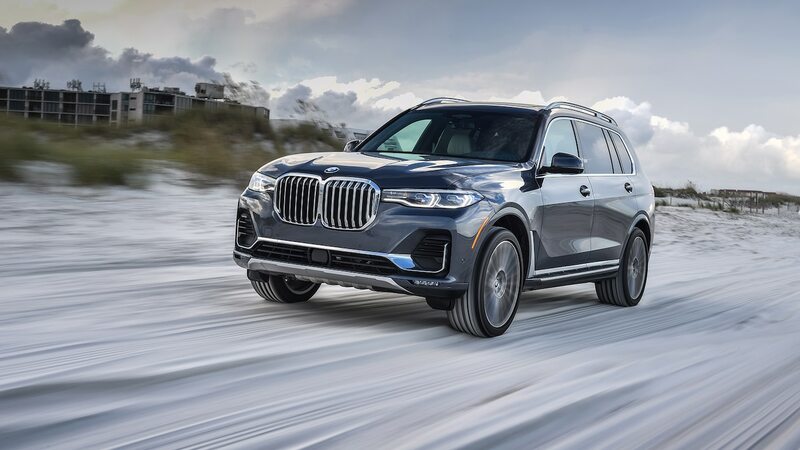 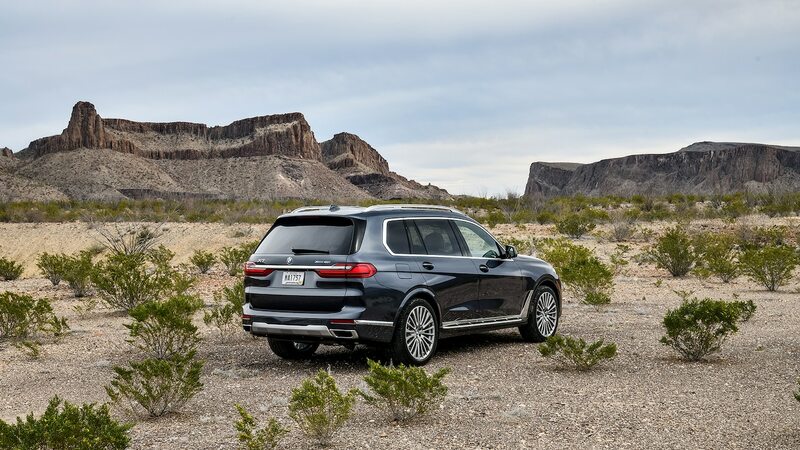 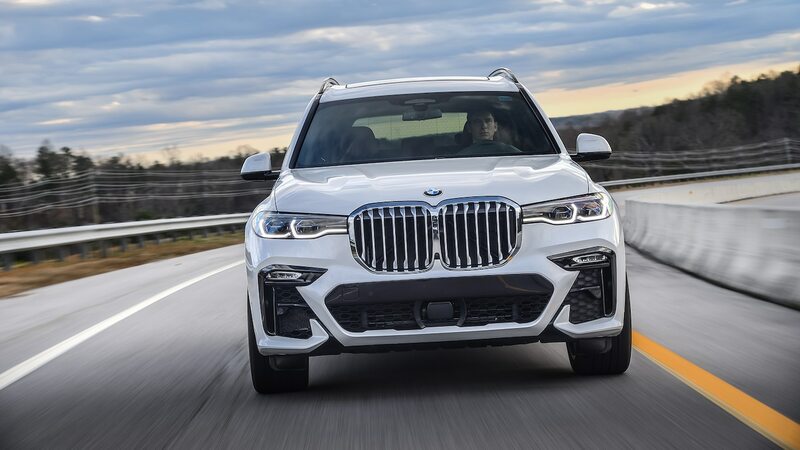 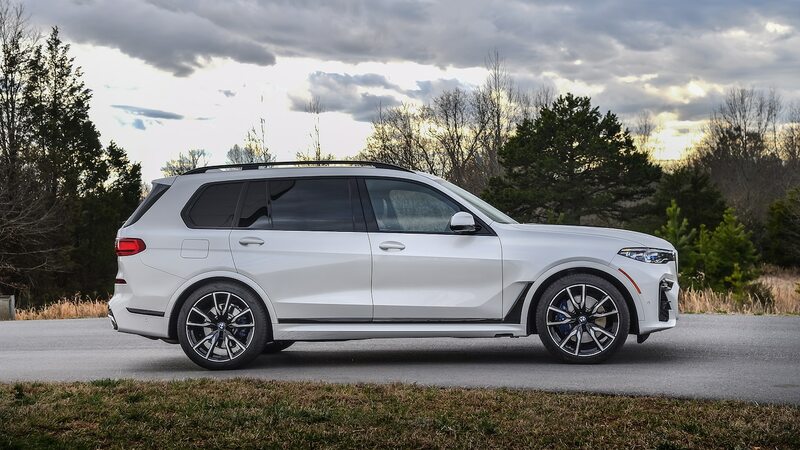 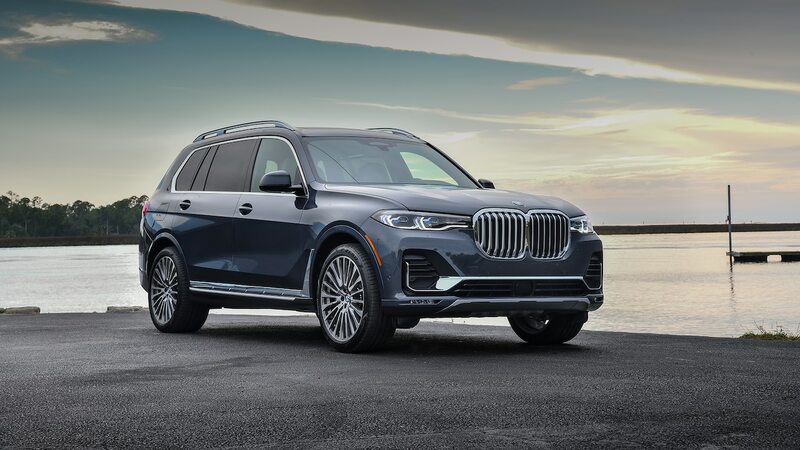 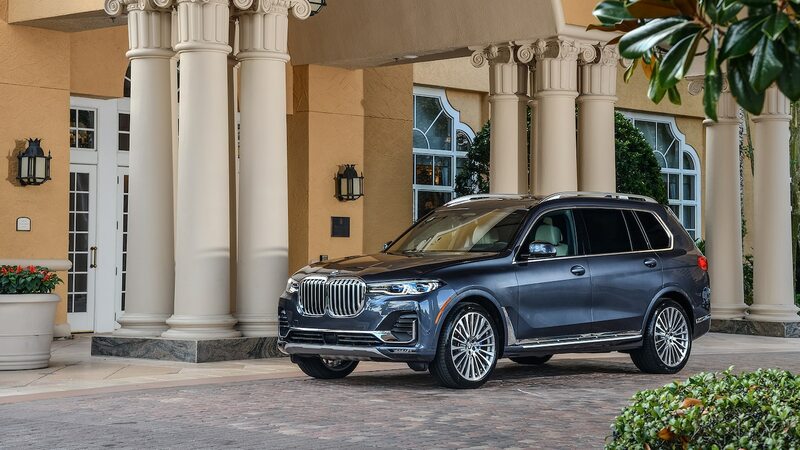 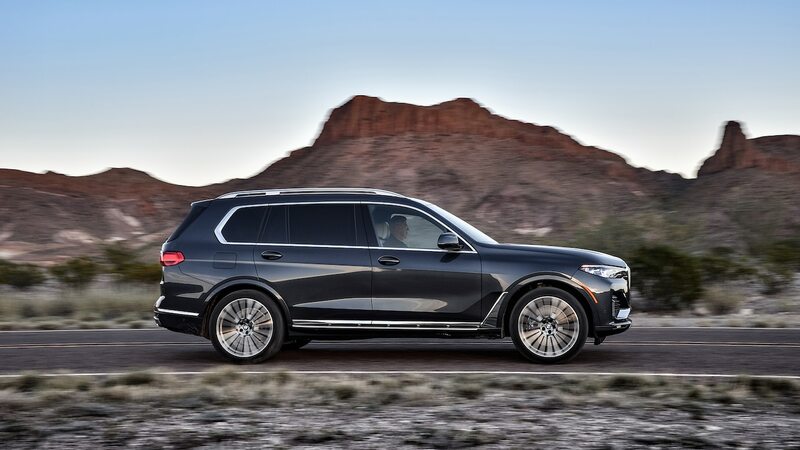 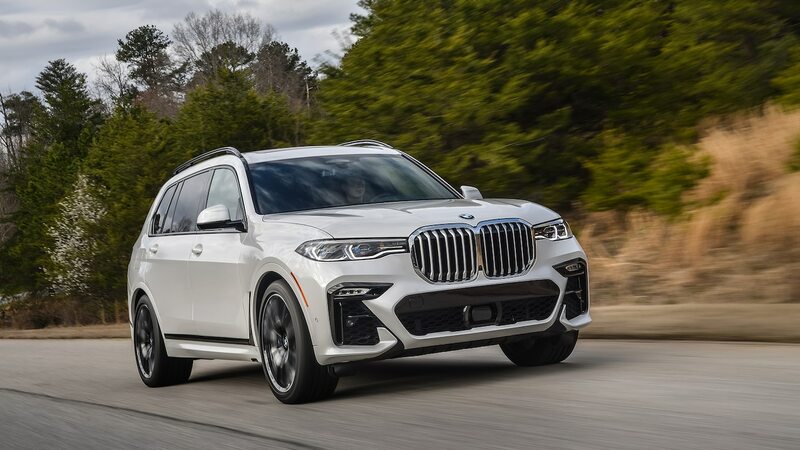 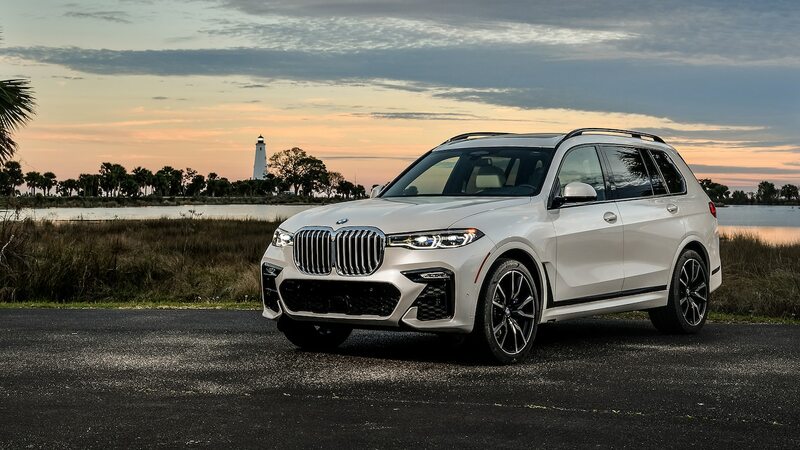 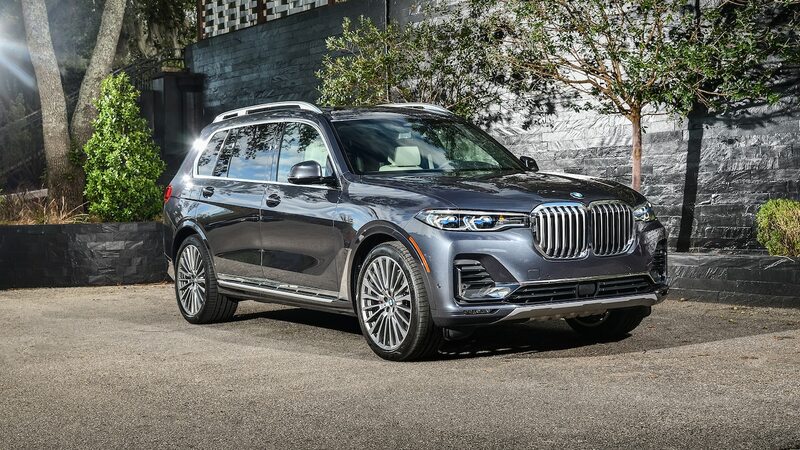 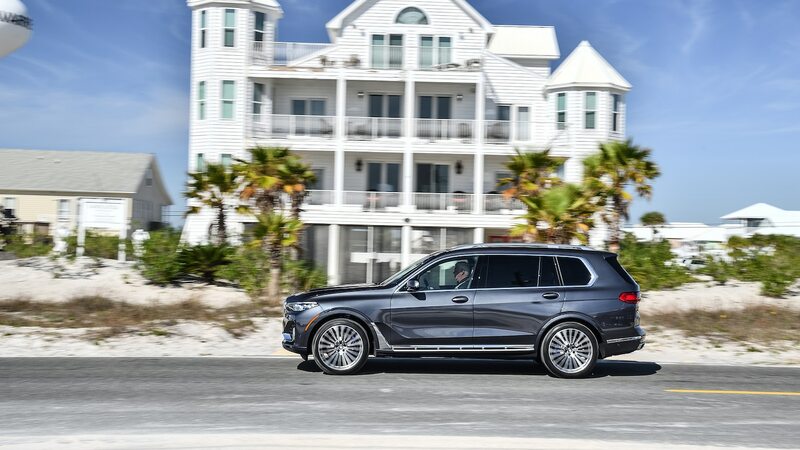 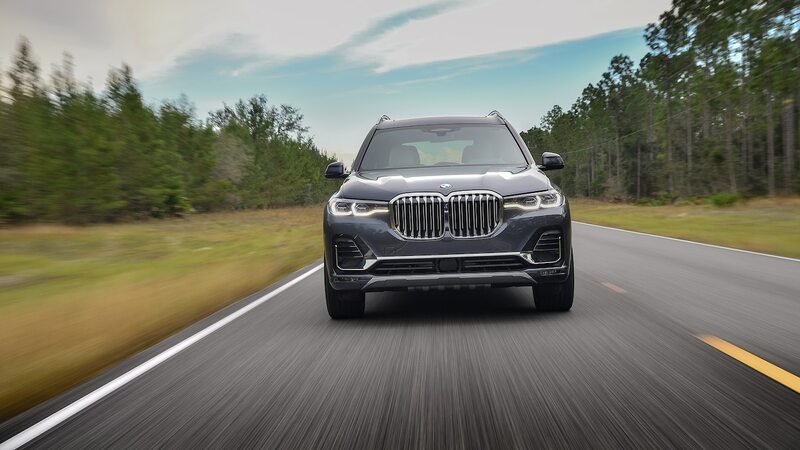 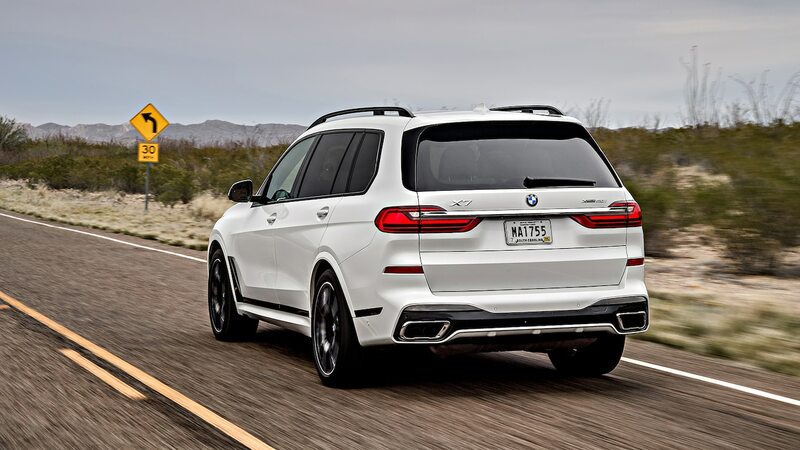 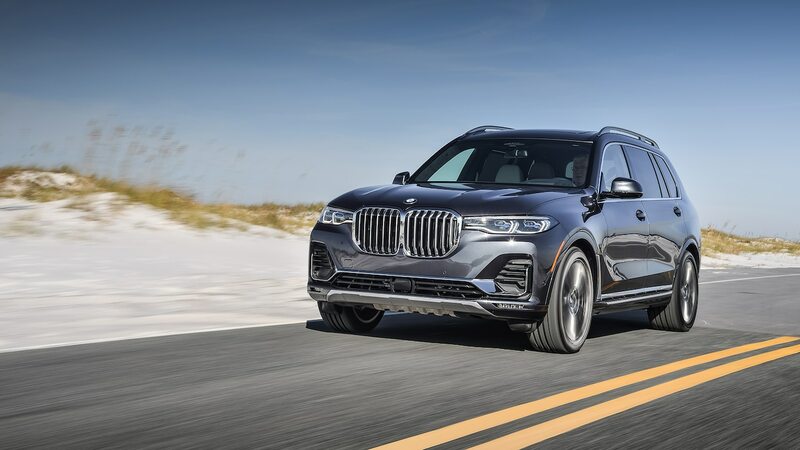 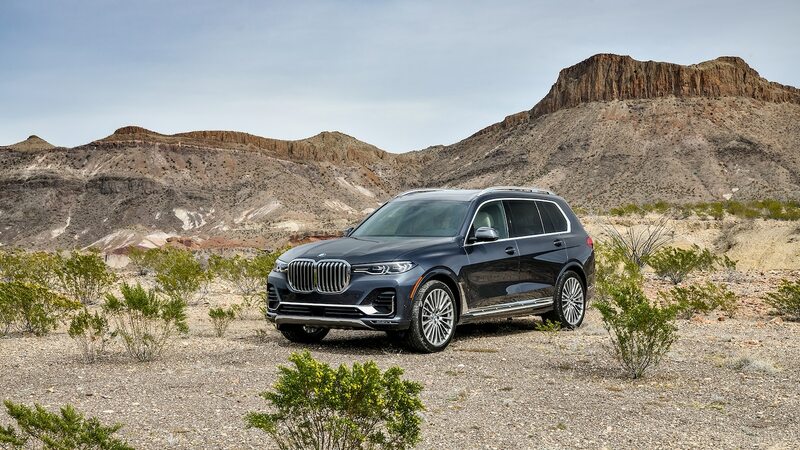 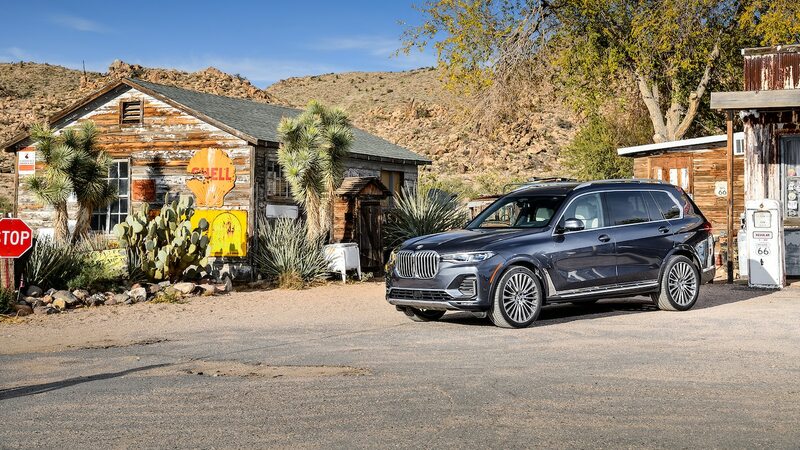 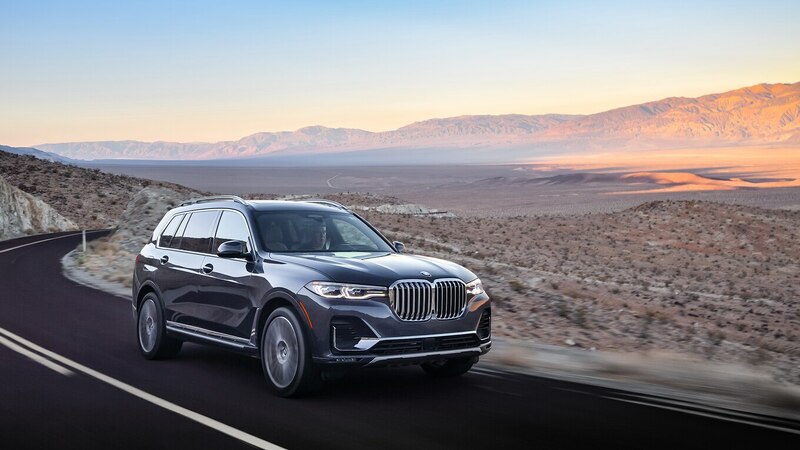 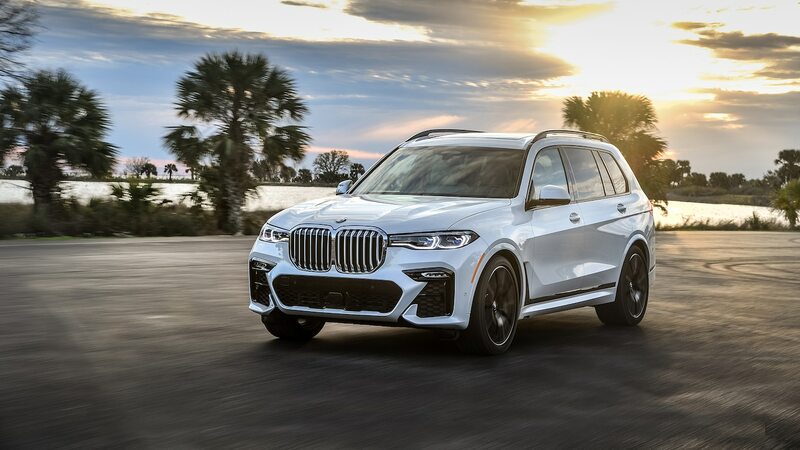 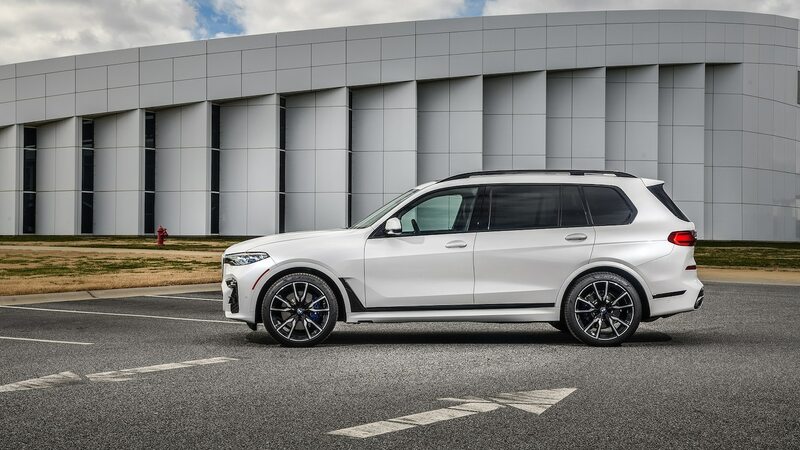 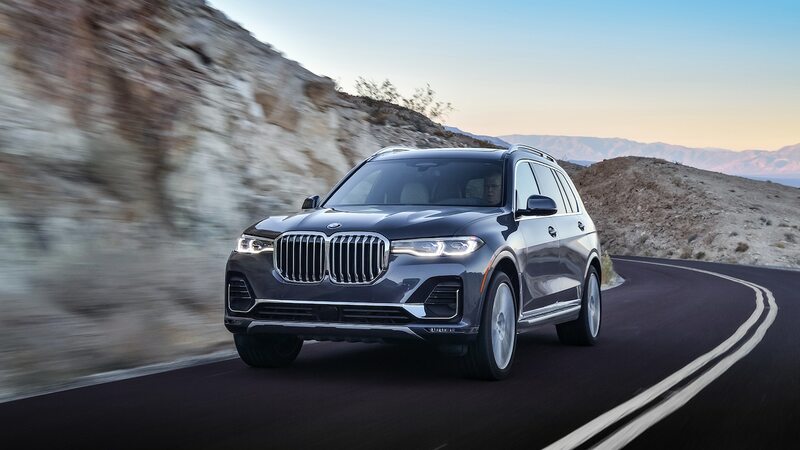 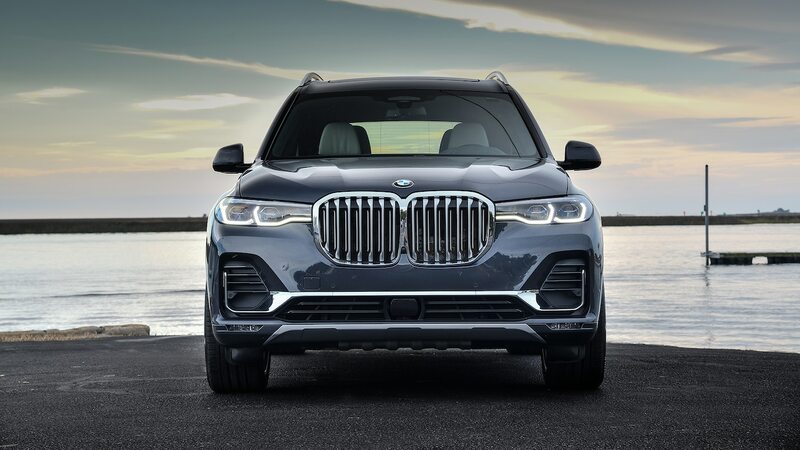 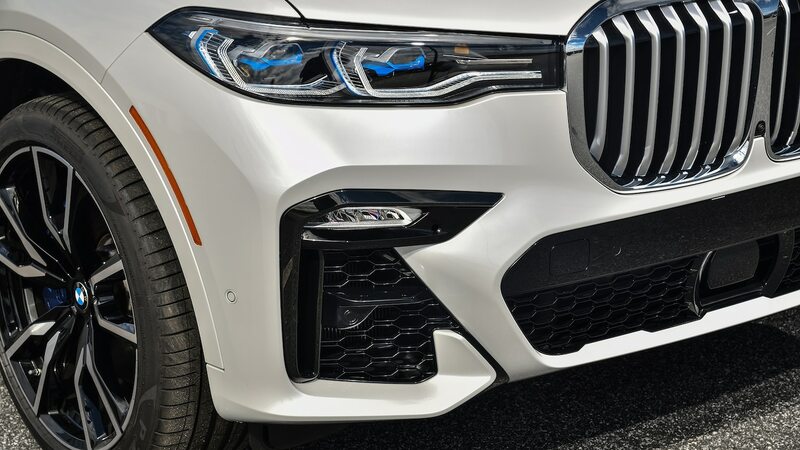 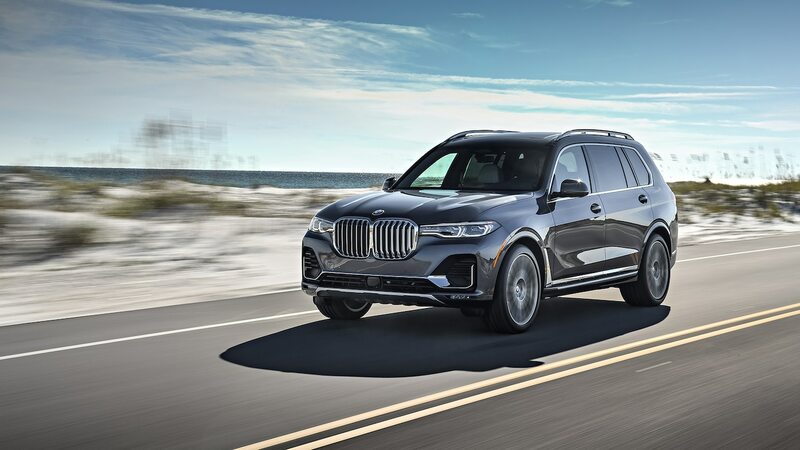 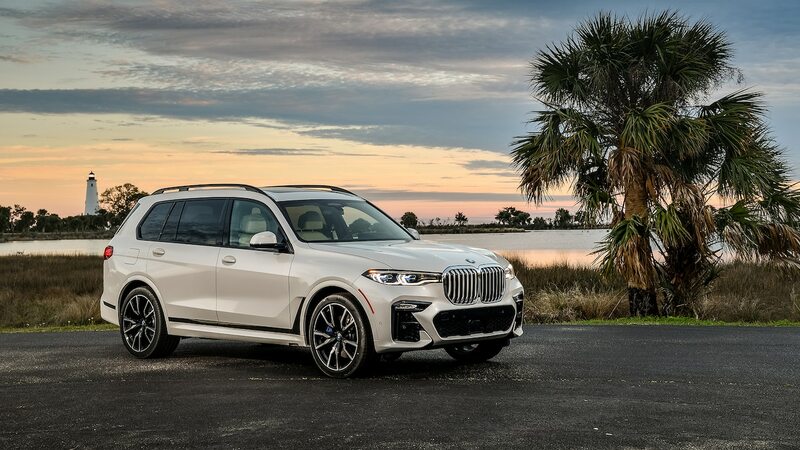 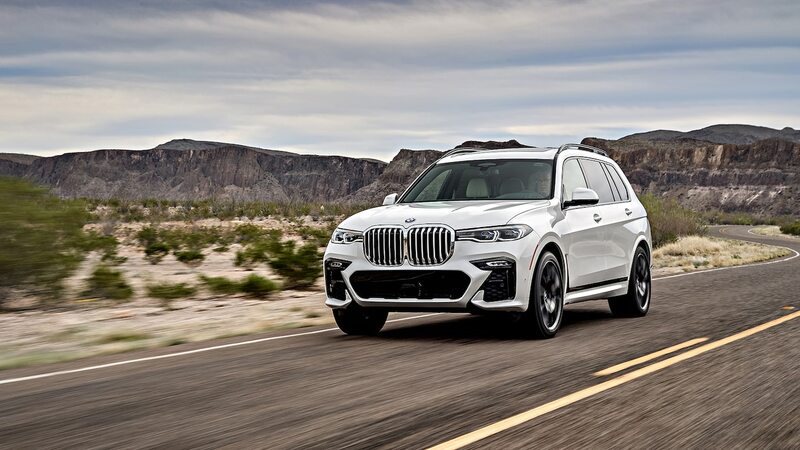 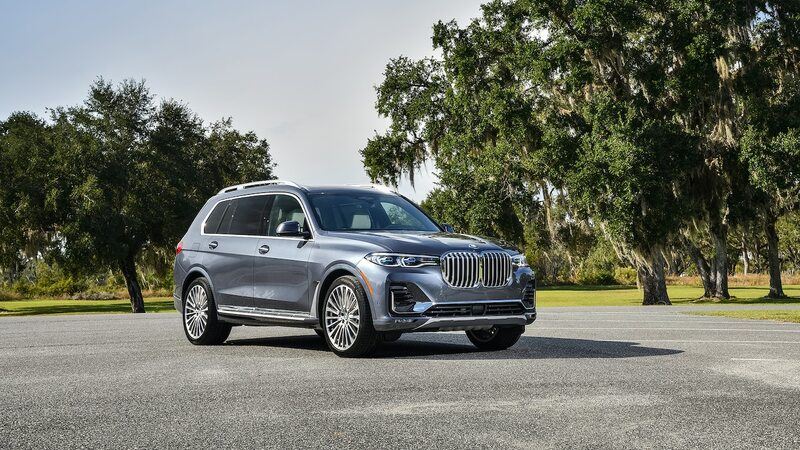 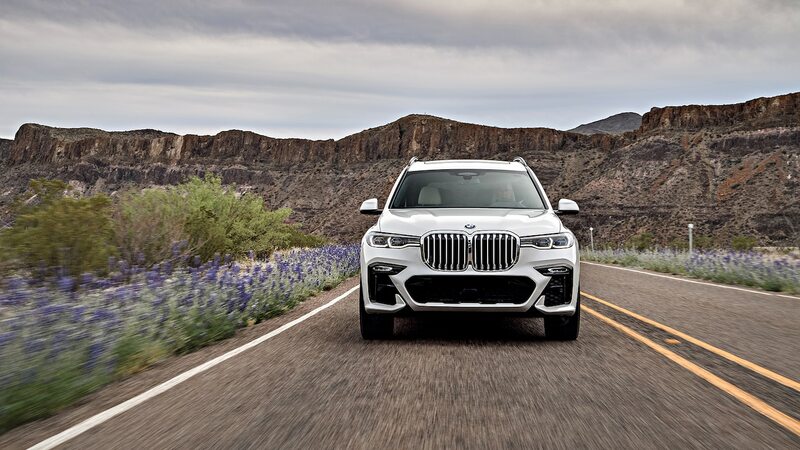 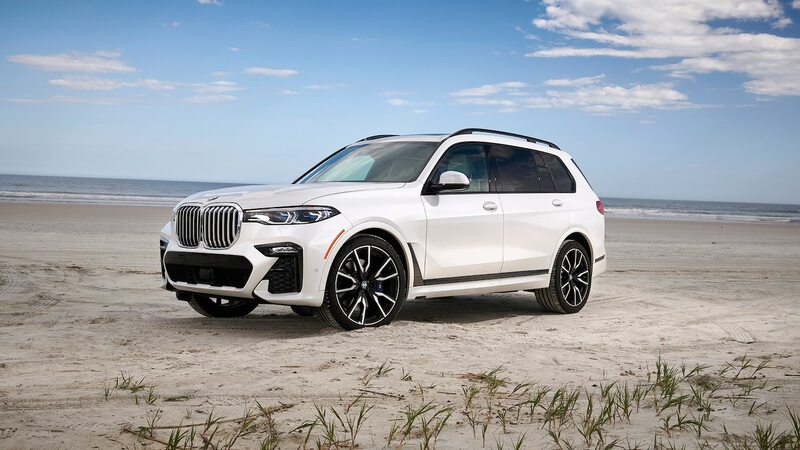 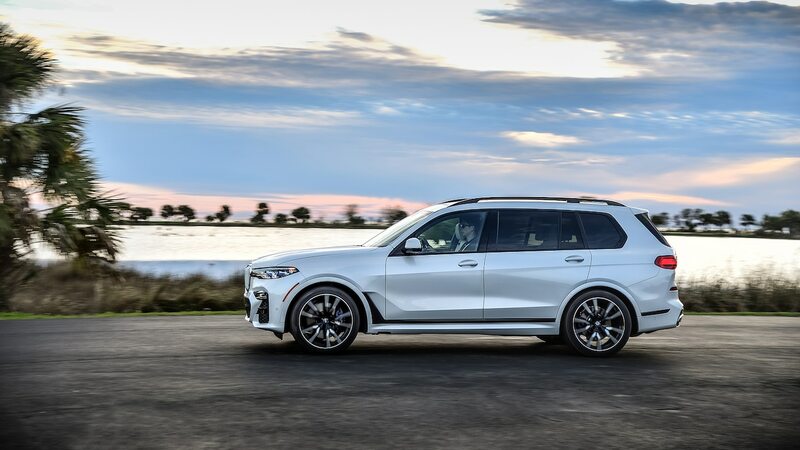 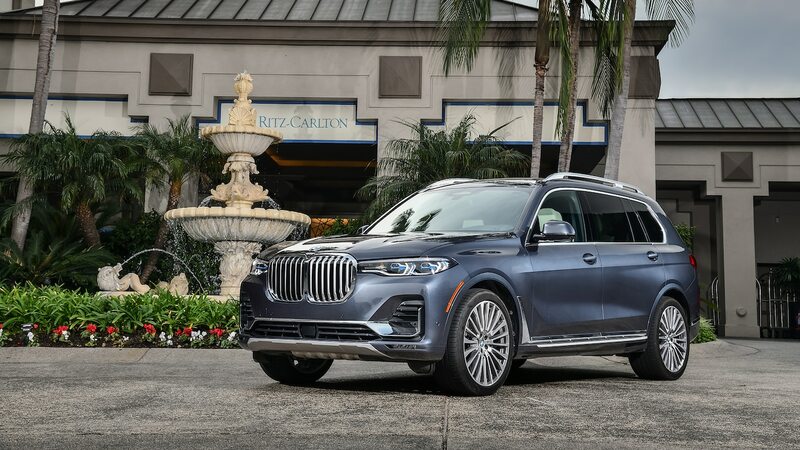 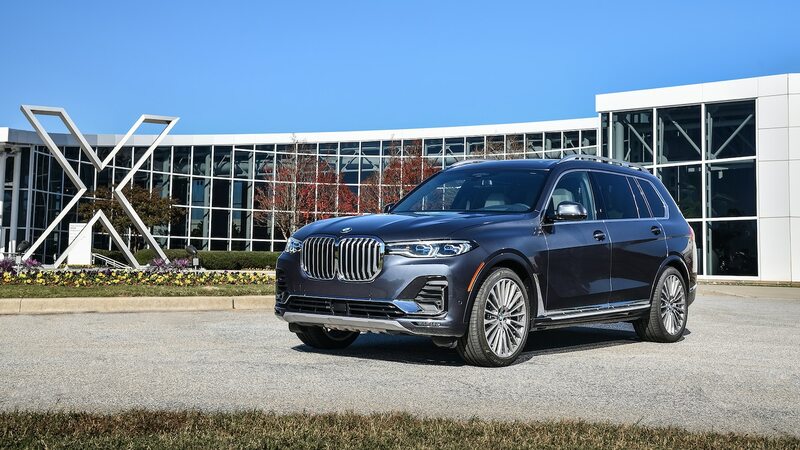 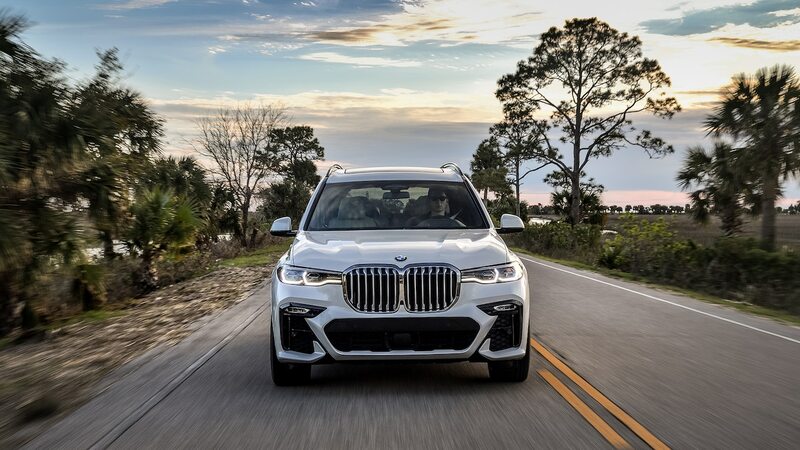 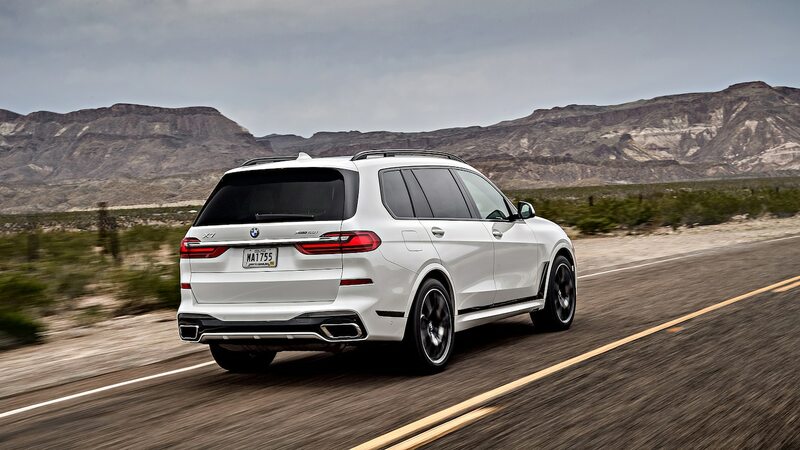 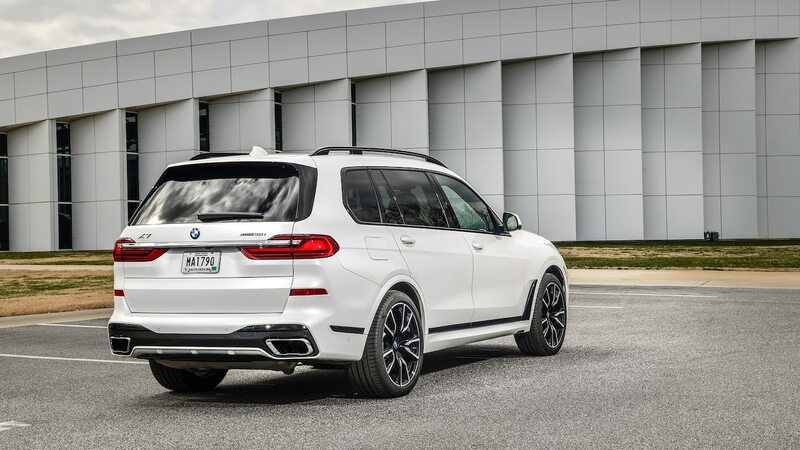 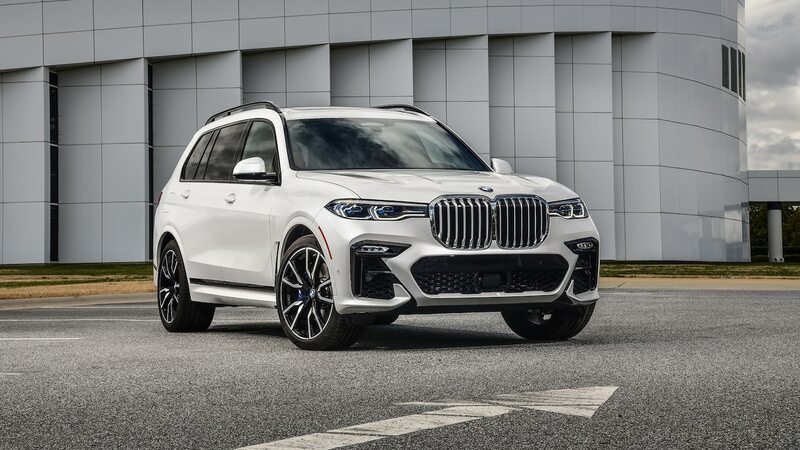 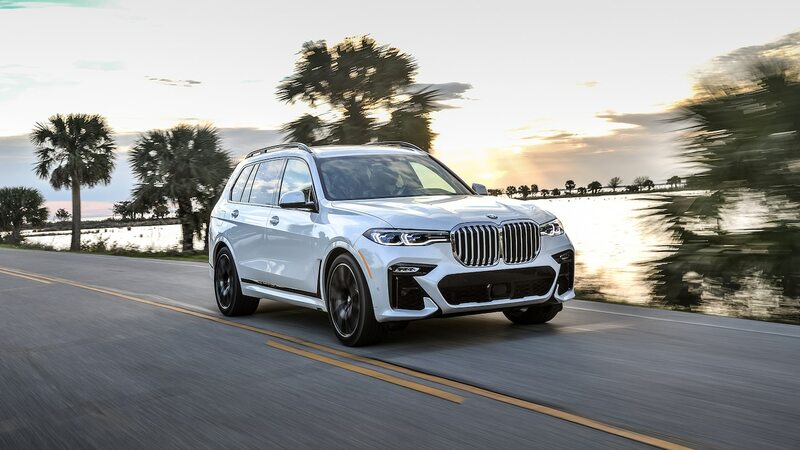 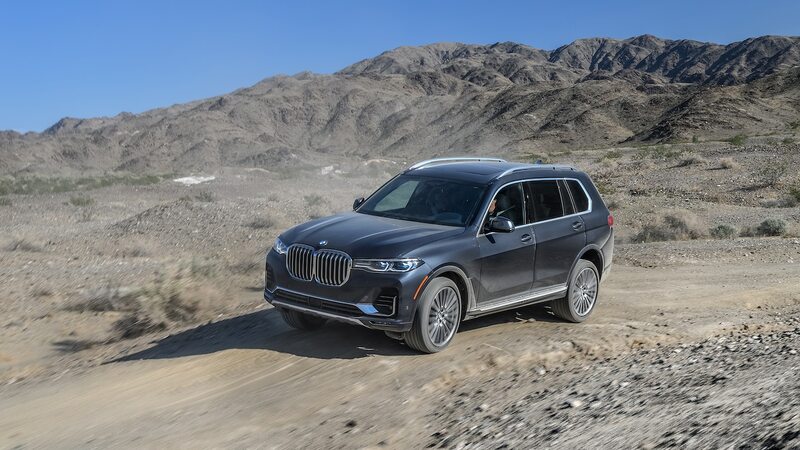 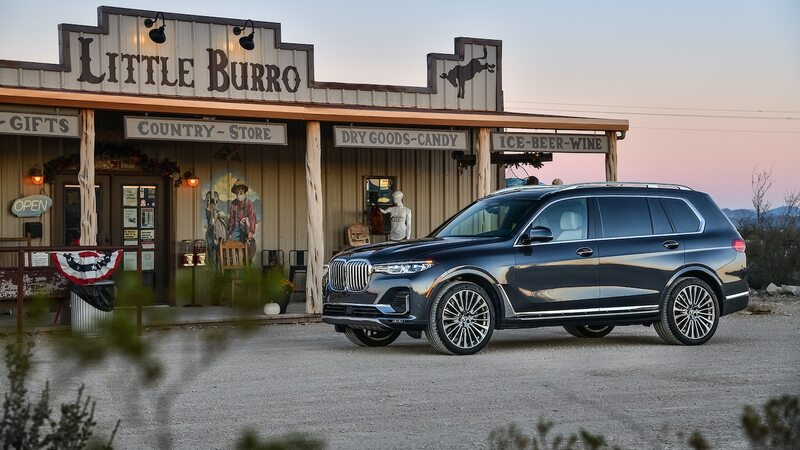 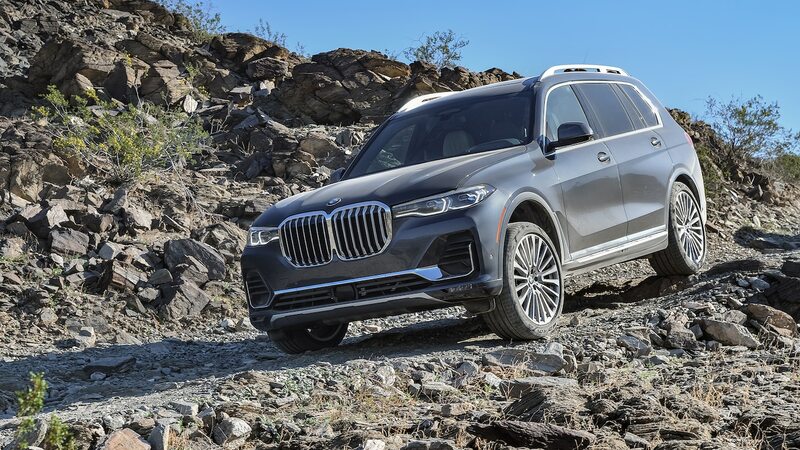 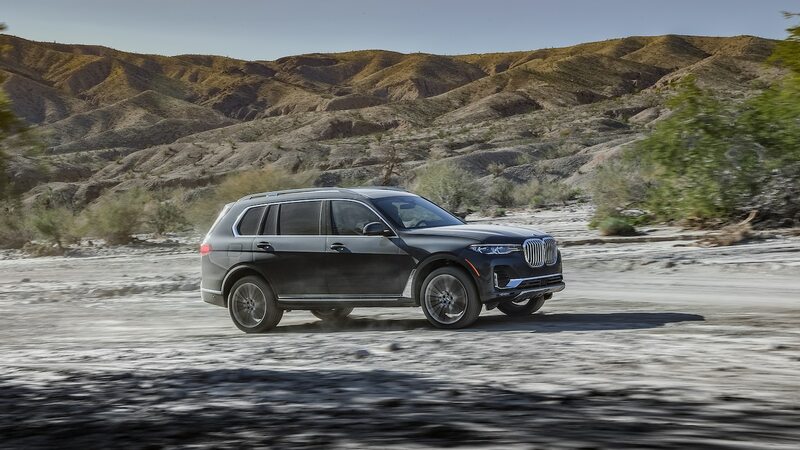 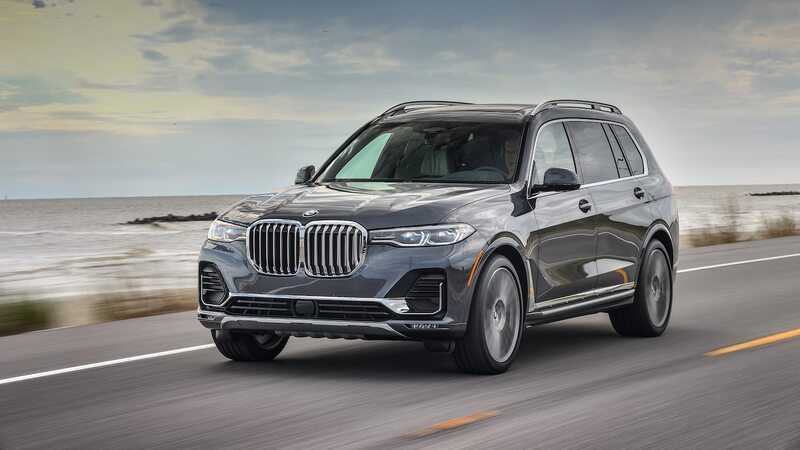 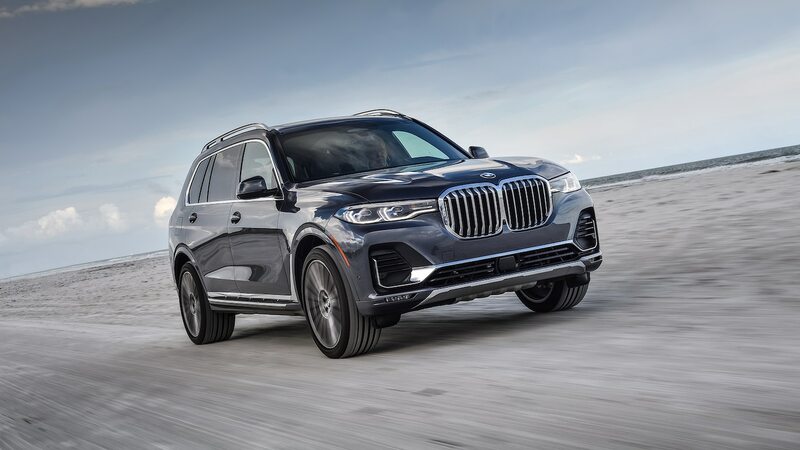 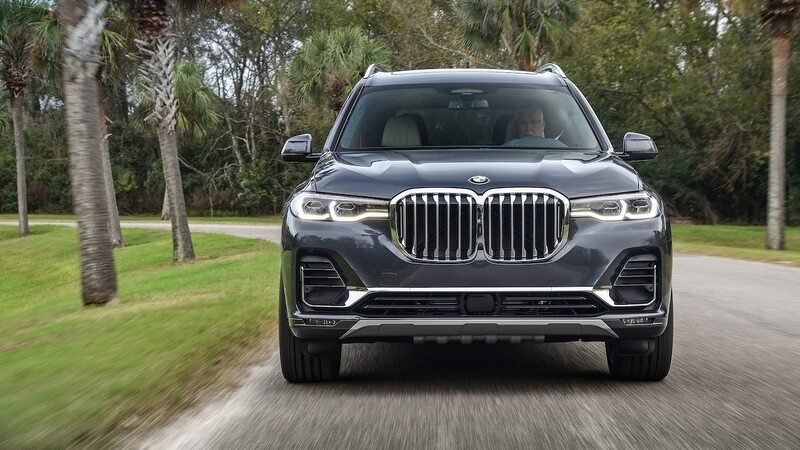 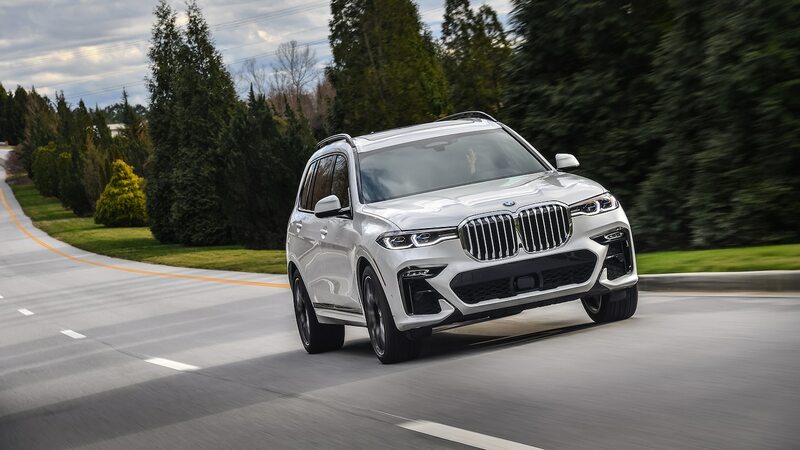 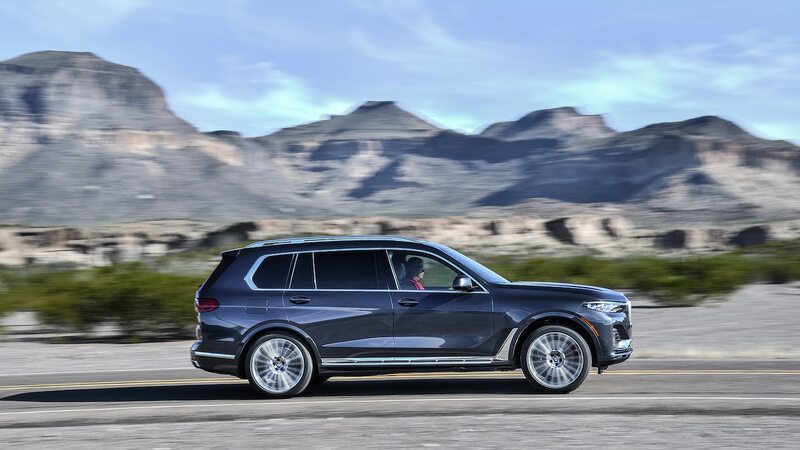 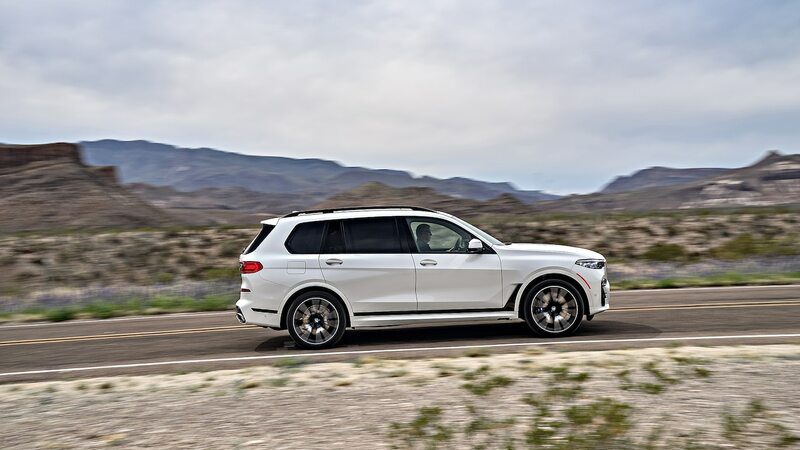 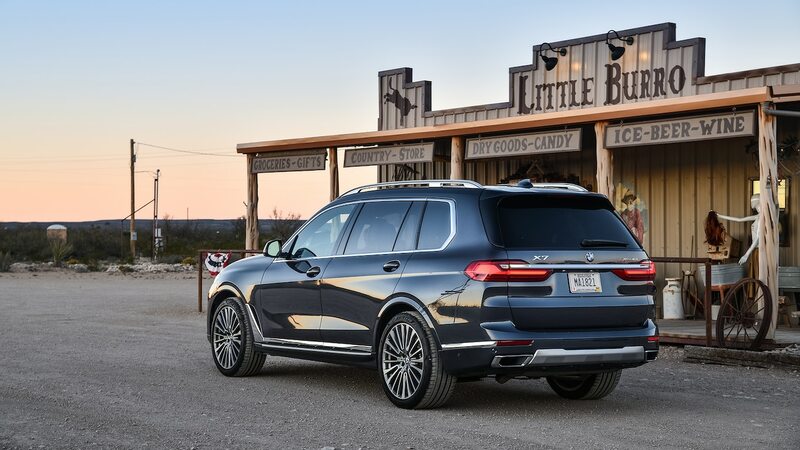 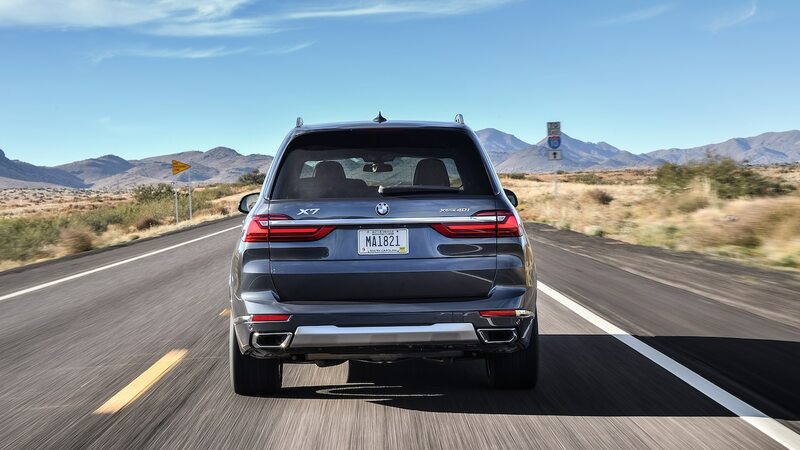 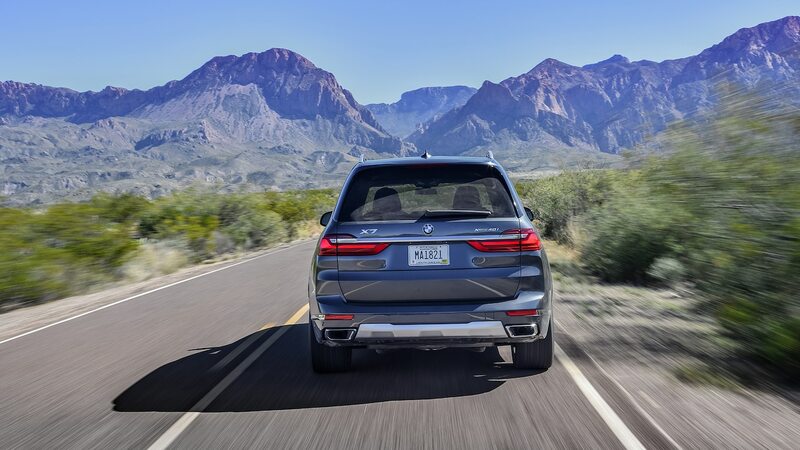 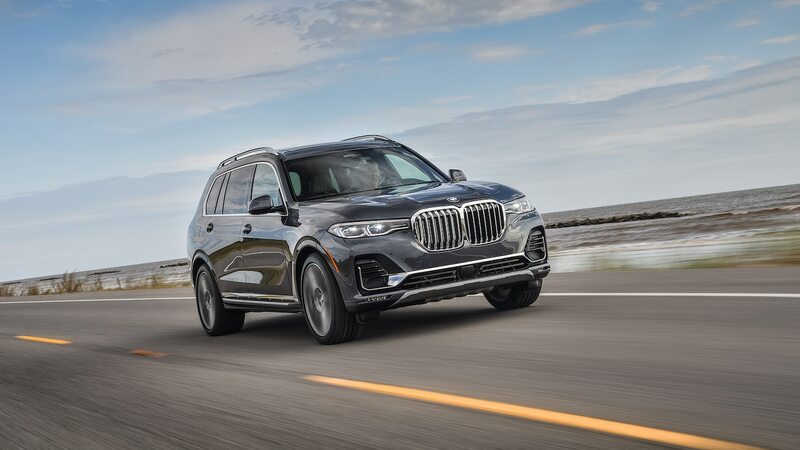 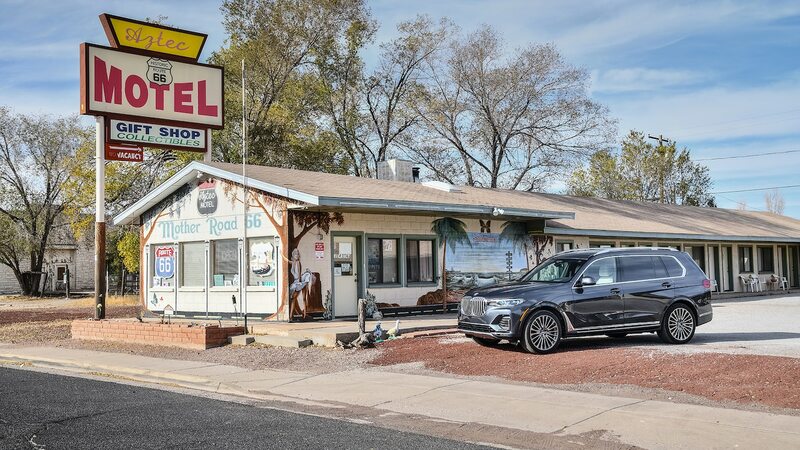 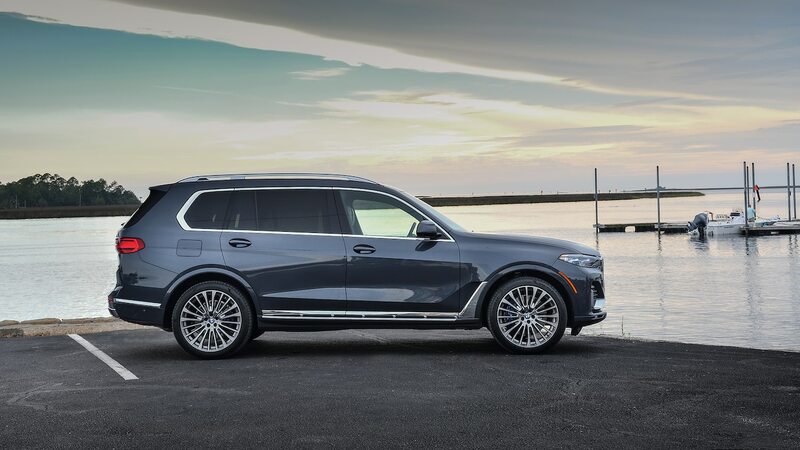 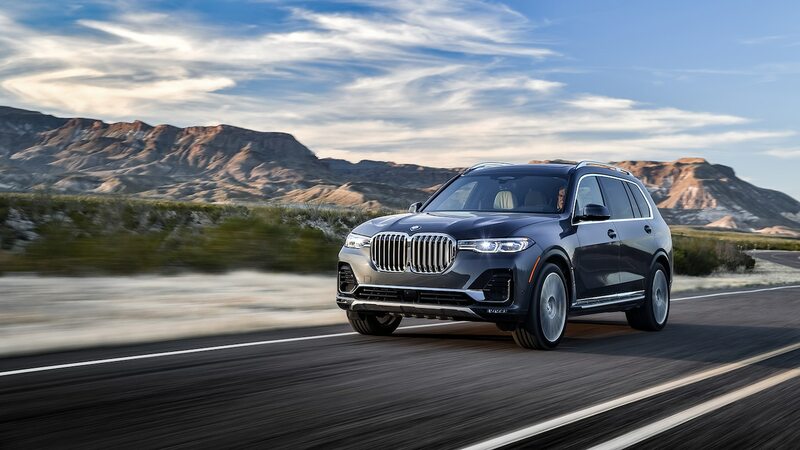 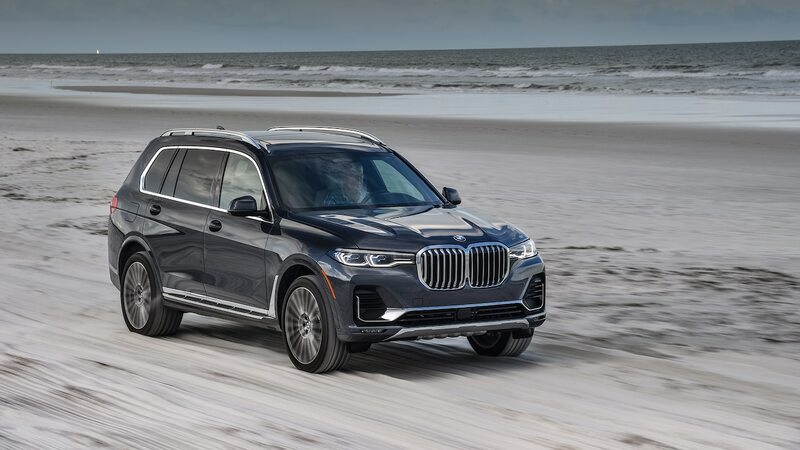 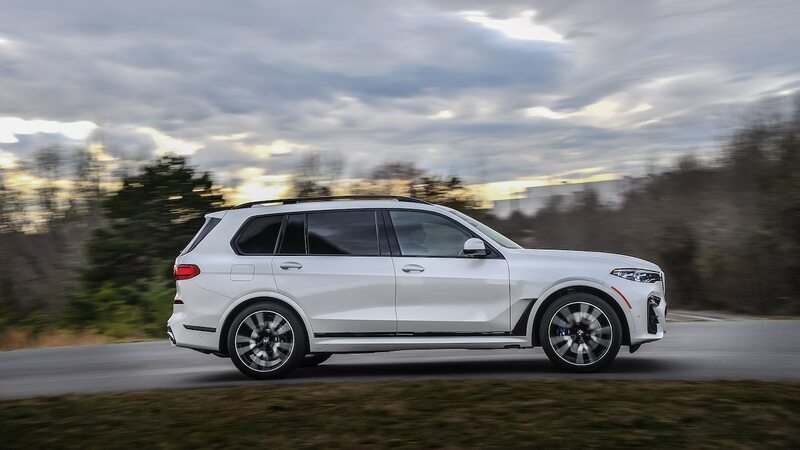 The X7 xDrive40i’s 3.0-liter turbocharged inline-six makes 335 hp and 330 lb-ft of torque, while upgrading to the xDrive50i gives you a 4.4-liter twin-turbo V-8 making 456 hp and 479 lb-ft of torque. 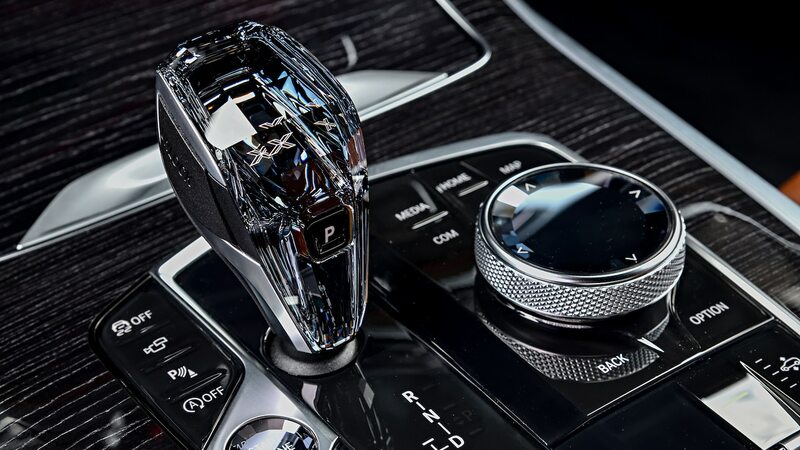 Both use an eight-speed automatic and come standard with all-wheel drive. 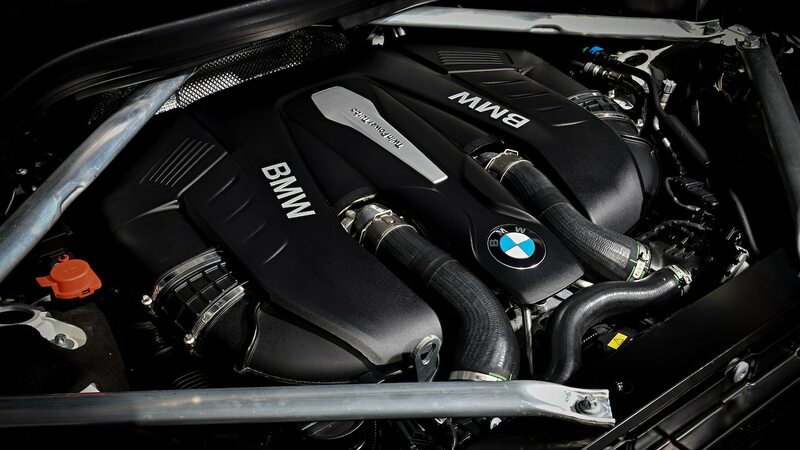 With power being sent to all four wheels, BMW claims a 0 to 60 time of 5.8 seconds for the I-6 and 5.2 seconds for the V-8. 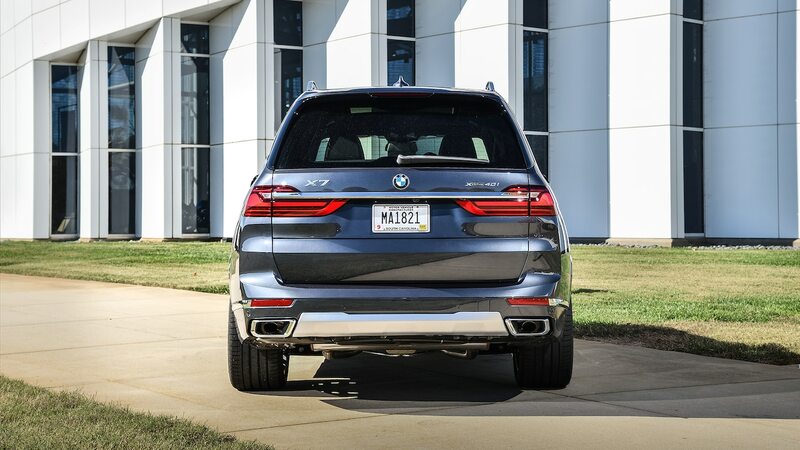 Considering the X7 weighs more than 5,000 lbs, that’s not bad. 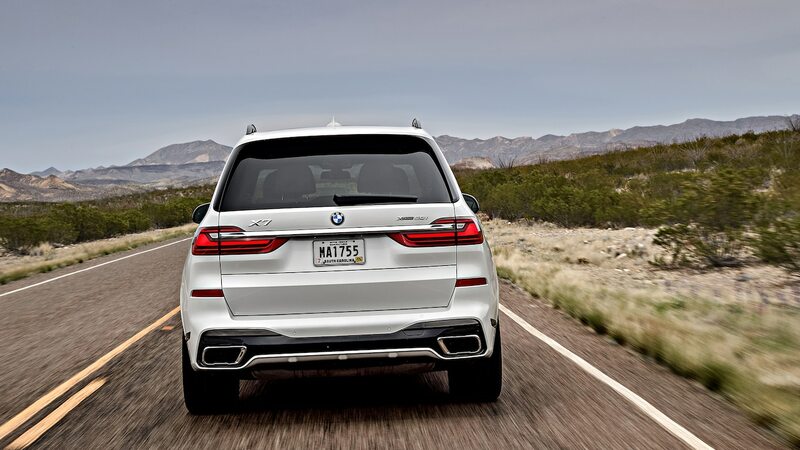 Neither version feels outright quick, but both provide plenty of passing power. 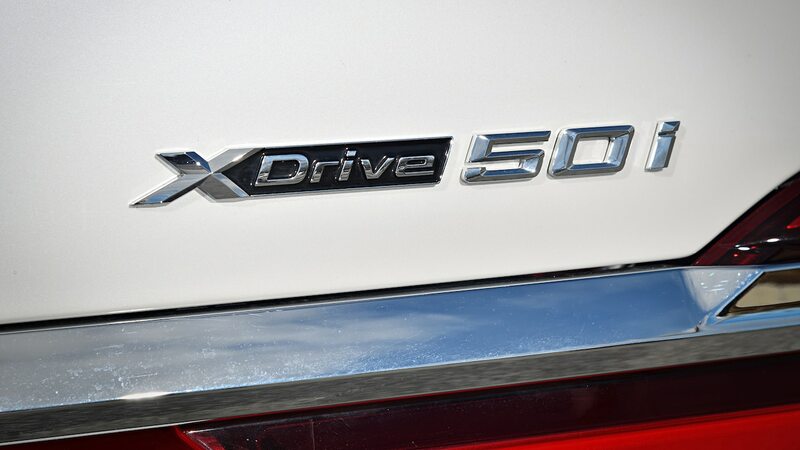 And even though the X7 xDrive50i has more power, the more noticeable difference between the two engines is their character. 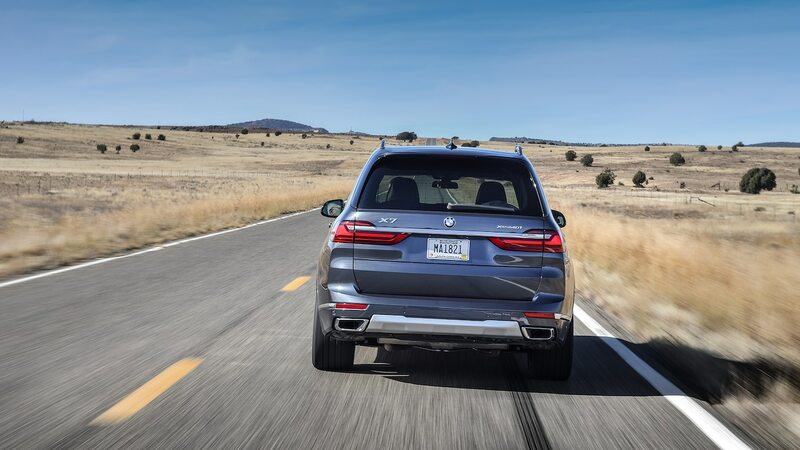 The I-6 is nice and smooth, but if you want torque and that rumbling exhaust note, the V-8 is the engine to pick. 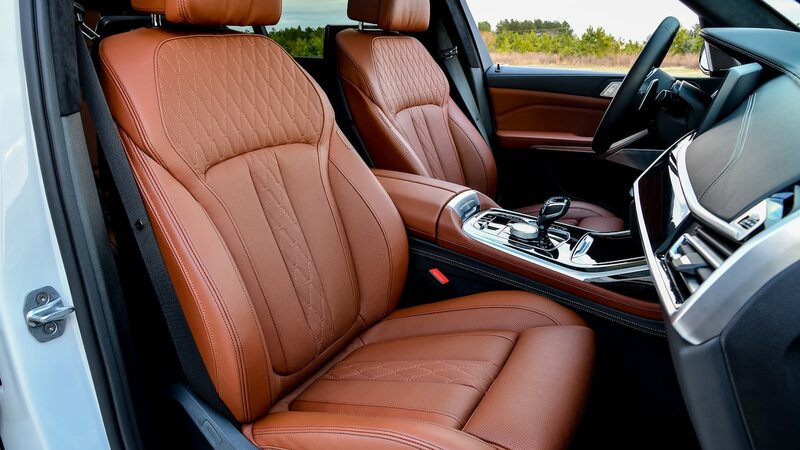 On the road, the ride quality is as impressive as the seriously comfortable seats would suggest. 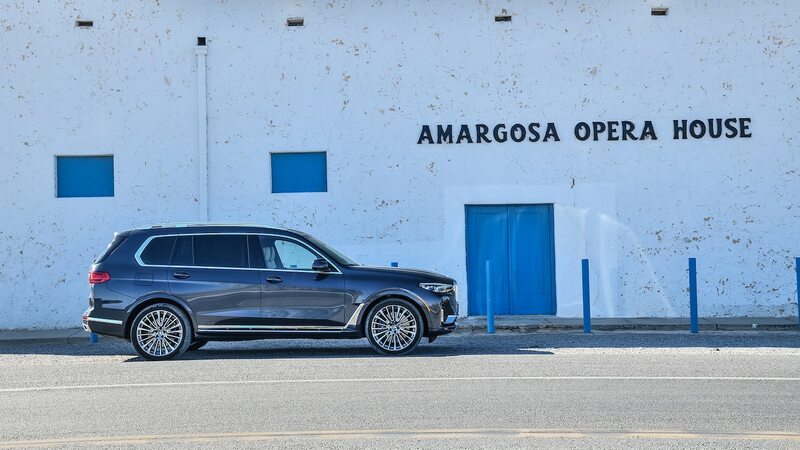 That’s probably partly due to the fact that the X7 is built on the same flexible architecture as the 7 Series, but the real credit goes to the standard two-axle air suspension with adaptive dampers. 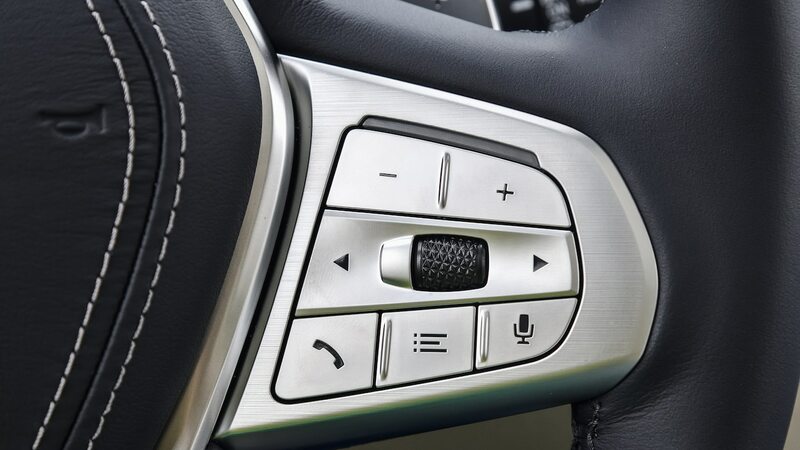 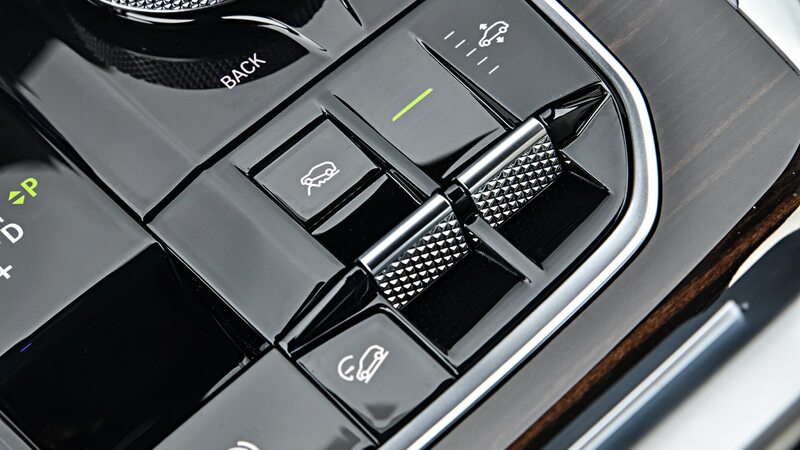 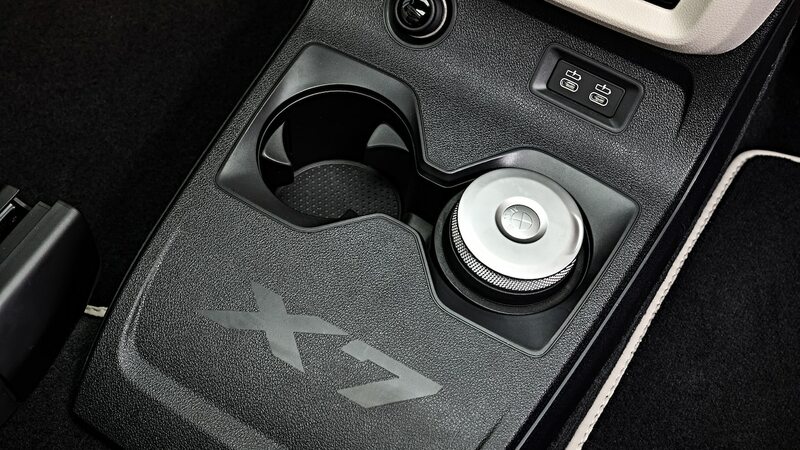 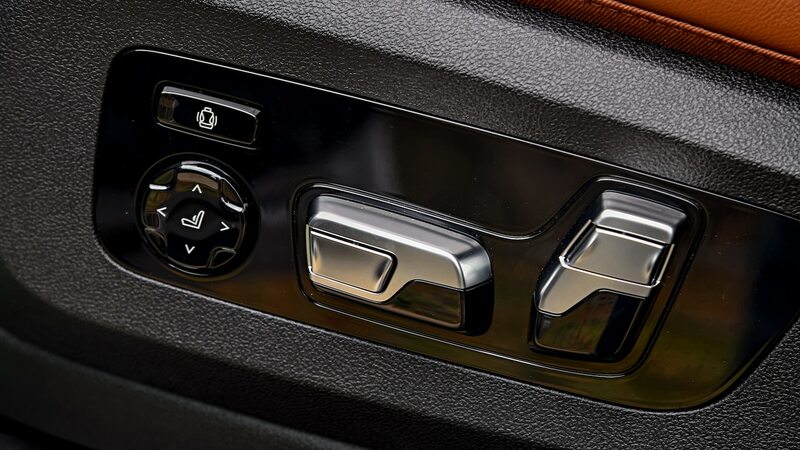 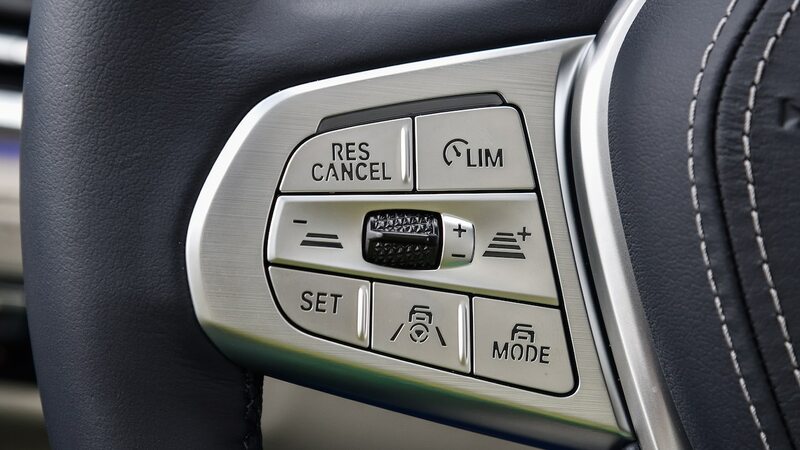 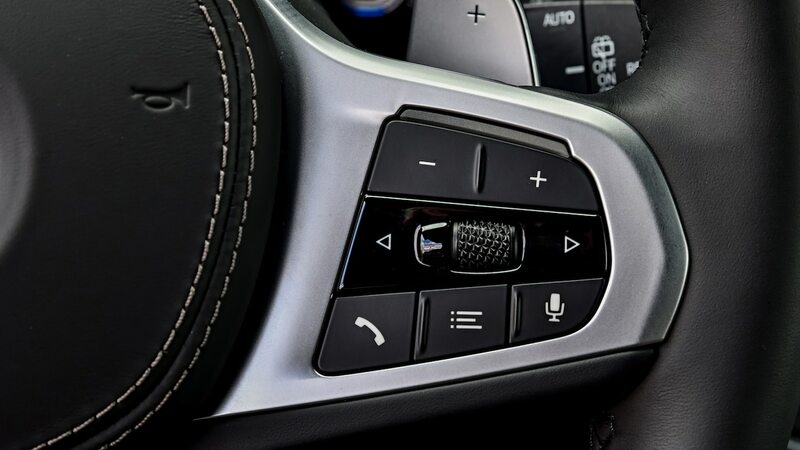 Switch from Comfort mode to Sport, Adaptive, or Eco Pro, and you’ll notice a marked difference in how the X7 feels. 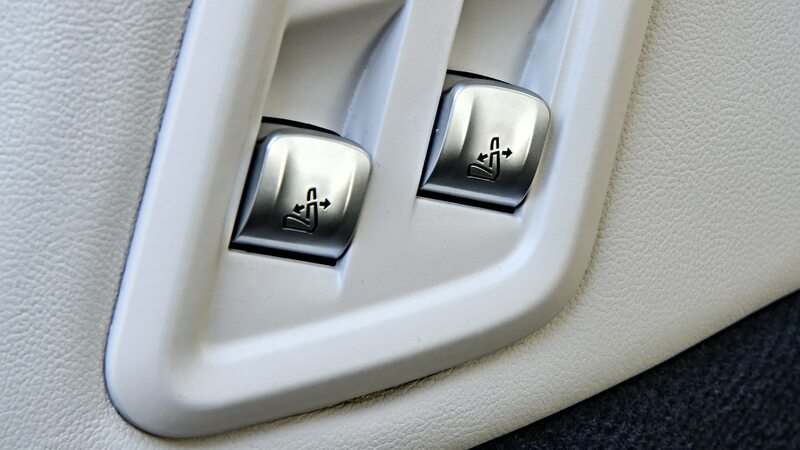 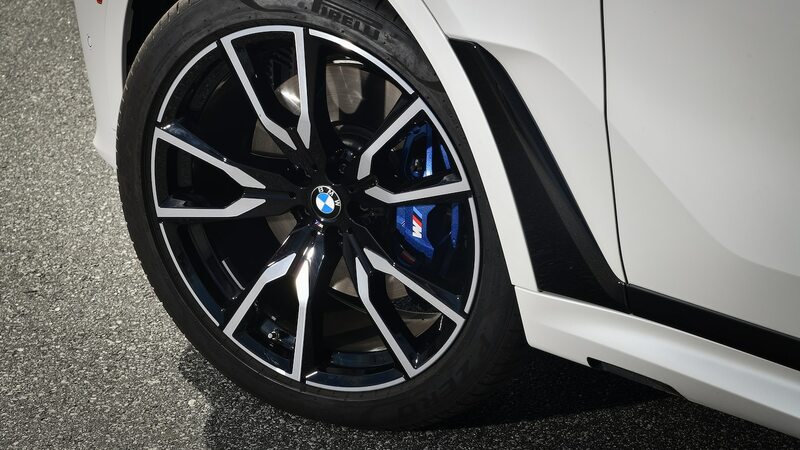 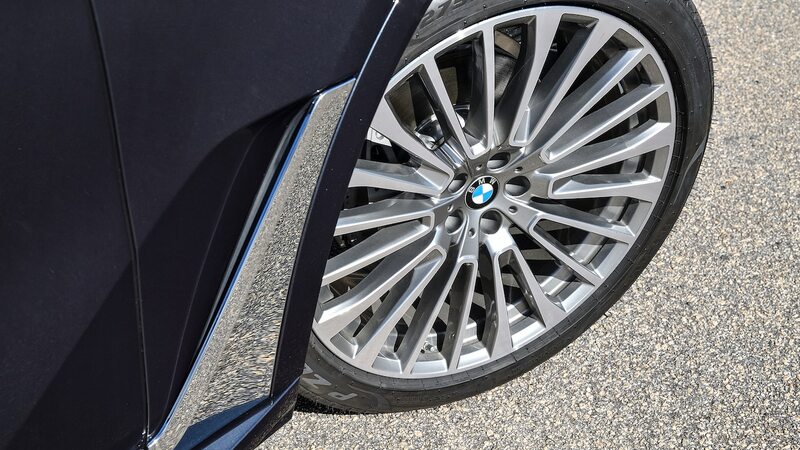 We also appreciate the fact that BMW included a Sport Individual option that allowed us to put the suspension in Comfort mode and everything else on Sport for more enjoyable highway cruising. 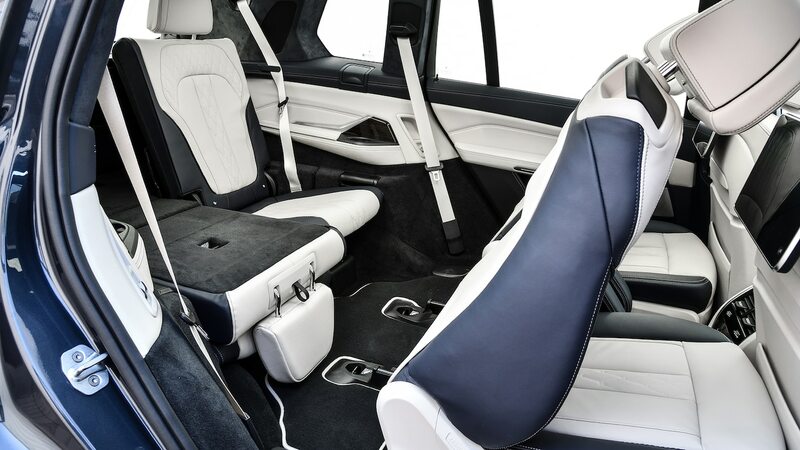 But even though putting the suspension in Sport mode firms it up and reduces body roll, there’s only so much that even the best engineers in the world can do about mass. 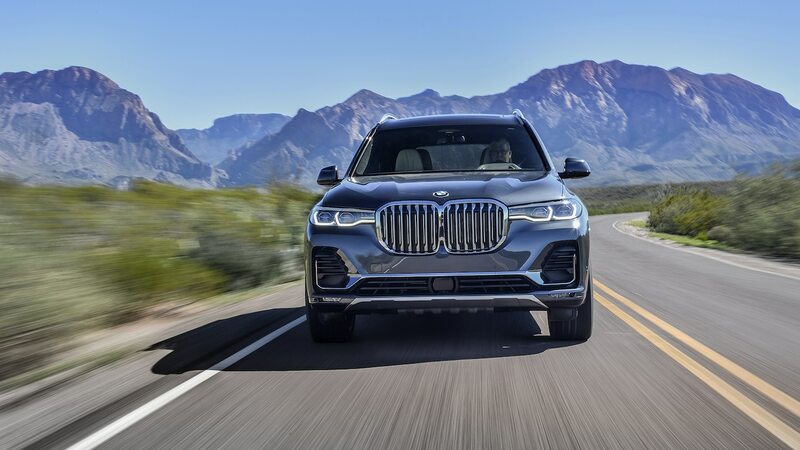 As one particularly long stretch of winding road proved, the X7 might be slightly better suited for the job than some of its competitors, corner carving is not its strong suit. 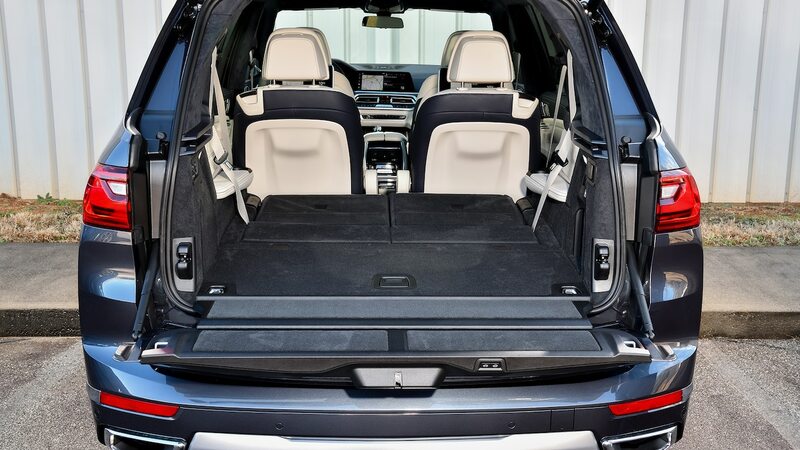 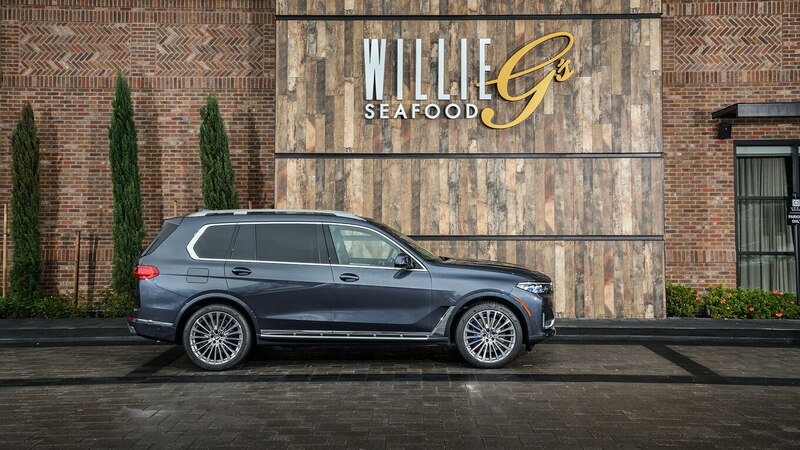 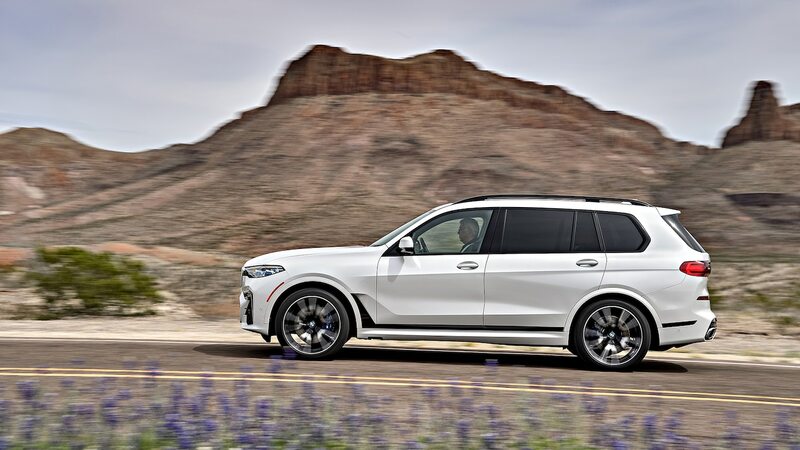 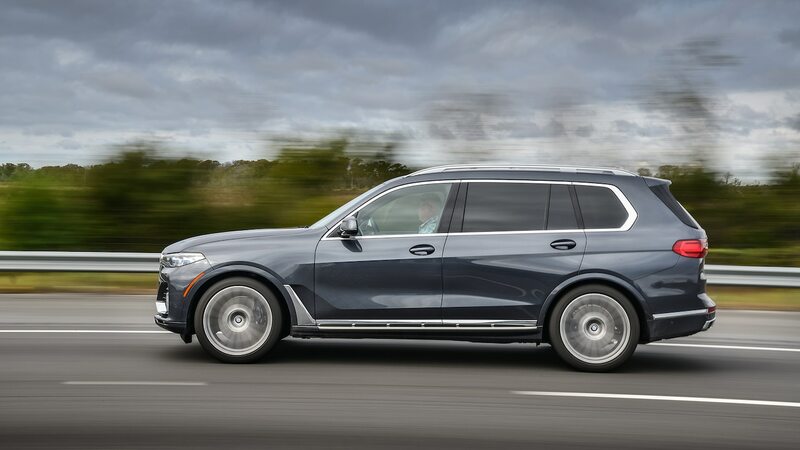 Since we’re talking about a full-size luxury SUV, that’s probably to be expected. 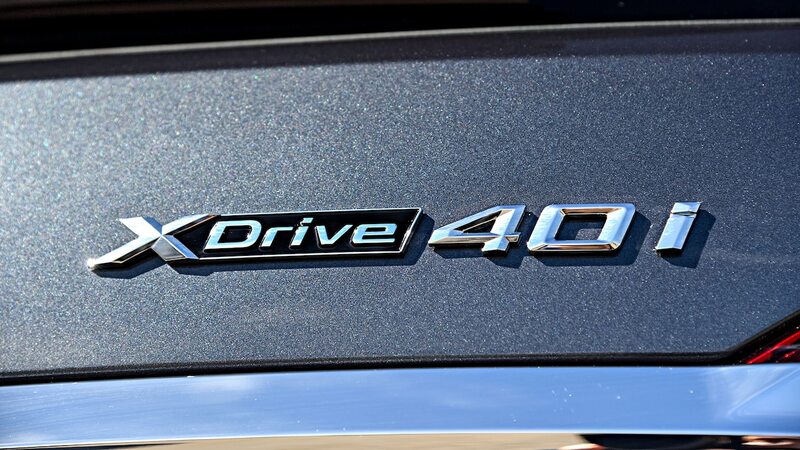 But what I didn’t expect was for the steering assist that’s optional on the 40i and standard on the 50i to be able to handle such sharp turns. 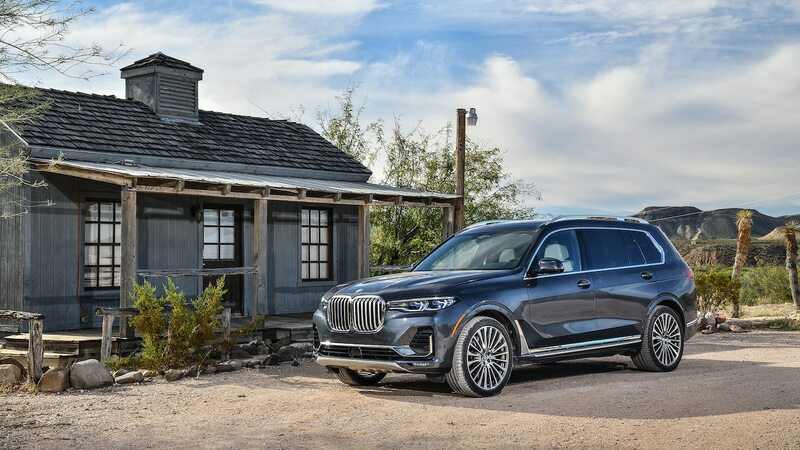 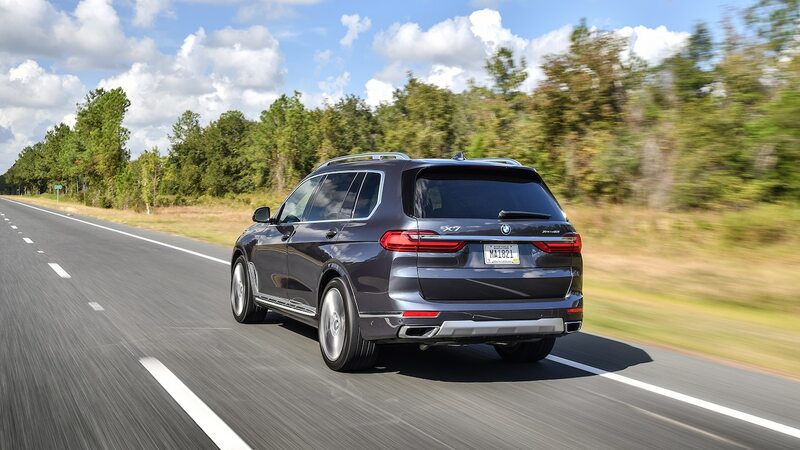 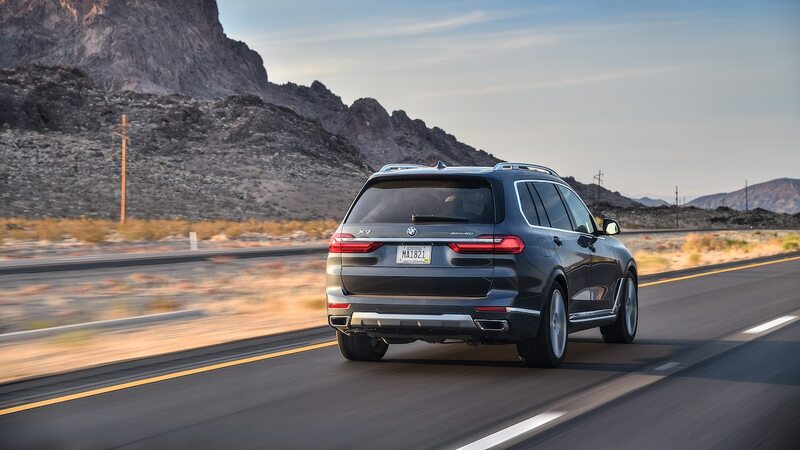 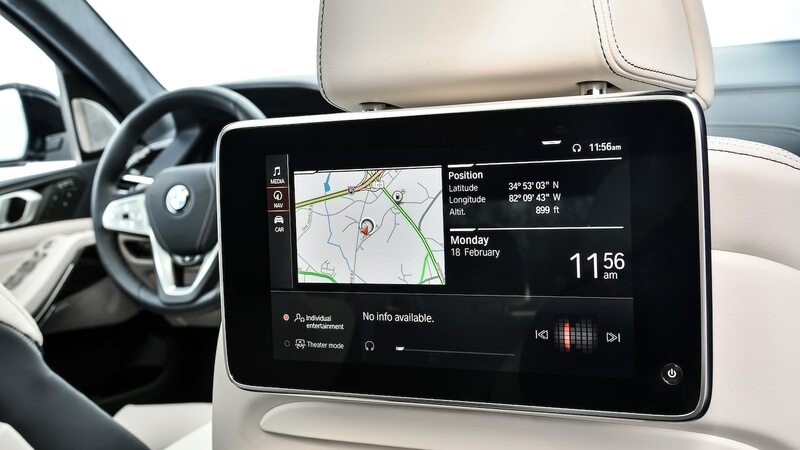 As recently as a few years ago, BMW’s driver-assist features lagged behind some of its competitors, but at least on the X7, it’s been massively improved. 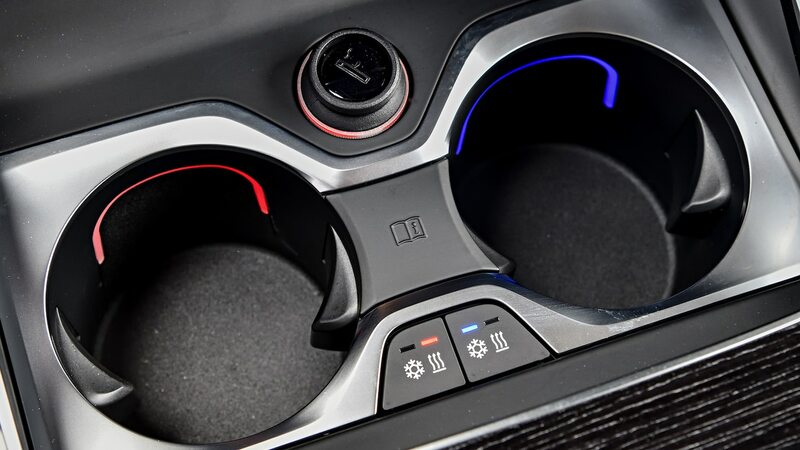 In its most aggressive setting, the steering assist is almost too sensitive, which results in near-constant “corrections” that ping-pong the car between the lane markers. 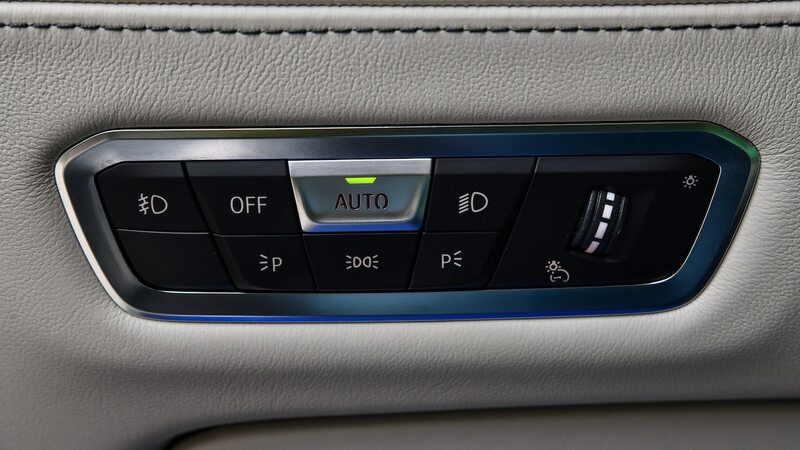 But if you adjust the sensitivity, it works much better and not just on straight highways, either. 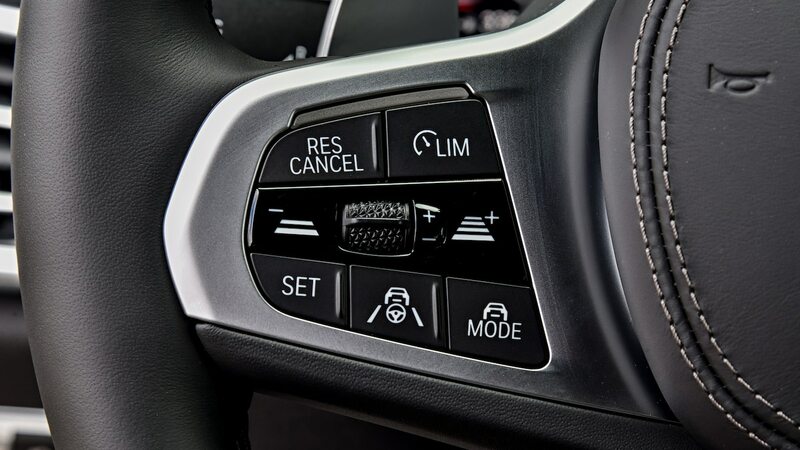 Basically, as long as the turn isn’t so sharp that the car can’t see around it, the steering assist does just fine. 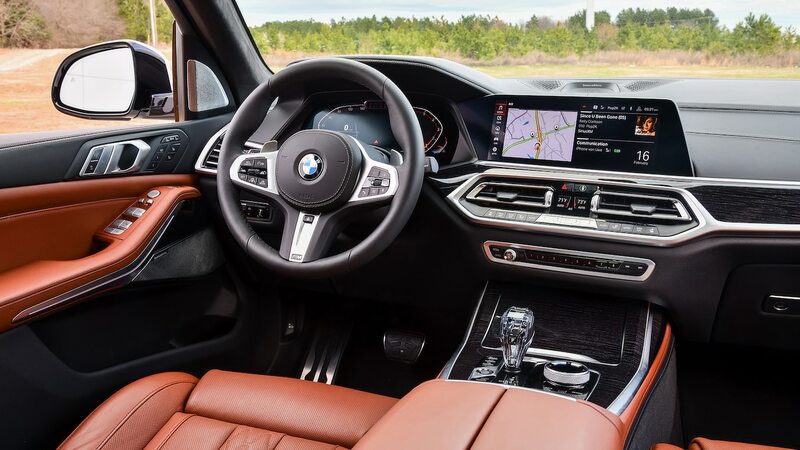 A driver-monitoring camera and steering wheel sensor force you to pay attention and keep your hand on the wheel if you want to use the steering assist, but on long trips, it can really take the stress out of highway driving. 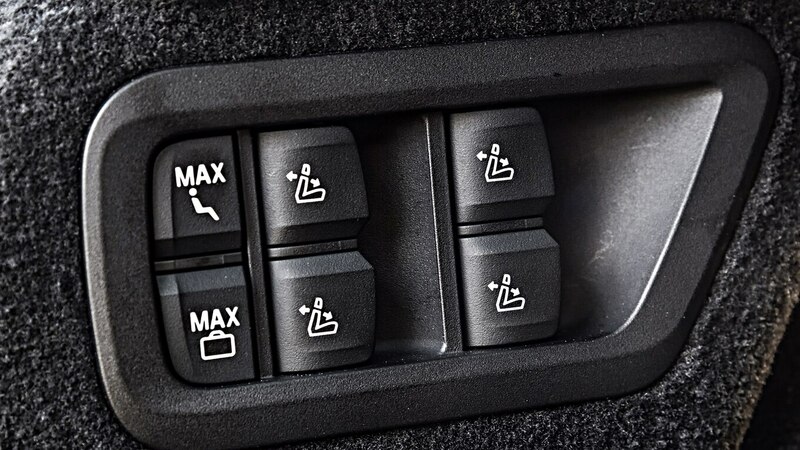 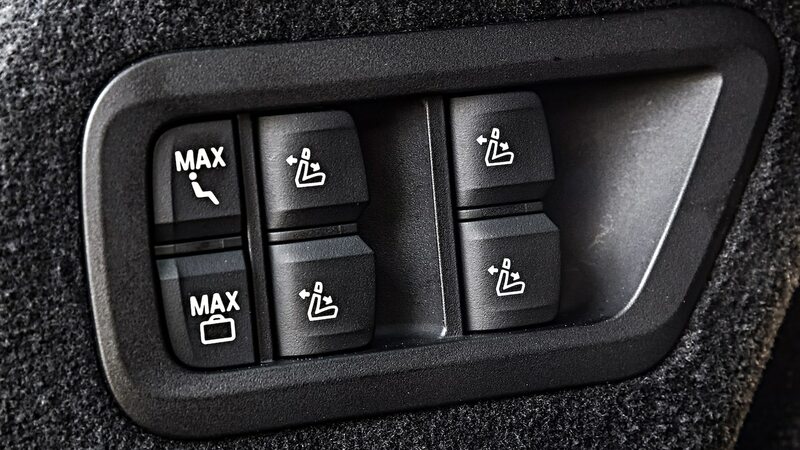 And at low speeds, the driver-assist package also includes a traffic jam assist feature that lets you take your hand off the steering wheel as long as you’re paying attention to the road and not driving faster than 37 mph (60 km/h). 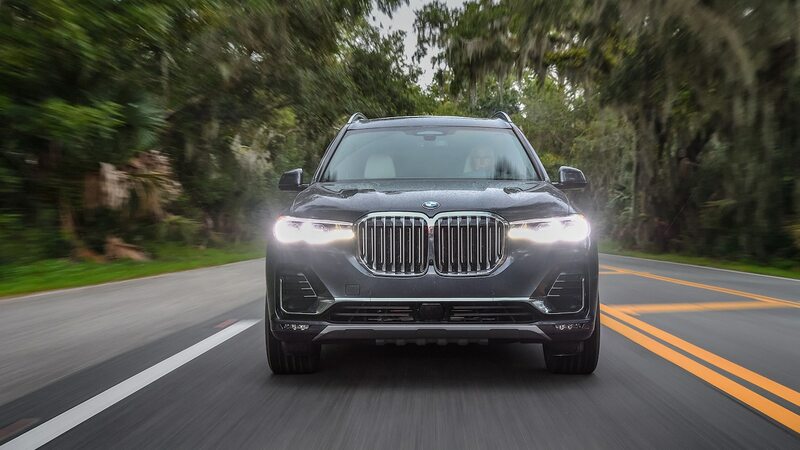 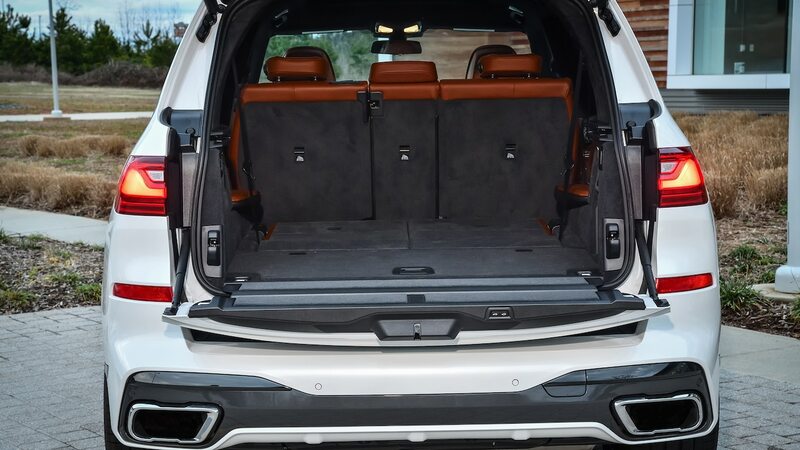 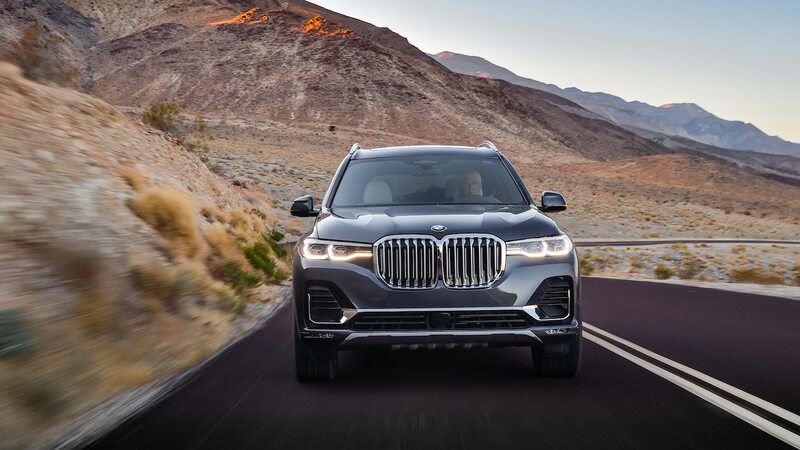 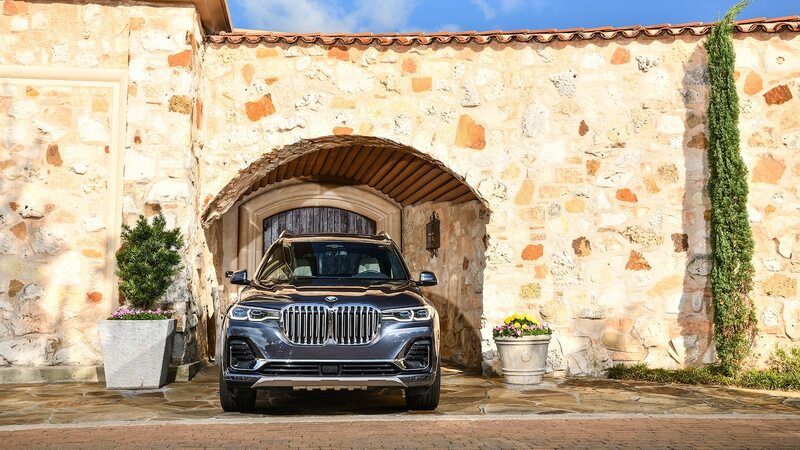 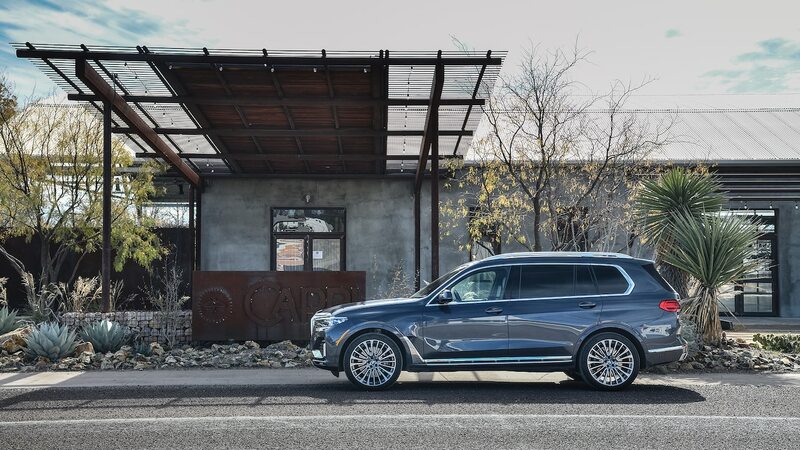 With some cutting-edge technology, a stand-out design, and an incredibly luxurious interior, the X7 lives up to its designation as the 7 Series of SUVs. 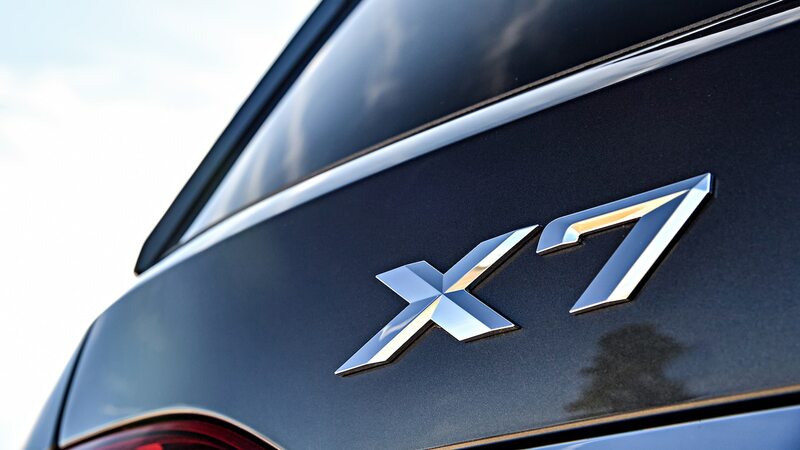 In fact, we wouldn’t be surprised to see X7 sales outpace its sedan counterpart within a matter of months. 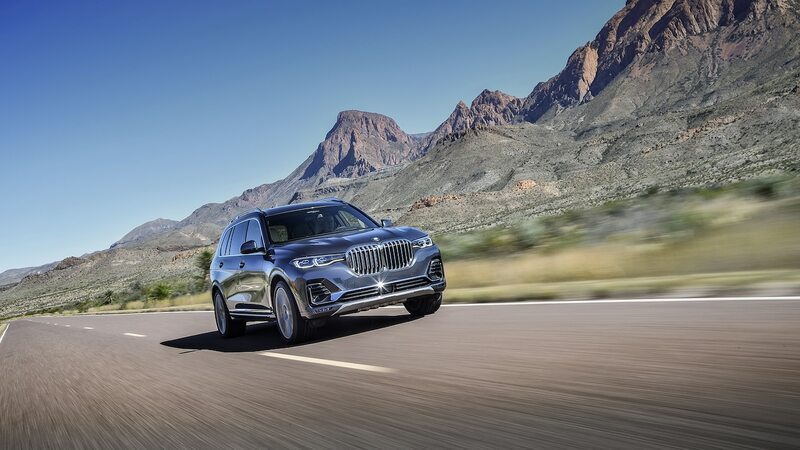 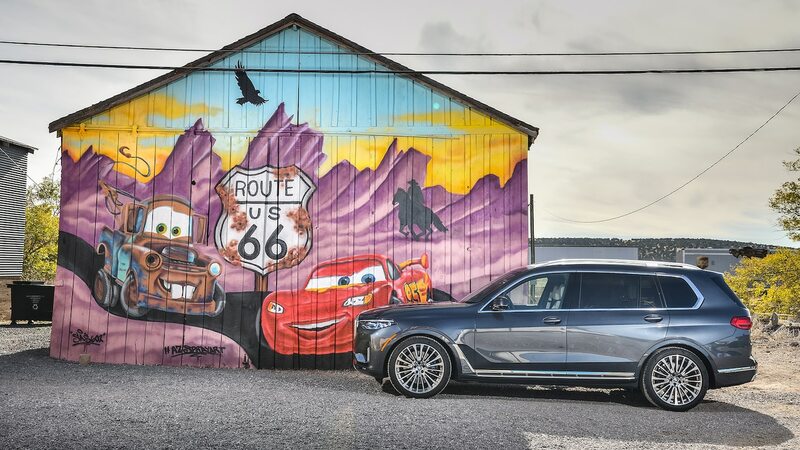 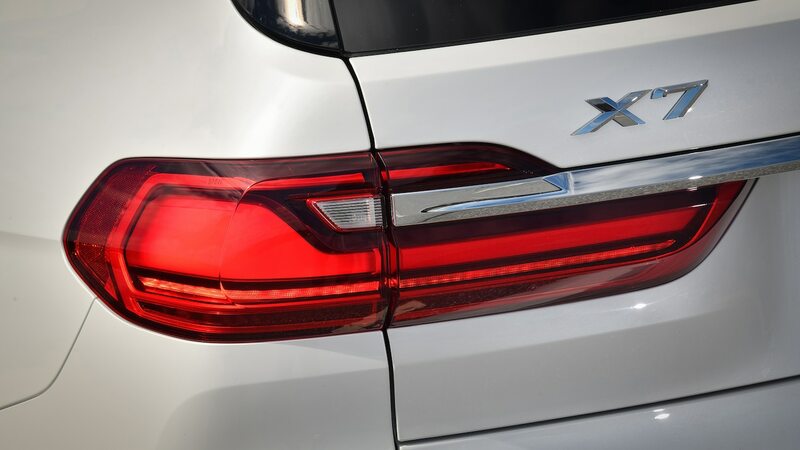 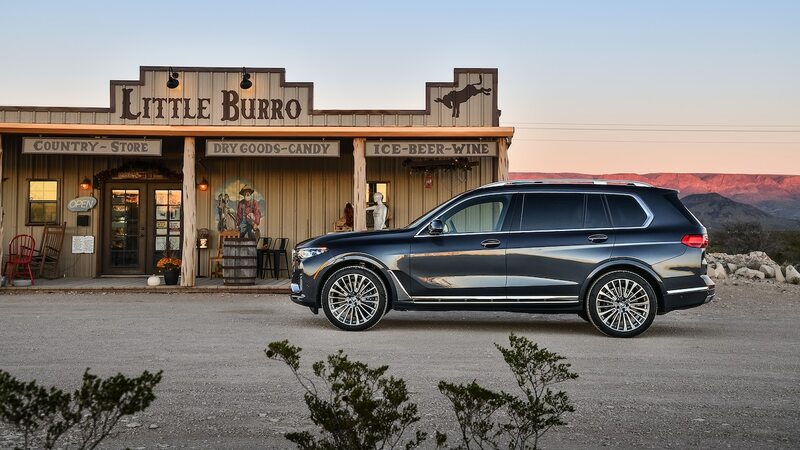 You don’t have to wait to give the X7 a test drive, either. 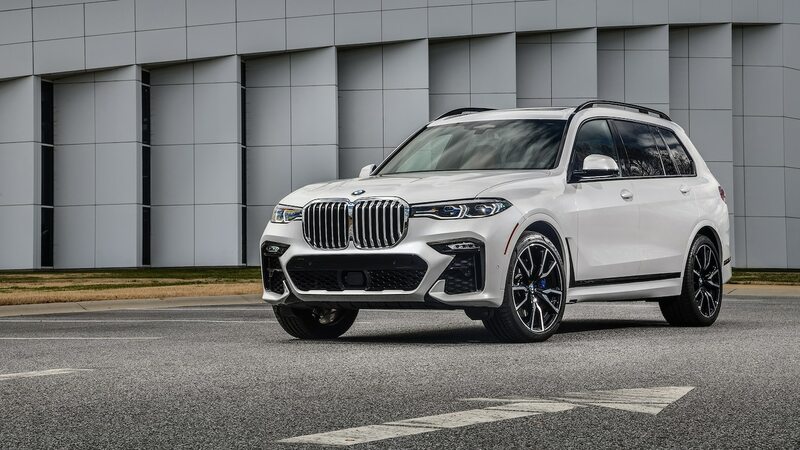 It’s just gone on sale with the xDrive40i starting at $74,895 USD including destination and the xDrive50i costing at least $93,595 USD.